That are Unpleasant to View. 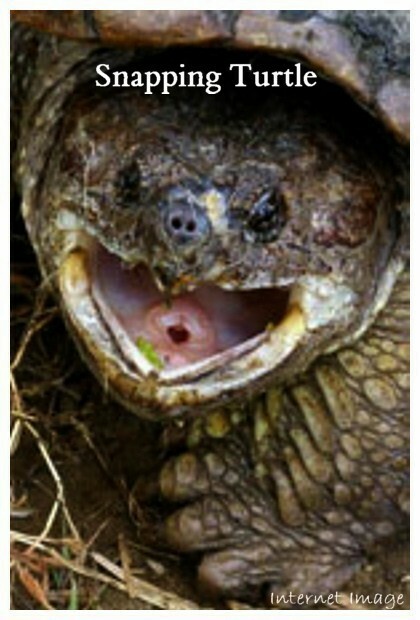 But this is What Snapping Turtles Do. 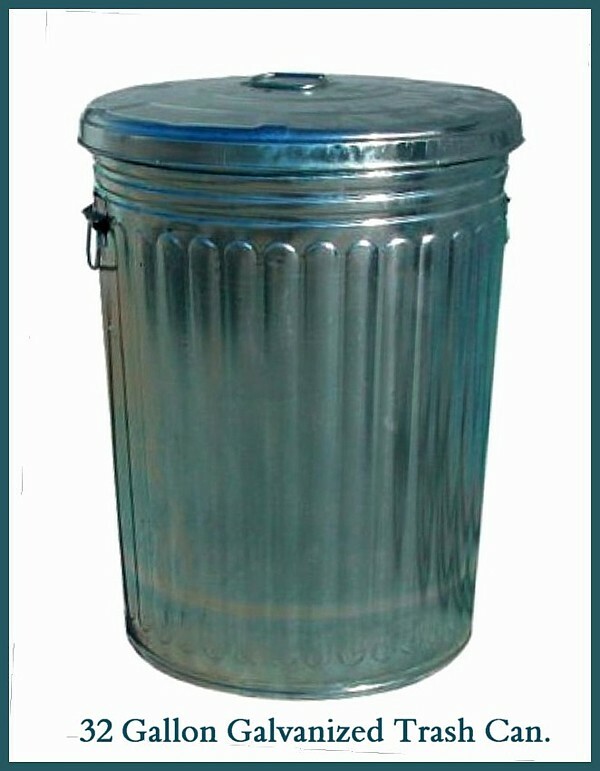 I have used Information from this Wikipedia Article in this Topic Page. If you want more info.. Read this and other Articles. 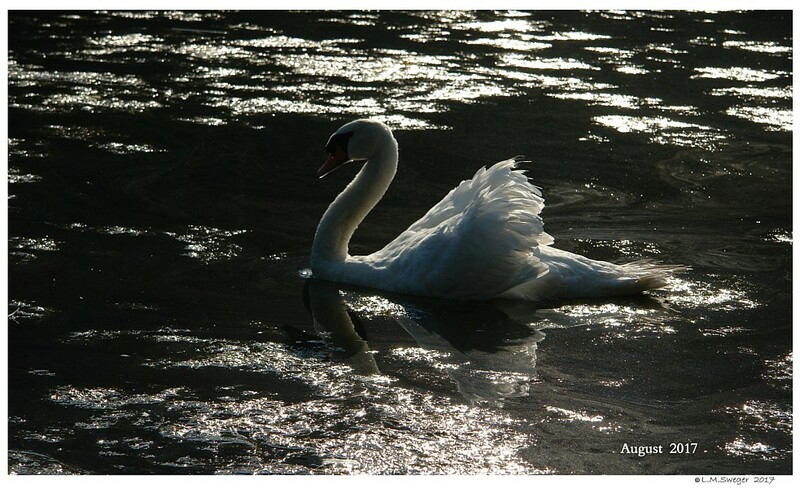 Nature has its Cruel Side..
One Animal-Bird-Fish needs to Eat another Animal-Bird-Fish to Survive. 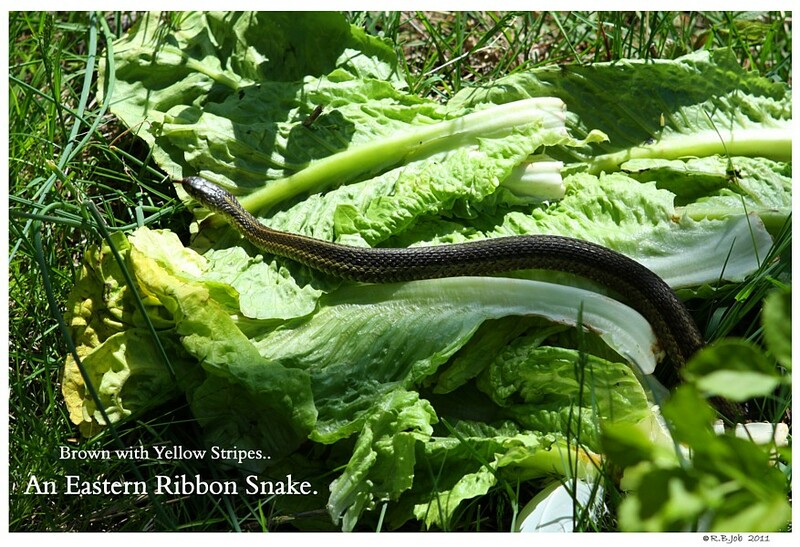 Bringing Captive Pets to our Homes, Properties and Pond..
we try to prevent losing our Chosen Pets to Predators. 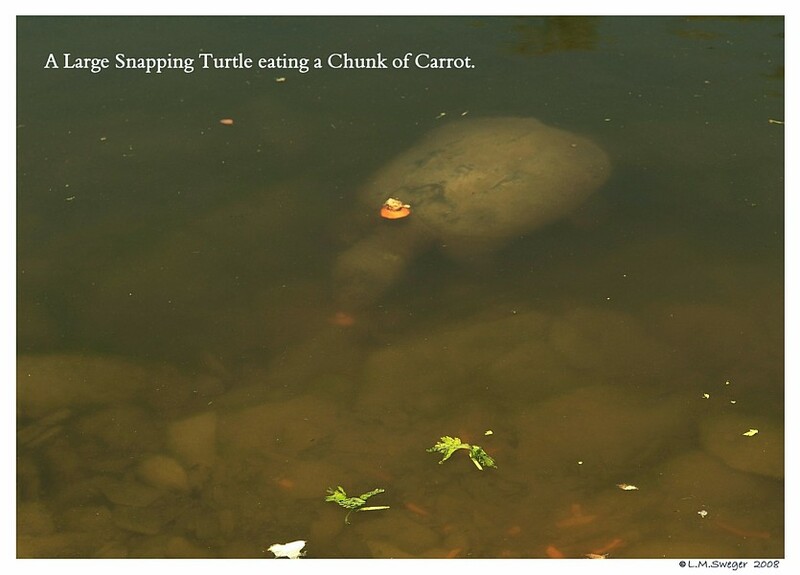 We DO have Some Control over SNAPPING Turtles.. 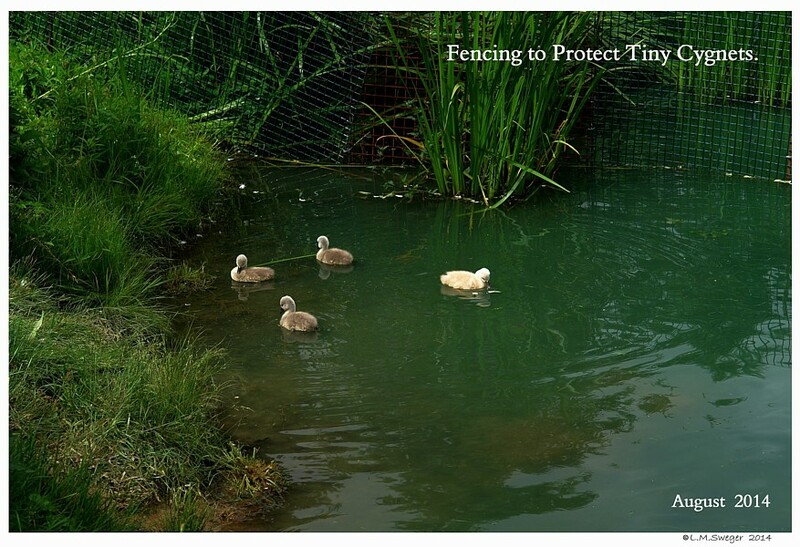 Fences are NOT going to keep them from your Ponds and Lakes. 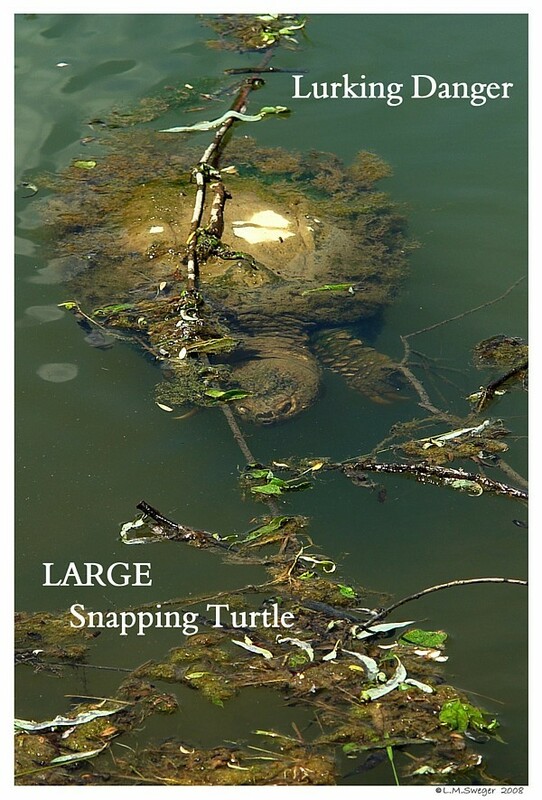 In Pennsylvania, Common Snapping Turtles are the ONLY Turtles that Folks with Domestic Waterfowl need to be Concerned with..
Snappers are a Major Predators of Young and Adult Waterfowl..
All other PA Turtles are Harmless and Beneficial to your Water Environments. 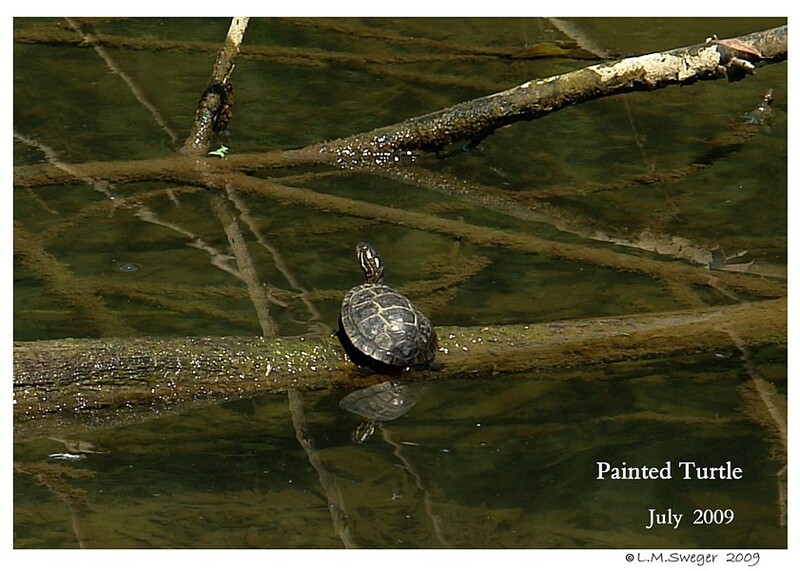 We frequently see the Painted Turtles basking and swimming shyly about. 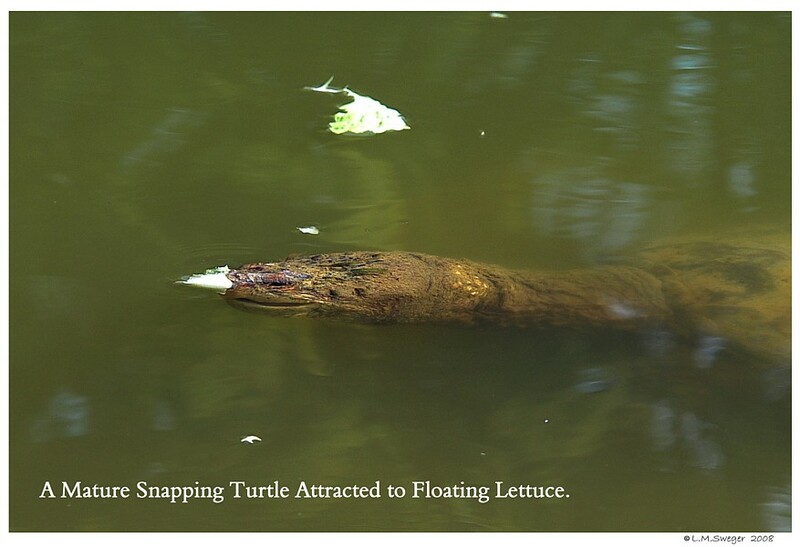 They will often surface for Chopped Lettuce.. and Floating Pellets. ****** If you Live in Some Southern States.. OH MY GOSH ! Thank Goodness we do NOT have these in Pennsylvania.. 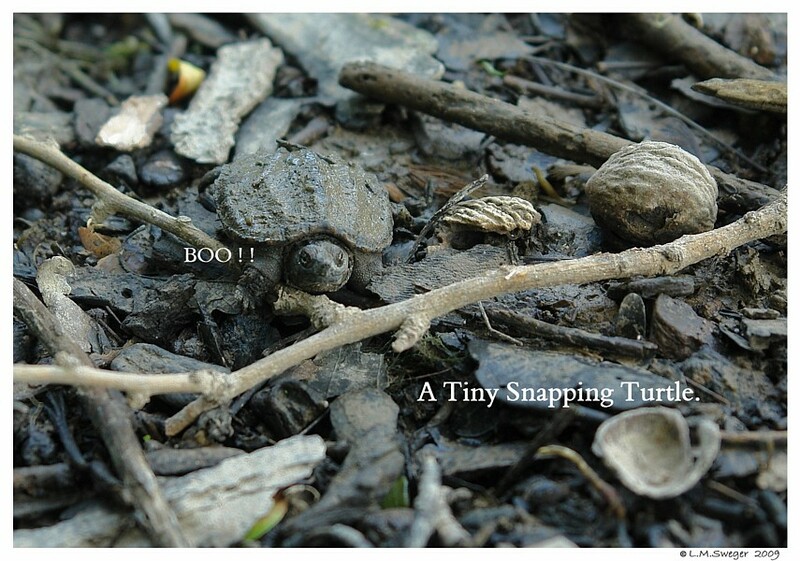 I am NOT a Fan of ANY Snapping Turtles.. 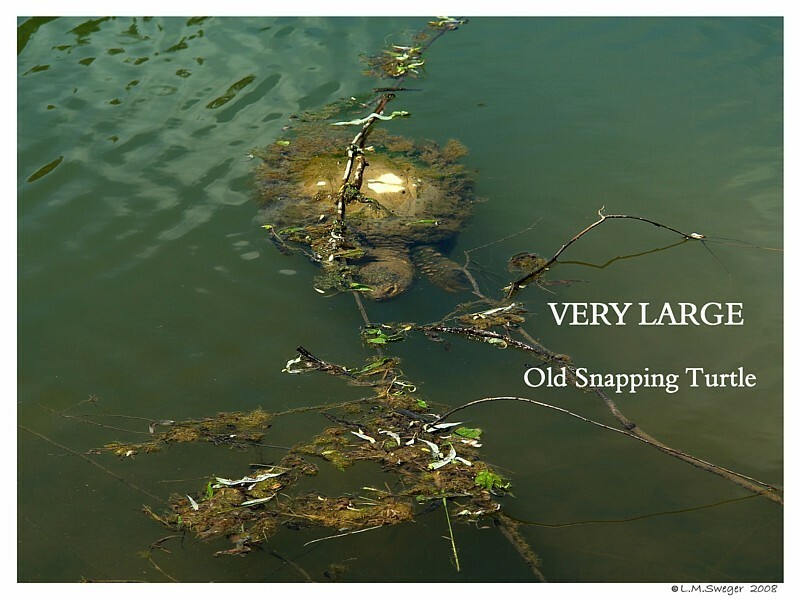 I have NO Good Words for Snapping Turtles..
We have MANY Pitiful Memories of Snapping Turtles. 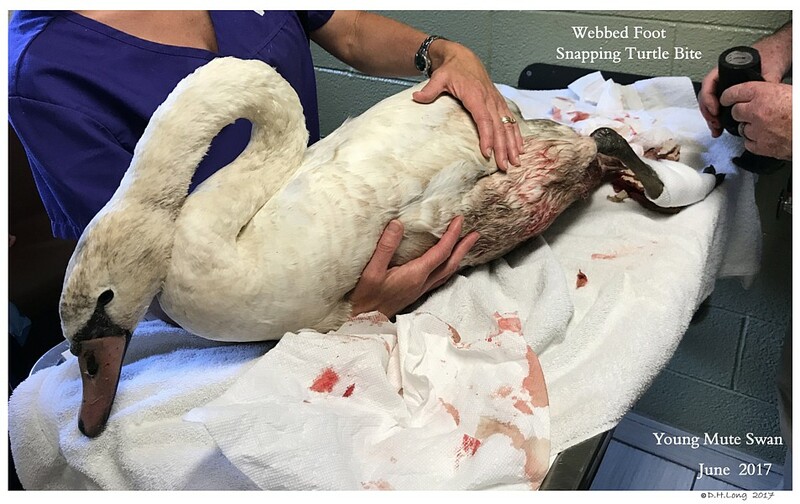 Both Times there were People READY to Help her. 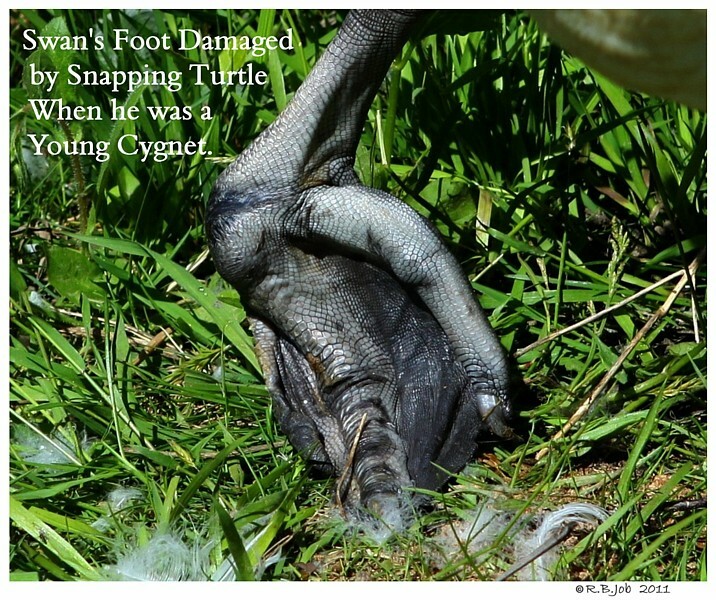 The Snappers that Bit her were REMOVED ASAP. 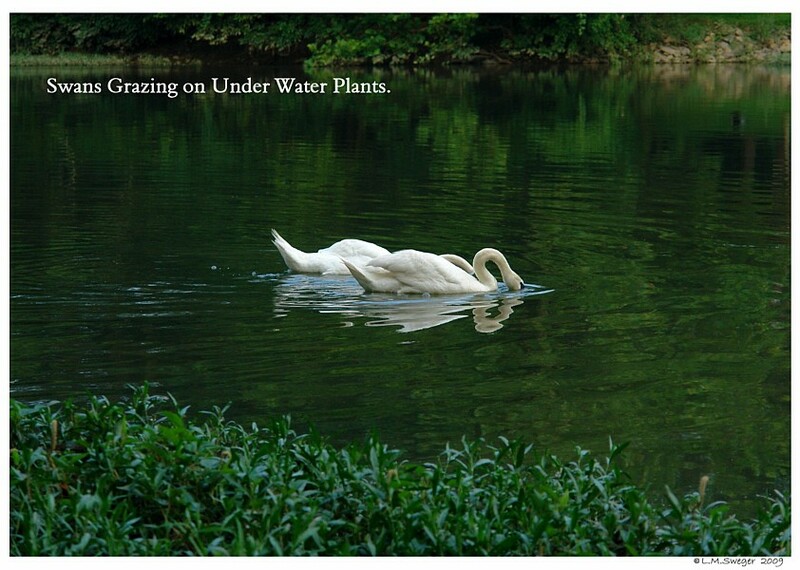 This Topic Page will not be a Pretty Picture Tour..
and Play in a Pond, Creek, Stream, Lake or River. OUCH ! 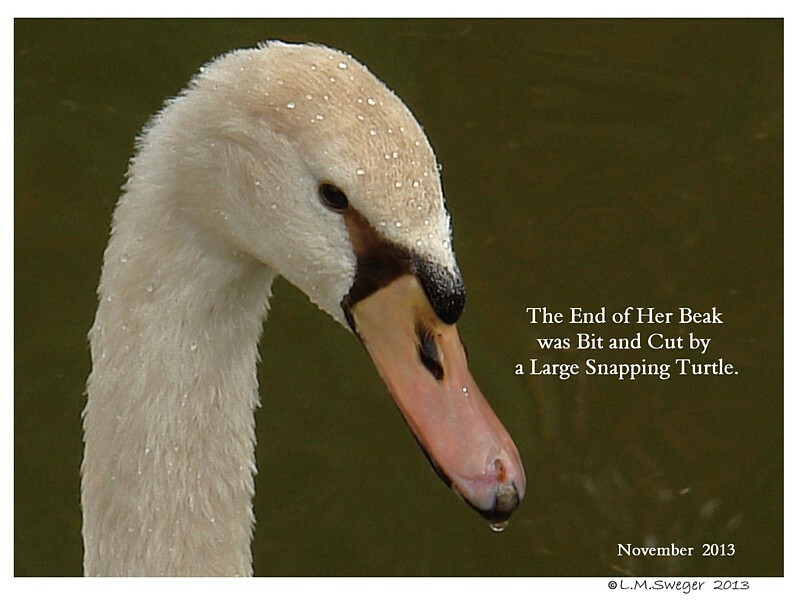 She Died before she could be Rescued. 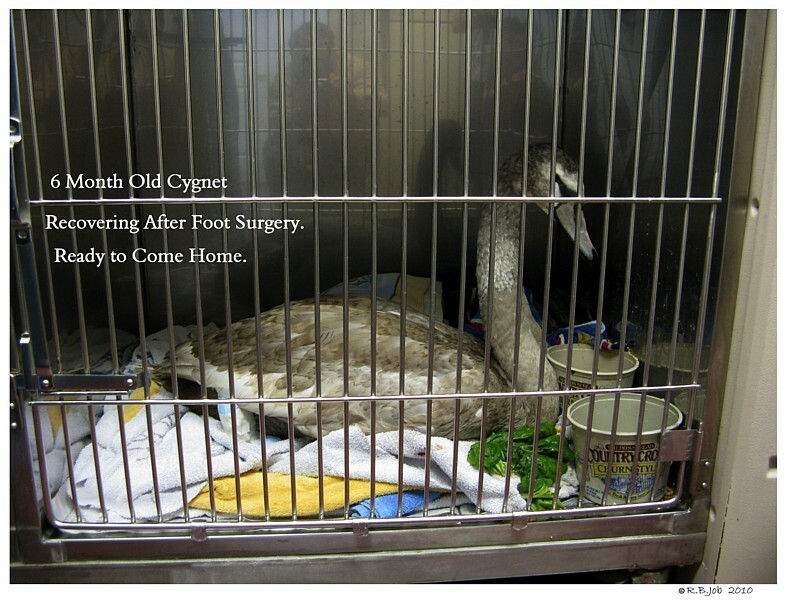 This Cygnet was Rescued around Eight Weeks Old..
She had Two Toe Claws Cut-Bit OFF.. and Torn Webbing. 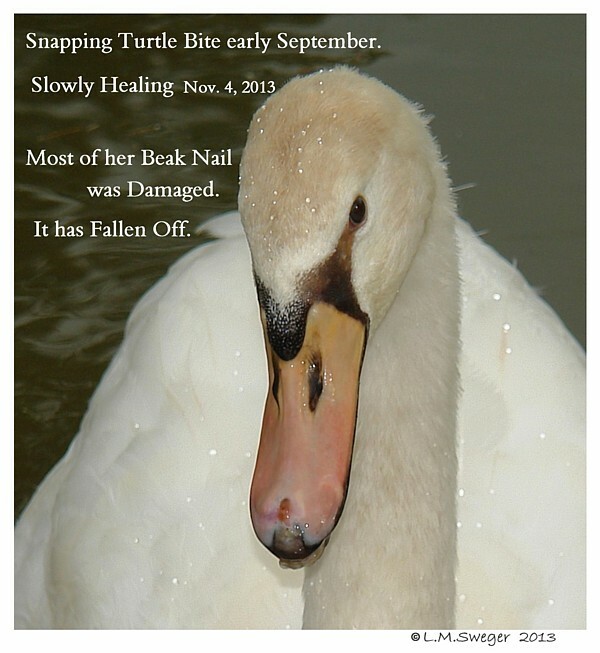 Recovery was Questionable.. She Might be Lucky..and OK. 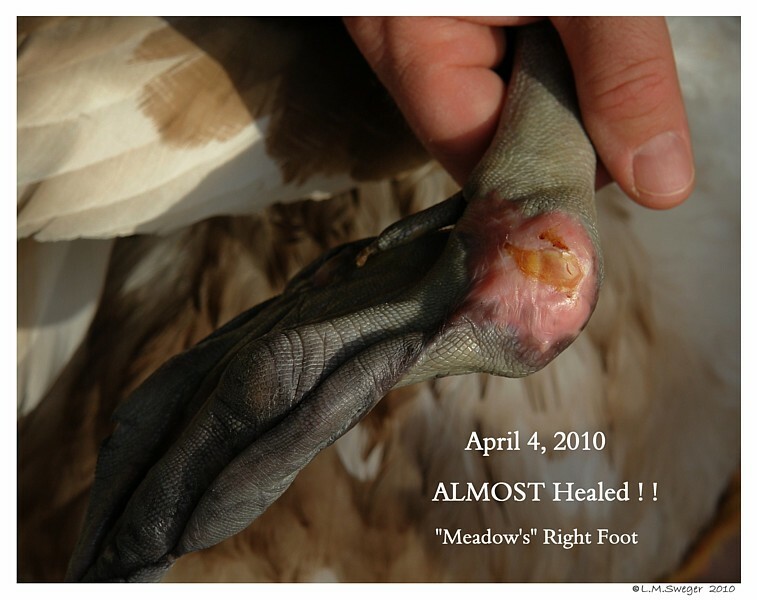 This Injured Foot will Always be a Concern. LOTs of Dedicated TLC. 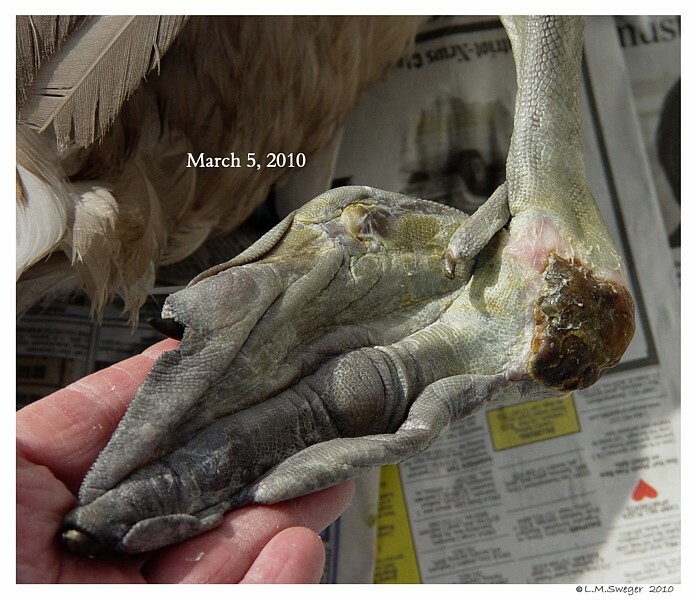 Eight Weeks Later, she has Healed Well.. and Adopted to New Home. 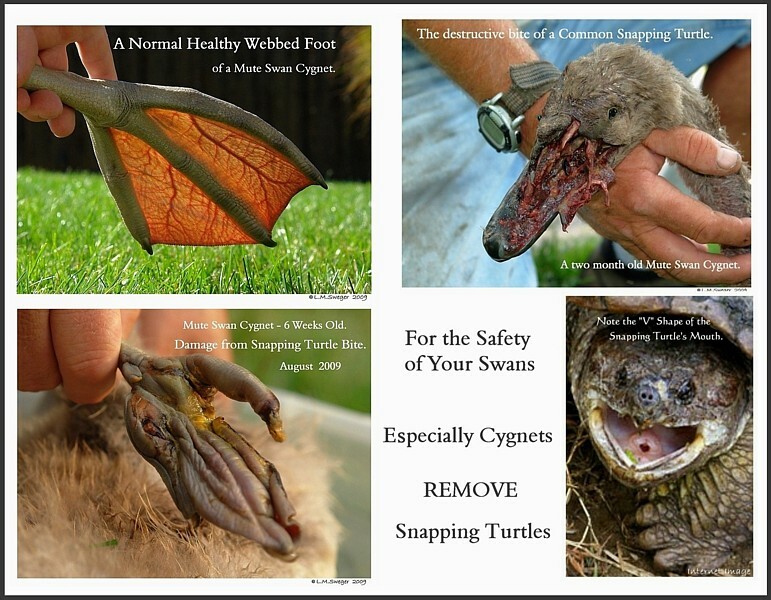 SNAPPING TURTLEs.. BEST to Remove all you Find.. I am NOT making any Suggestion on what you do with them. 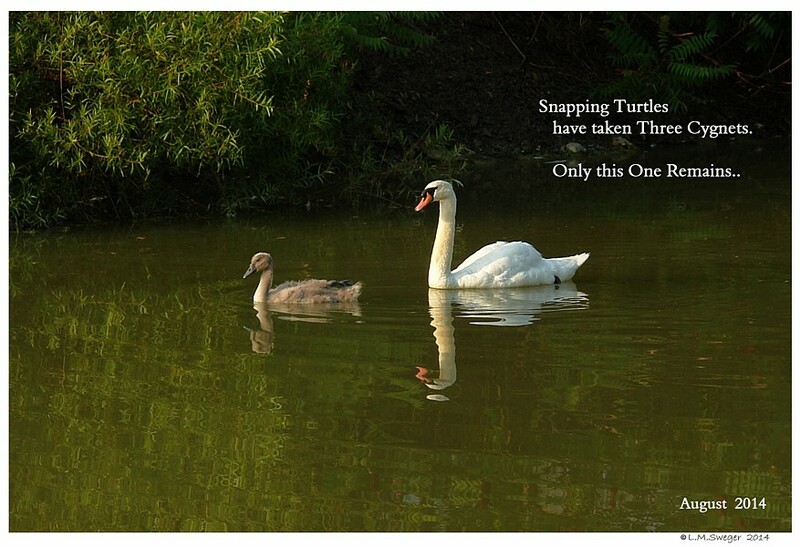 Death to smaller Ducklings, Goslings and Cygnets. 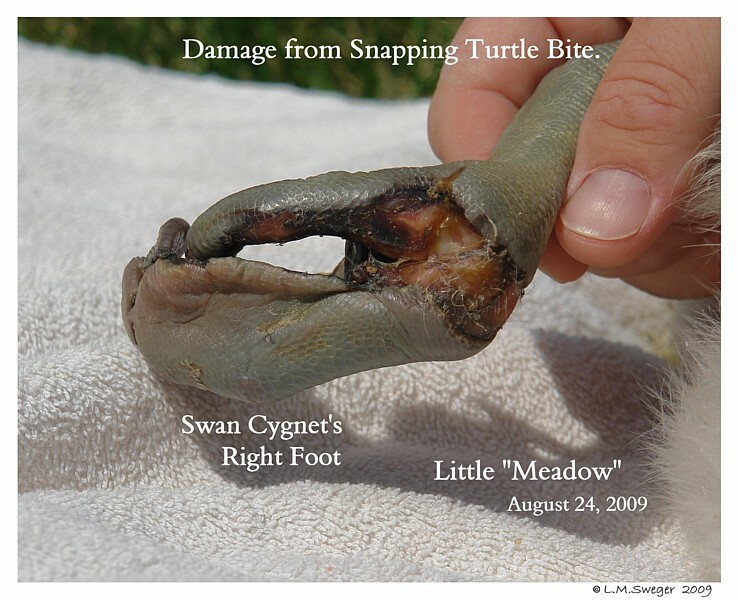 Snapping Turtles will BITE Feet and Faces of Waterfowl. 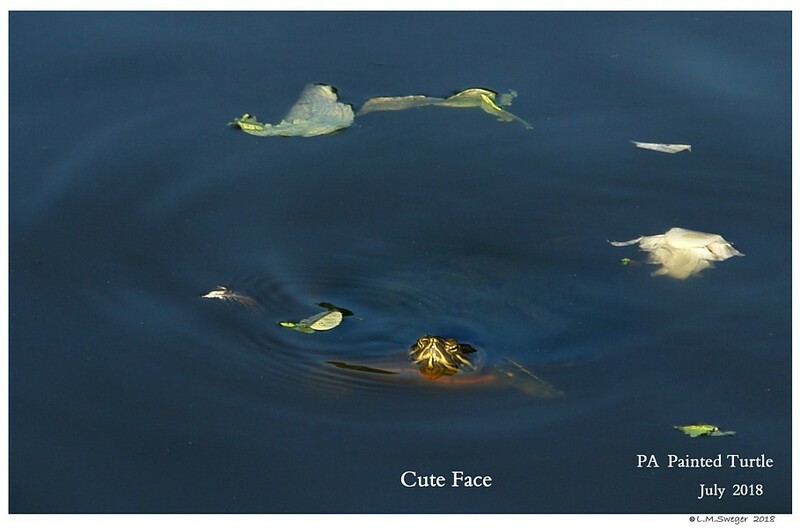 These Turtles quickly learn where you are feeding your Waterfowl.. 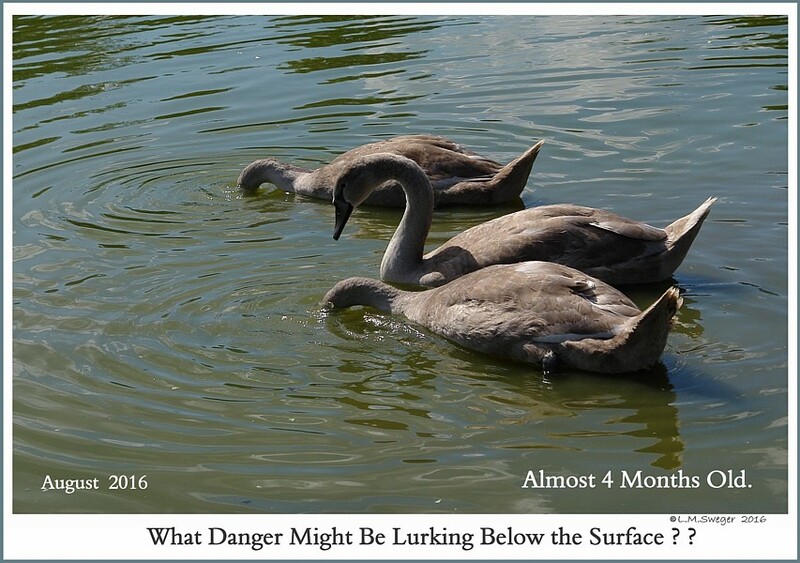 They will lurk close-by.. waiting for Leftover-Spillage. 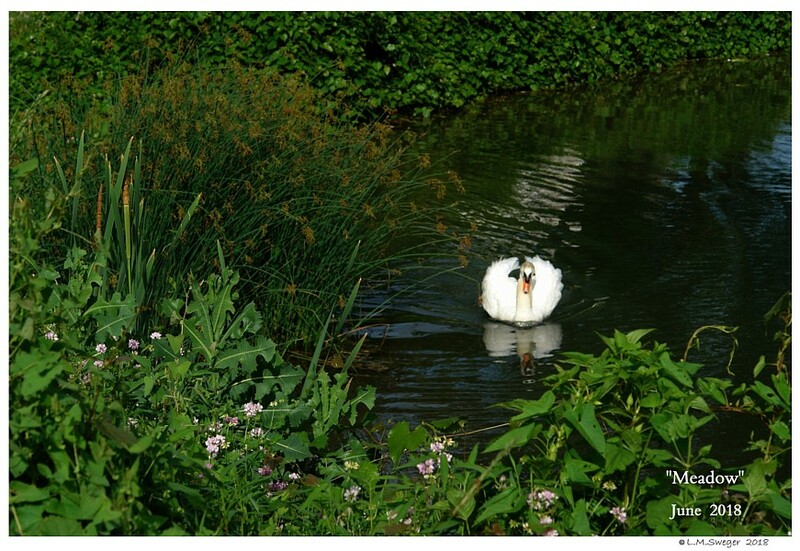 Do not Feed where Plants will create a hiding Spot. 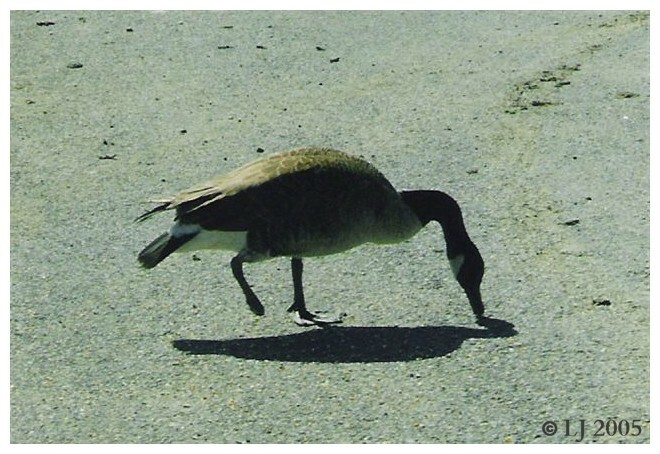 Scavenging for Food. 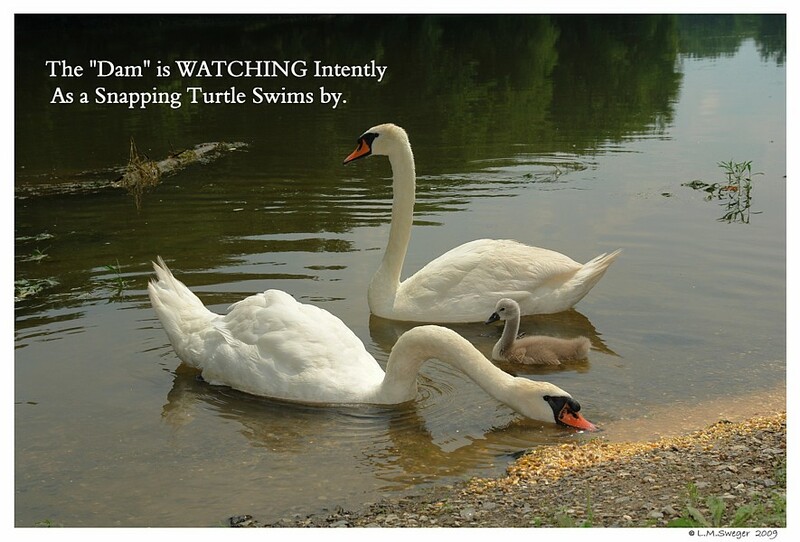 They may Bask out of Water. 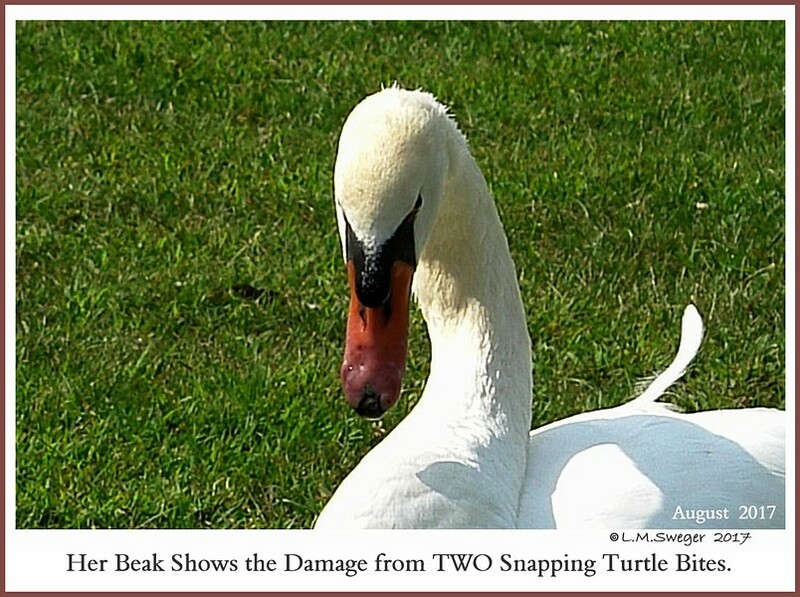 with just their Snout and top of their Carapace Exposed. 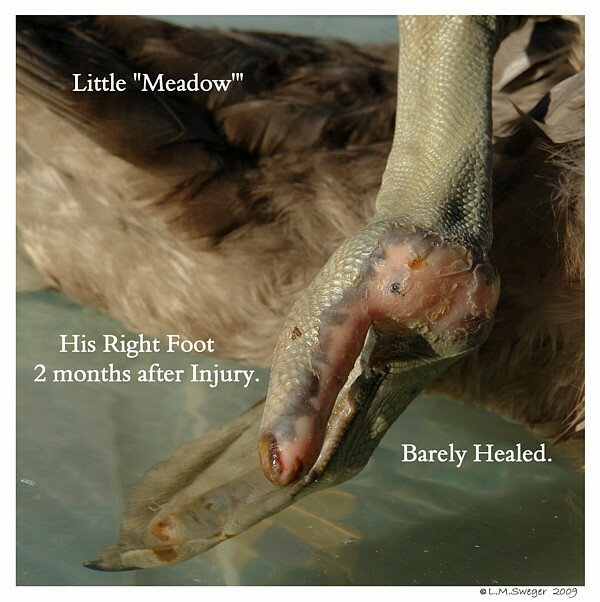 The HARM they do to our Wild and Domestic Waterfowl is DREADFUL.. 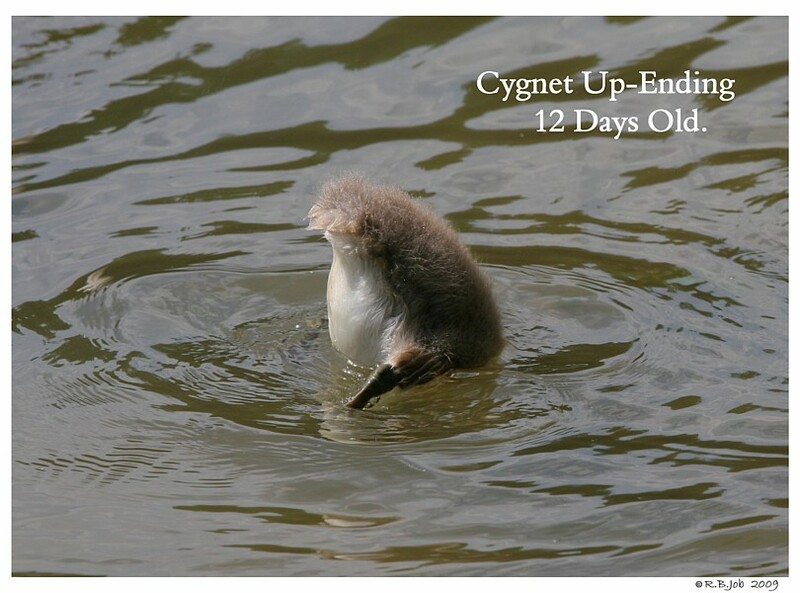 This Young Cygnet did Survive with Months of Daily Care. 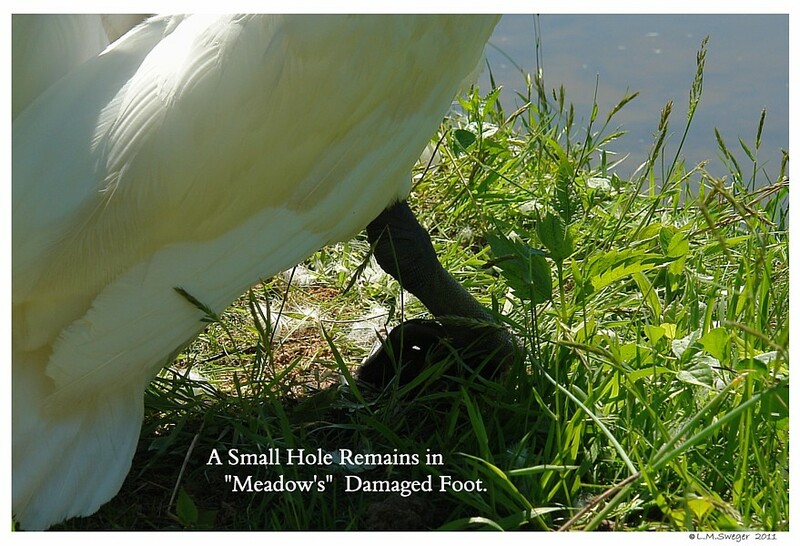 This Young Feral Swan was not so Lucky. 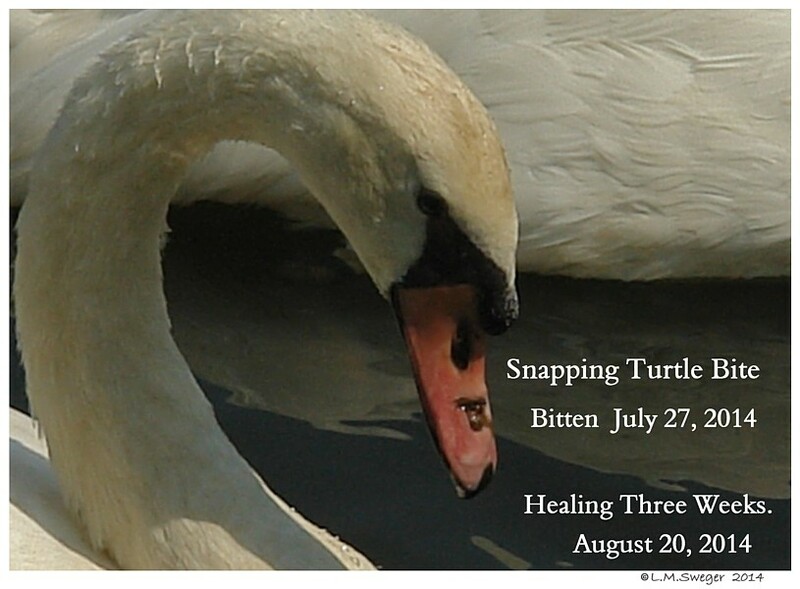 I have Images and Images of Swans Bitten by Snapping Turtles..
Once Bitten it is a Difficult Process to help your Pet Waterfowl. 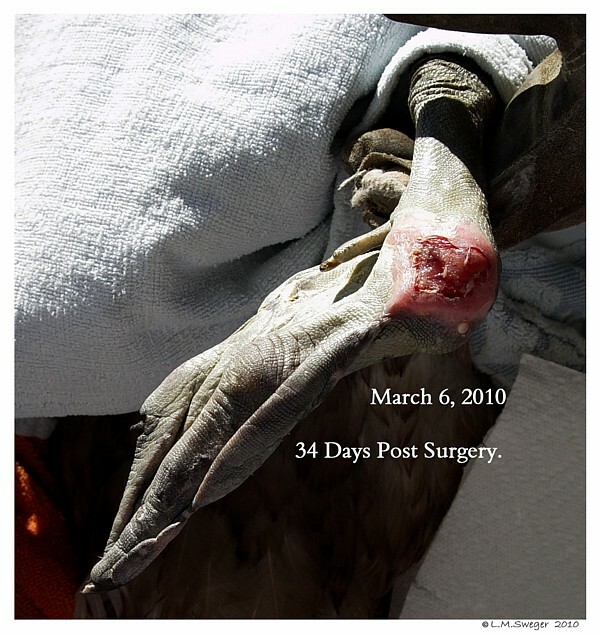 Her Leg and Foot were Infected and FULL of Maggots. A Mess. 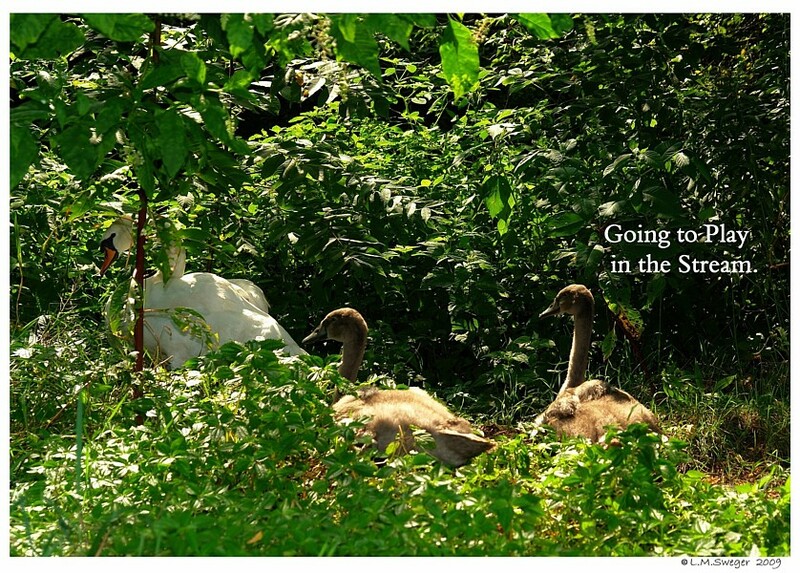 These Young Swans could not be Saved.. 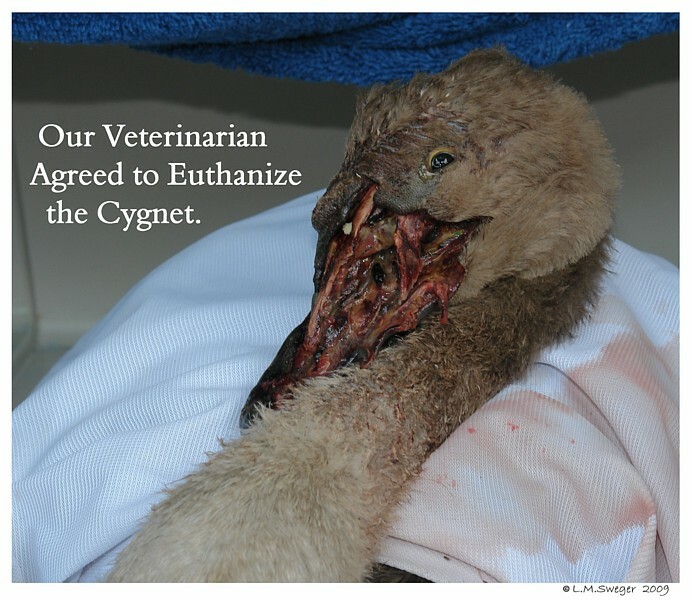 BOTH Euthanized. 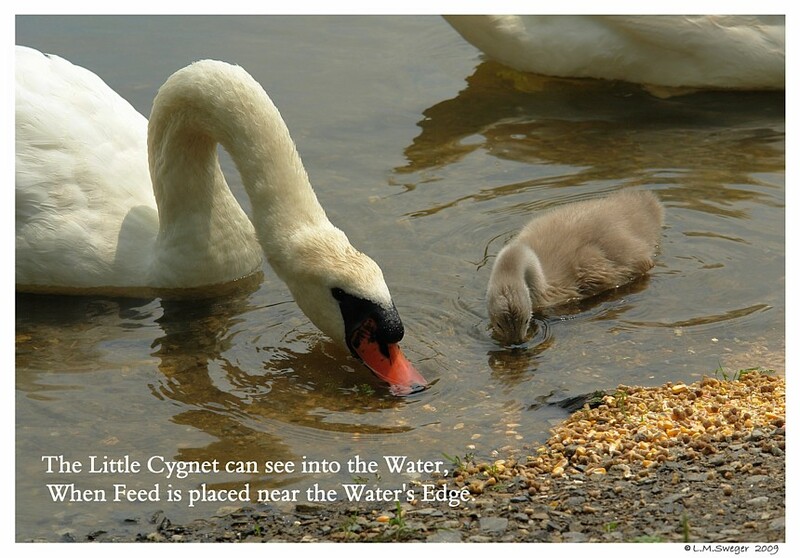 This Little One would not be able to Eat or See… Tragic End. We have had TOO many Sad Experiences. 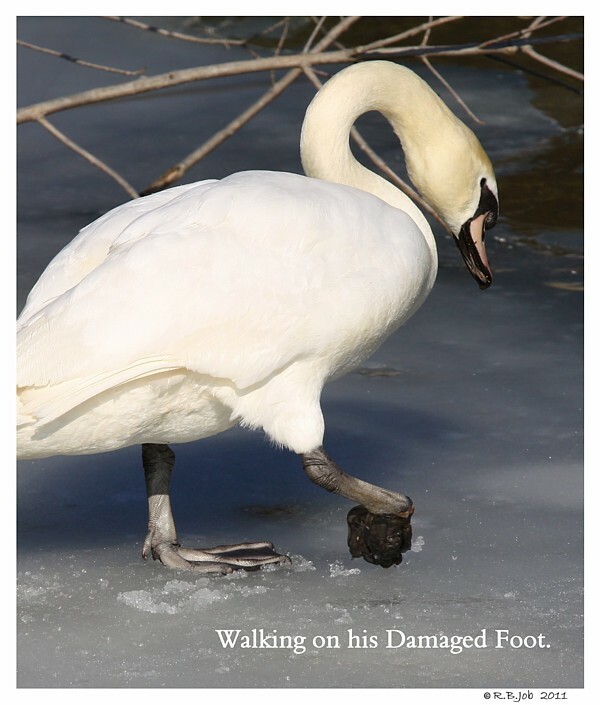 Too many Permanently Disabled Birds. 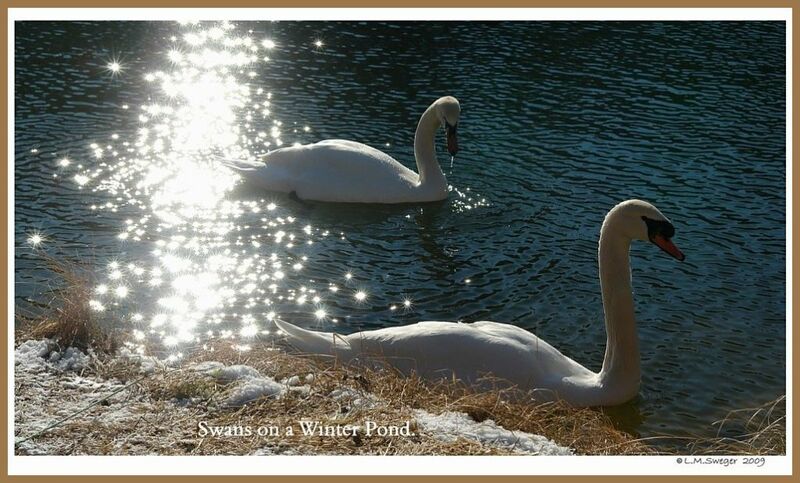 but, the Pond Swans, Ducks and Geese take Priority. 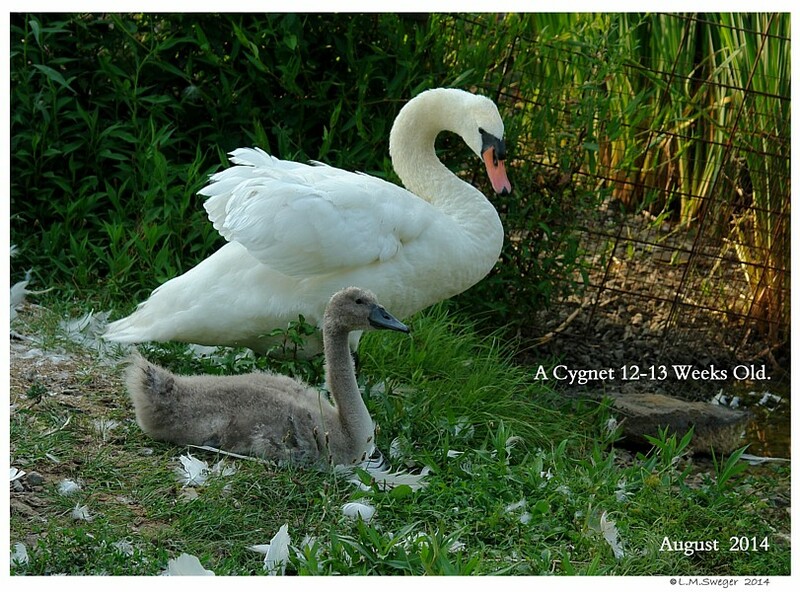 This Breeding Swan Pair started with four Cygnets.. This was the Last One.. So Sad. We offered to take it to a Safe Place.. 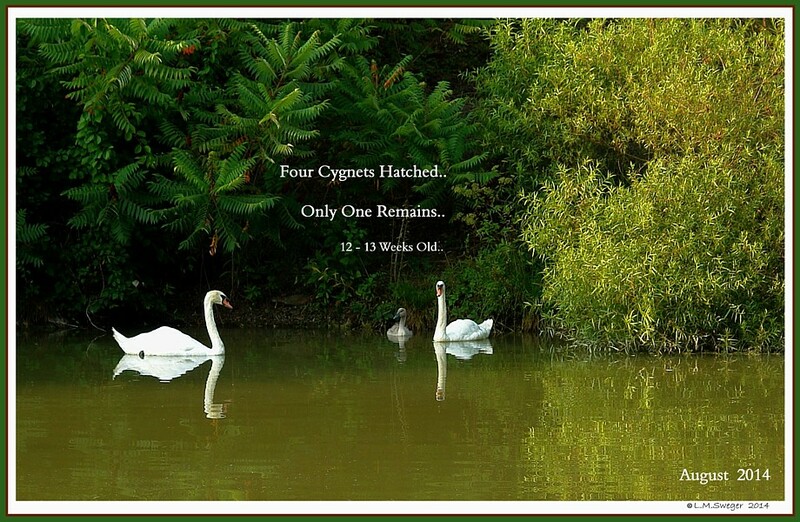 He Sells any Cygnets that Survive until Fall. 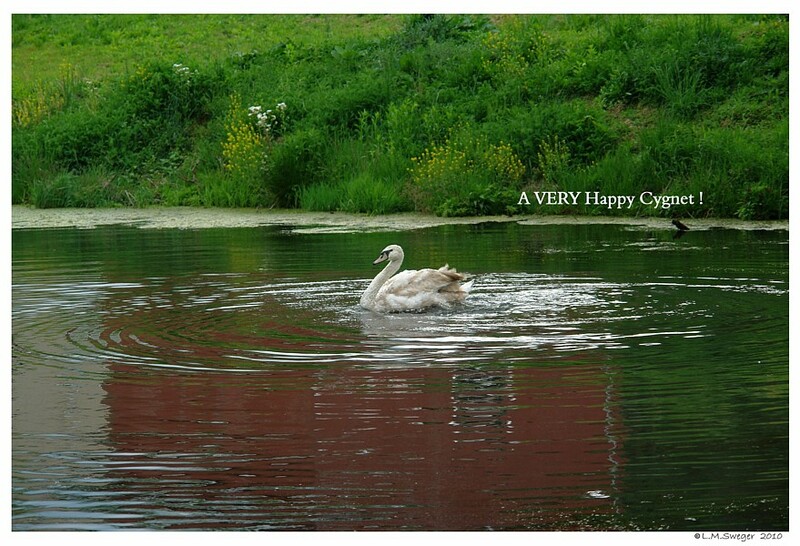 I left this Roadside Pond with a very Heavy Heart. 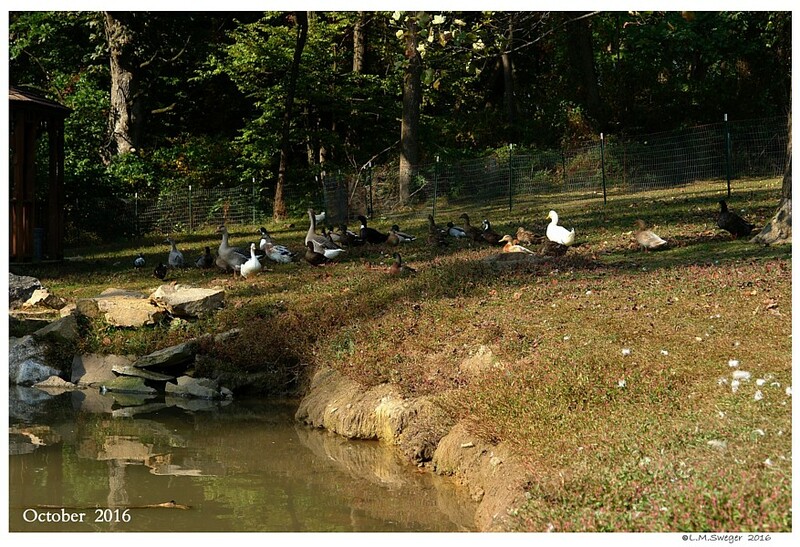 This Pond is along the Road. 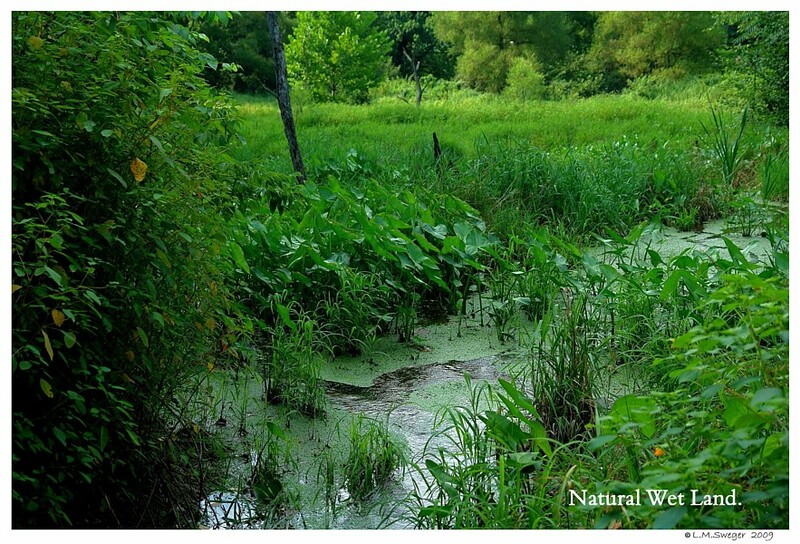 People bring Snapping Turtles here and ADD them to this Small Pond. 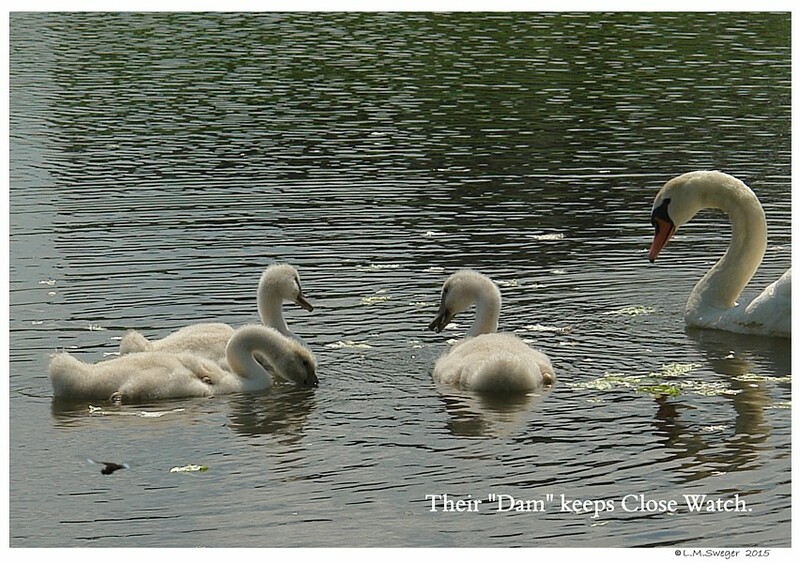 This Dam Started with Six Cygnets. 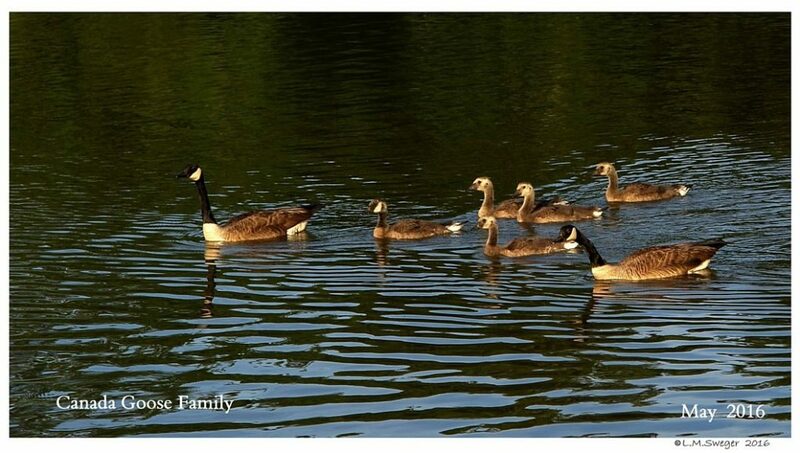 If you lose a Waterfowl Pet or one of their Young.. Be Suspicious. ??? ???? 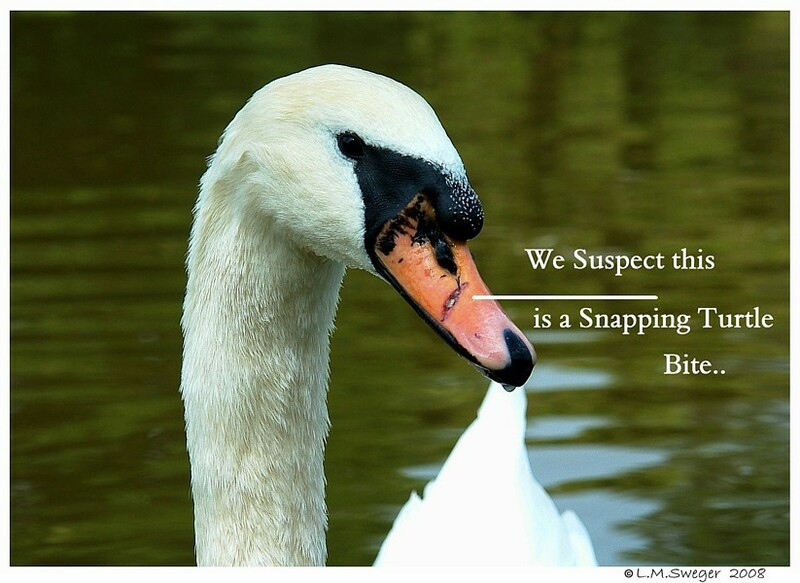 Snappers or Hawks or Owls or Blue Herons, etc. 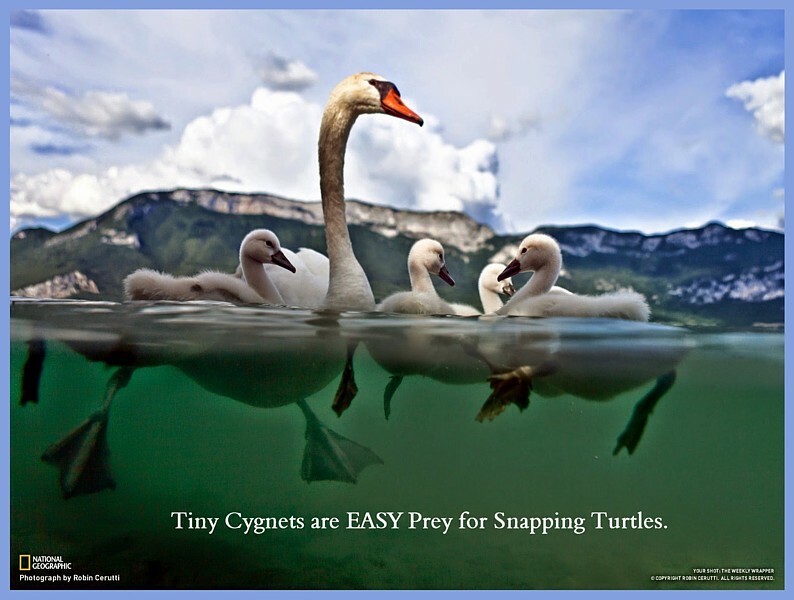 You can do Something about the Snappers..
the others mentioned are more Difficult to Protect from. 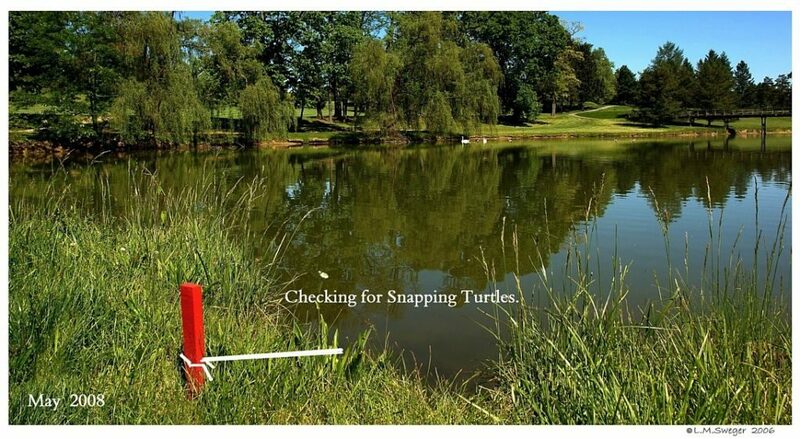 Check and WATCH for Snappers along your Pond Edges. 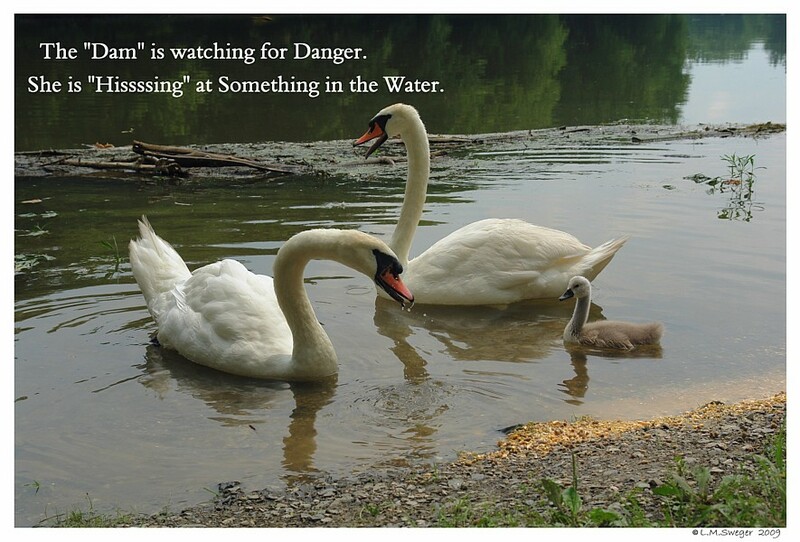 Check around… they may be trying to warn you.. 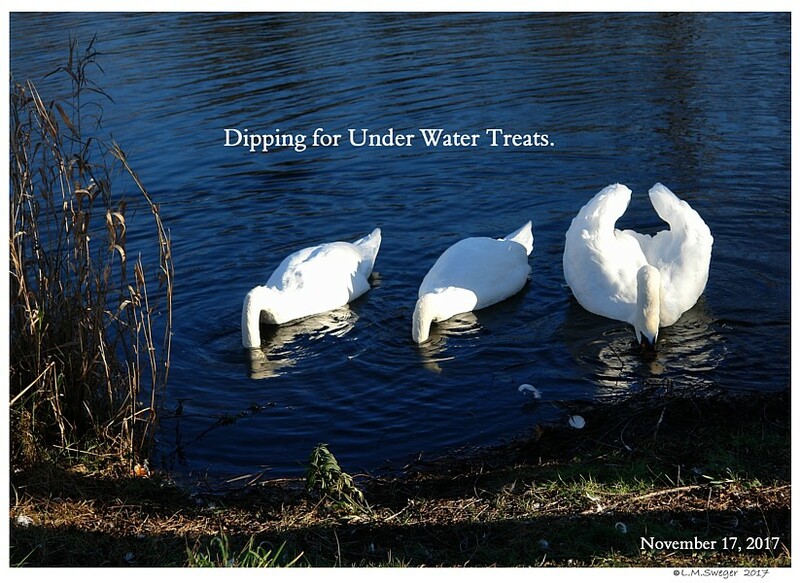 Put Food and Treats in Clear, Shallow Water. At Least they have a Chance of NOT being Bitten in the Face. 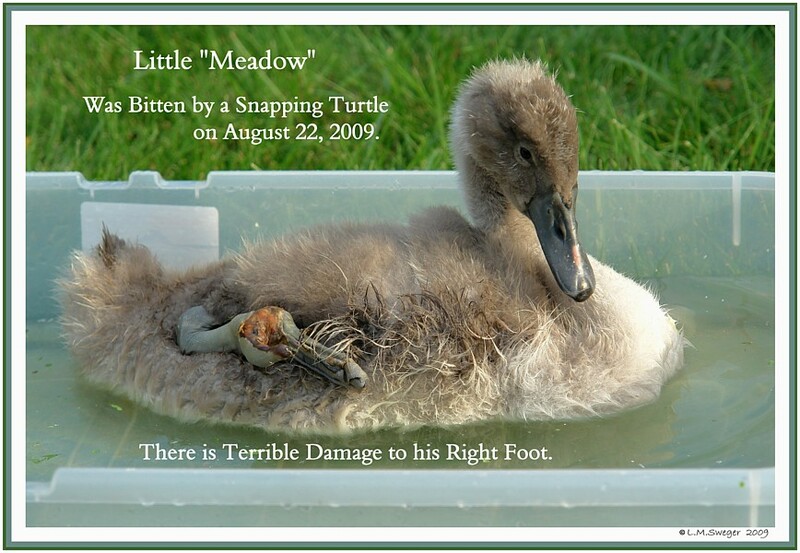 Snapping Turtles are an unwelcome Problem in many Areas. She would Catch the Snappers from their local Creek. 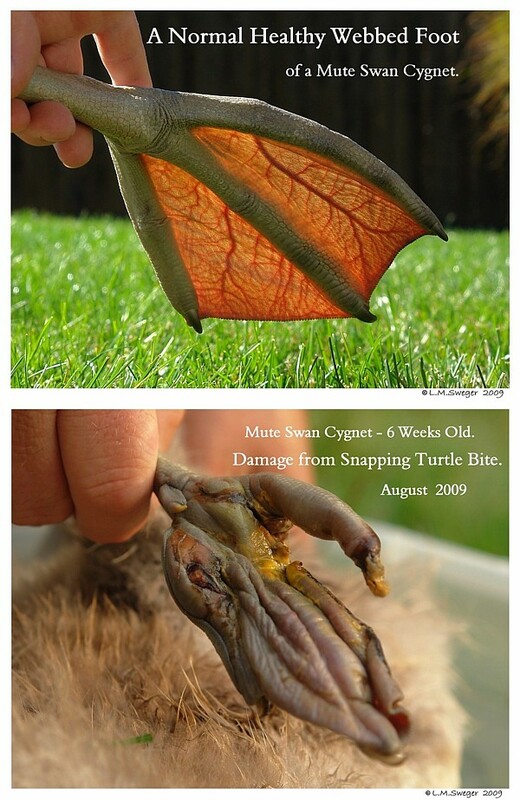 Sell them to Folks who would make Turtle Soup. 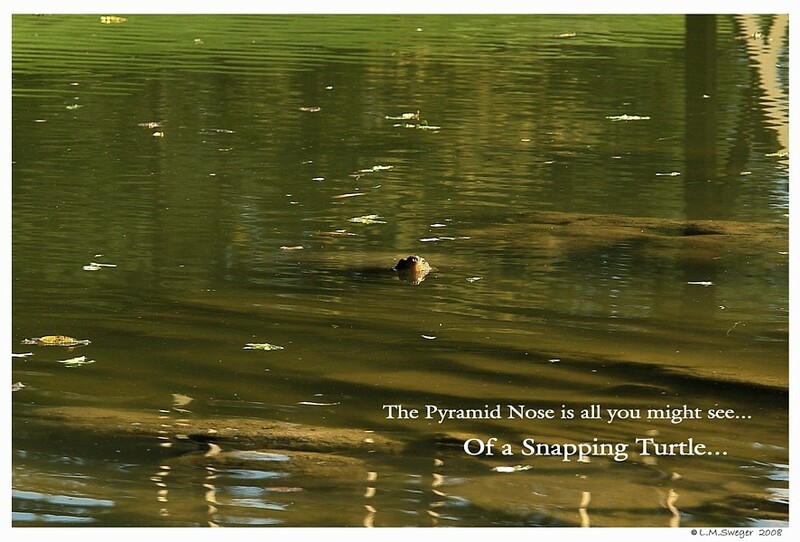 The Bigger the Snapper the more she was Paid. Times have Changed.. 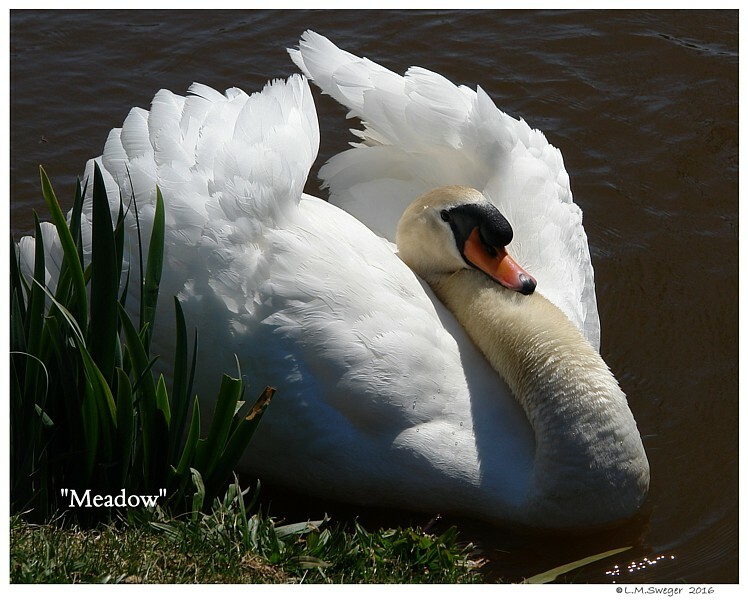 Fewer are Harvested for a Soup Ingredient. 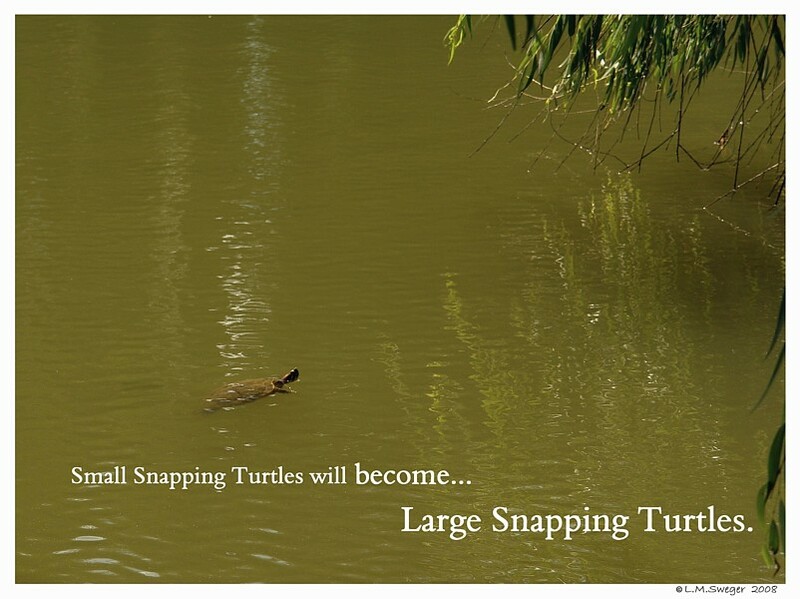 There has been an EXPLOSION of Snapping Turtles ALL Over.. 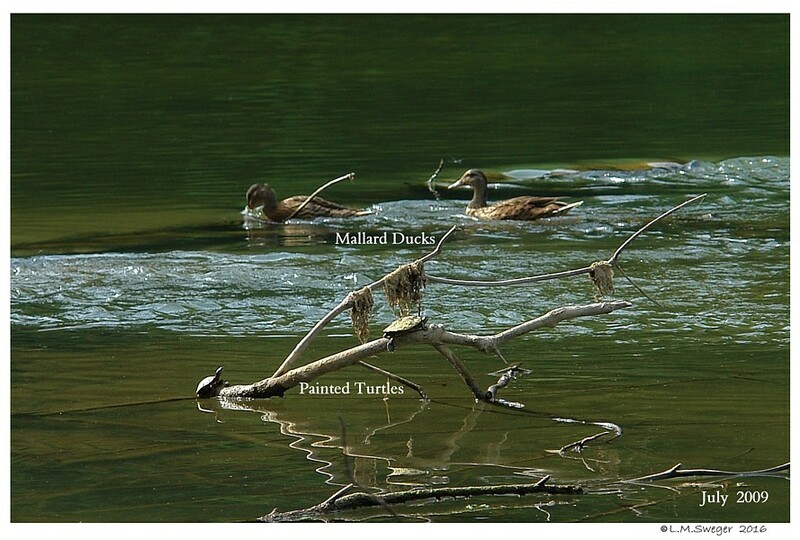 In their Environment, Snapping Turtles are at the top of the Food Chain. 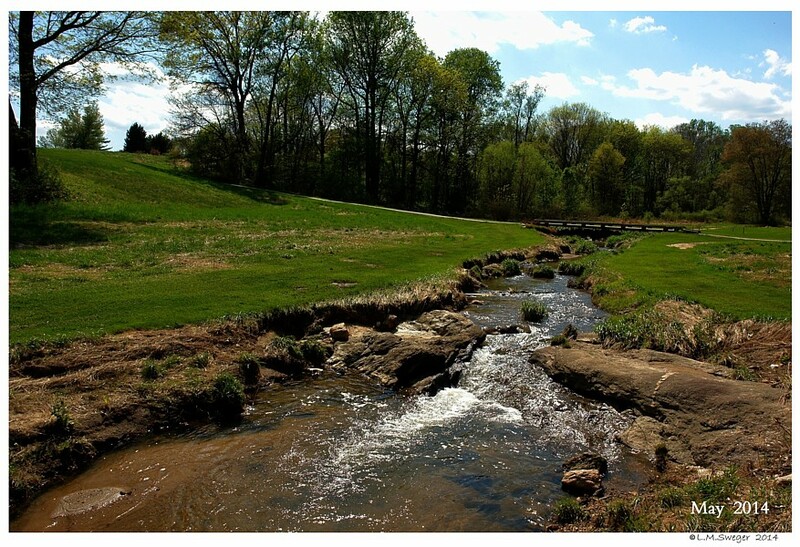 Common Snapper Habitats are Shallow Ponds, Creeks or Streams. 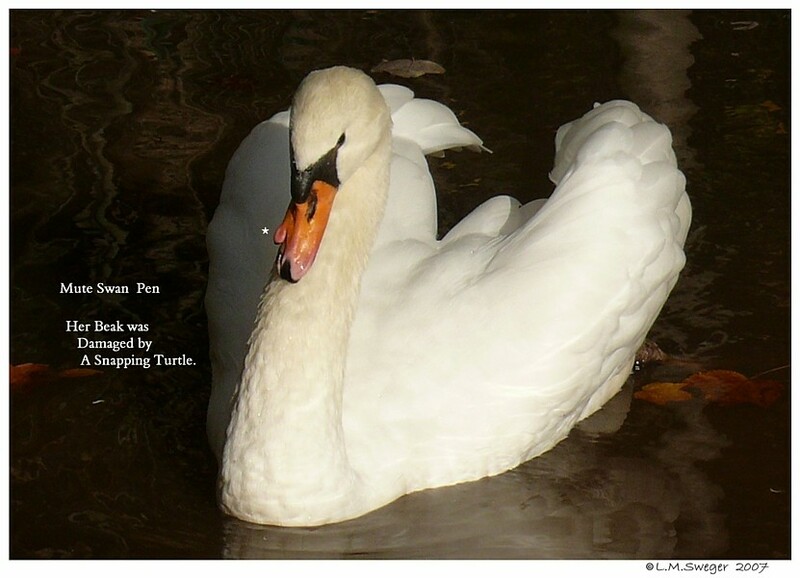 They are often seen Basking along the Banks, sometimes on Fallen Logs. 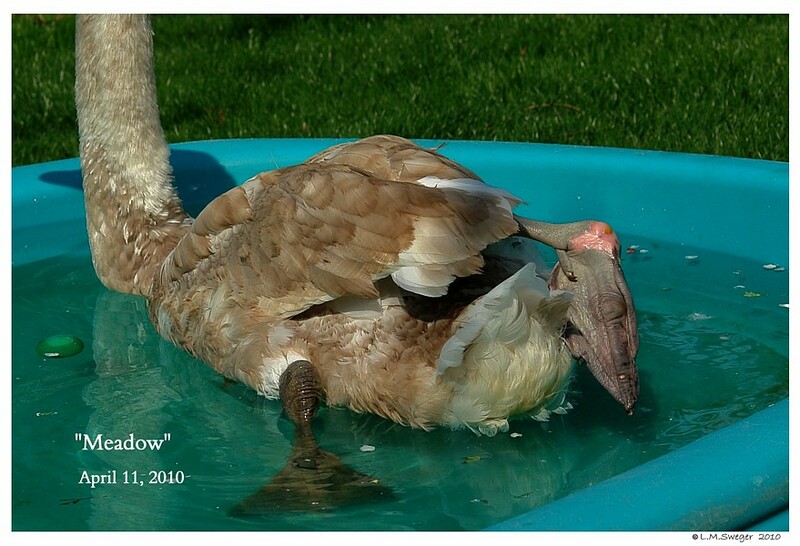 They lay in Shallow Muddy Water with only their Nose or Head Exposed. 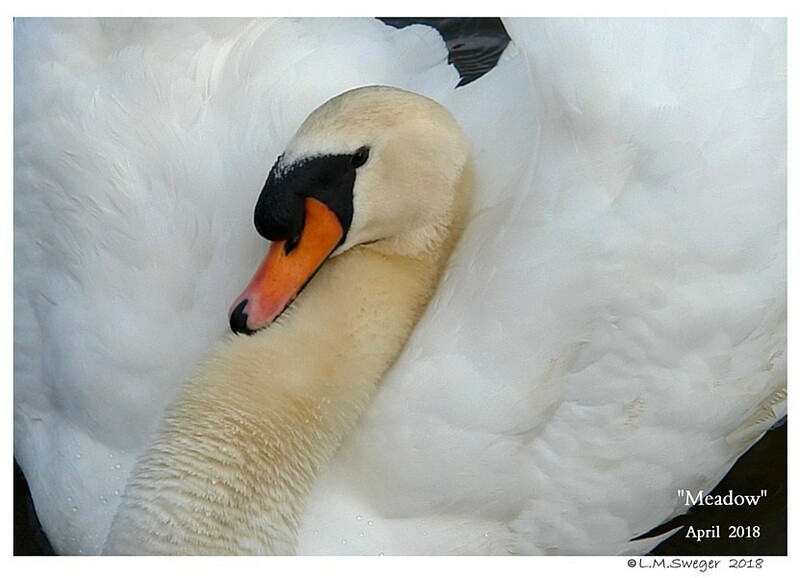 Their Nostrils are positioned on the very Tip of their Snout. 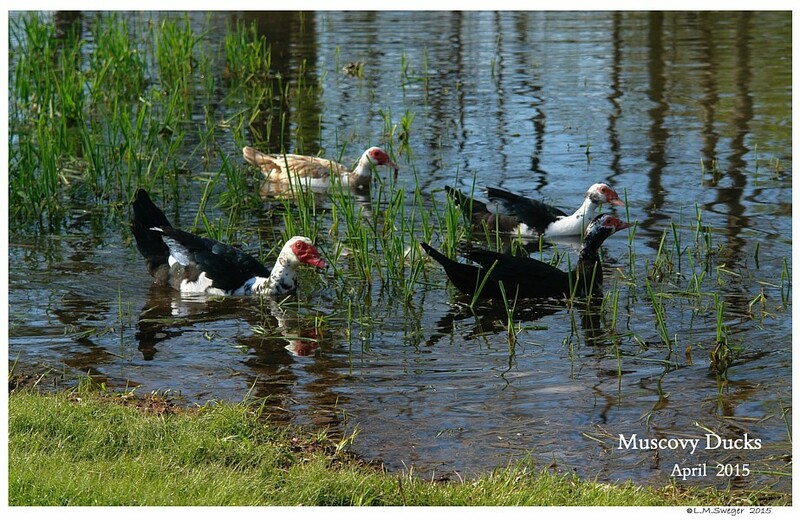 They consume lots of Aquatic Vegetation. Basically, anything they can get in their Mouths. 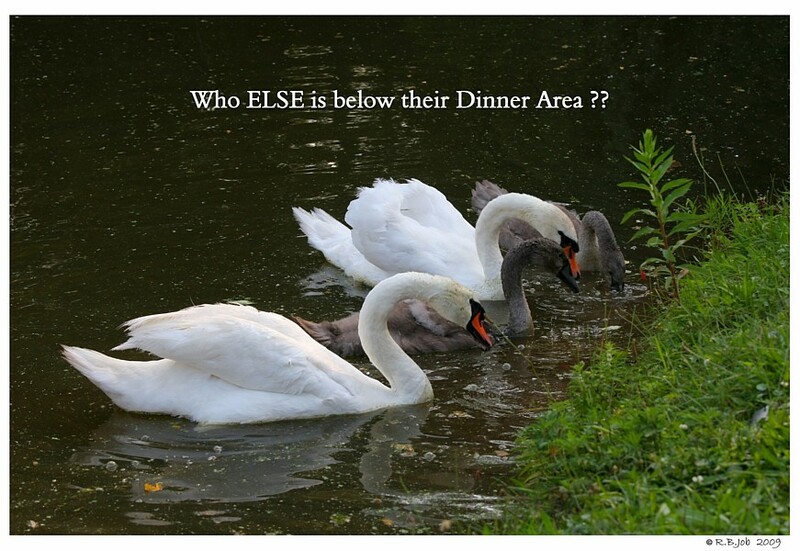 They are efficient Aquatic Scavengers. 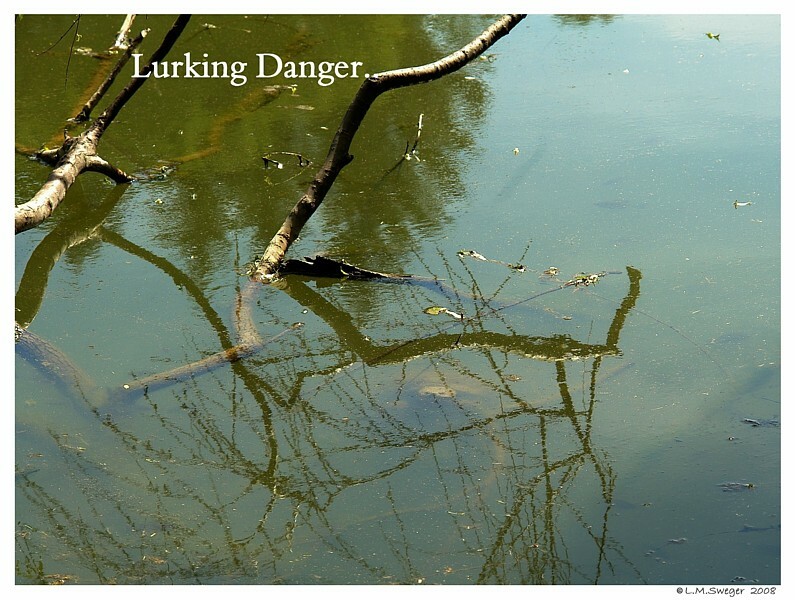 They are Ambush Hunters of Aquatic or Semiaquatic Birds and small Mammals. 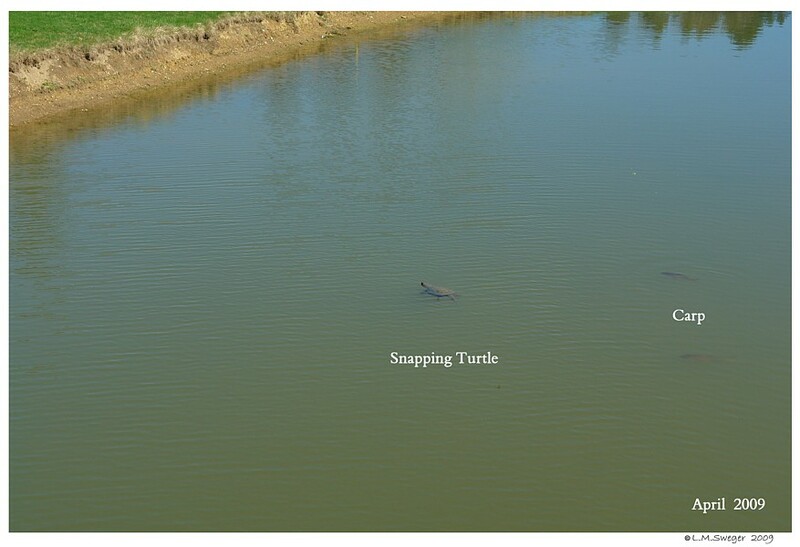 Snapping Turtles Mate from April through November. 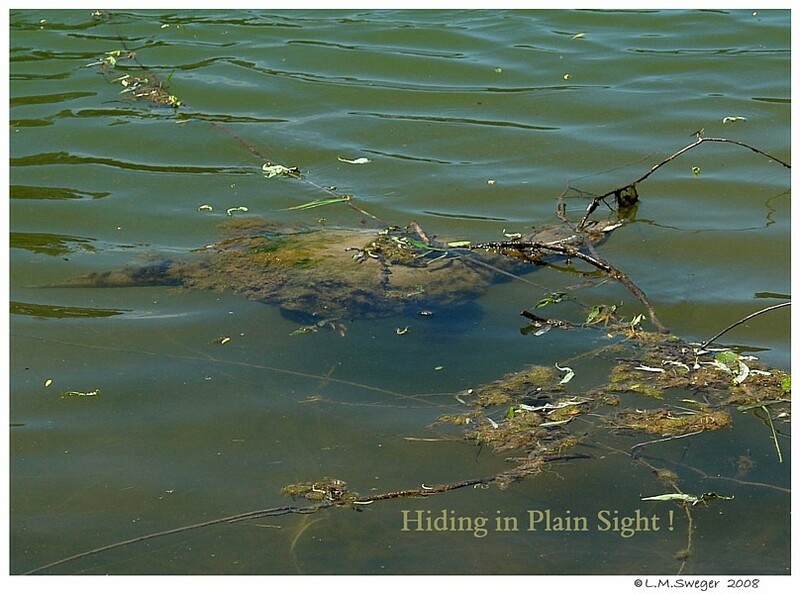 These Turtles come out on Land to Court, making them more visible in the Spring. 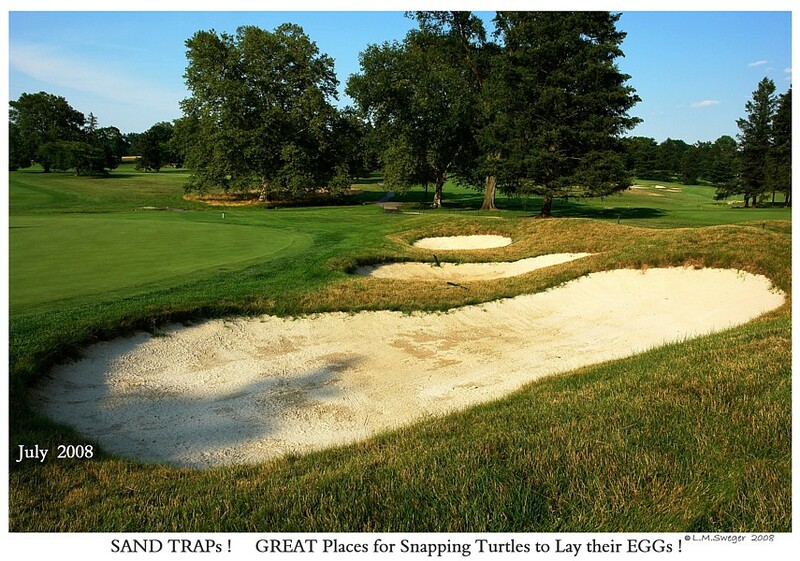 Snapping Turtles travel extensively over Land to reach new Habitats or to lay their Eggs. 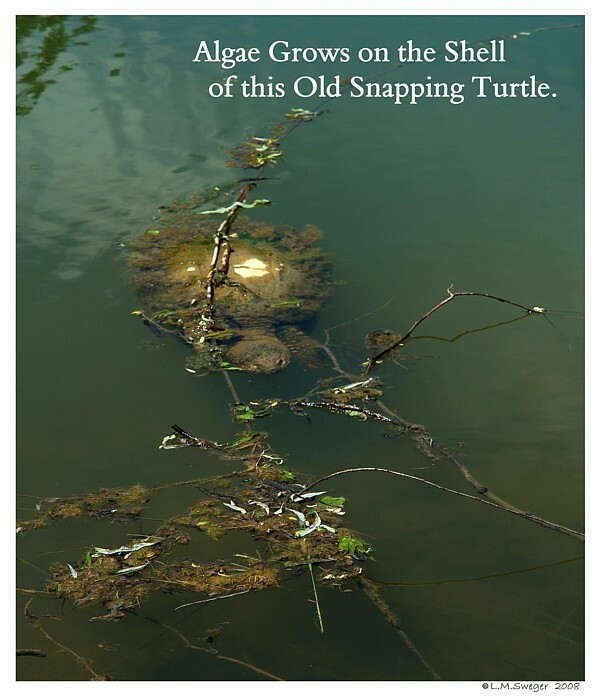 You may not have any Snapping Turtles in Early Spring..
but, this Roving Behavior may introduce a New Snapper to your Pond. 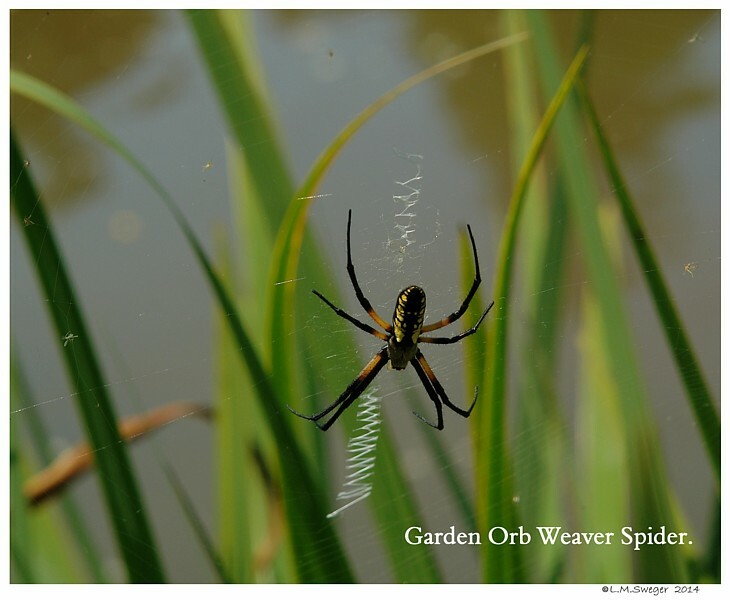 Watch for them floating in your Pond. Fences do not Stop them.. 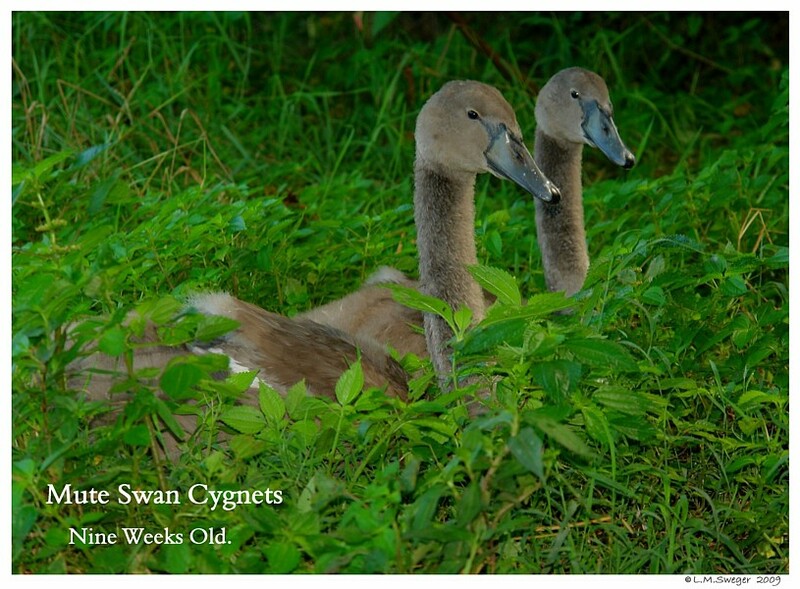 The Cygnets above were ALL Eaten by a BIG OLD Snapping Turtle on a Friday Morning while the Family was away at Market. 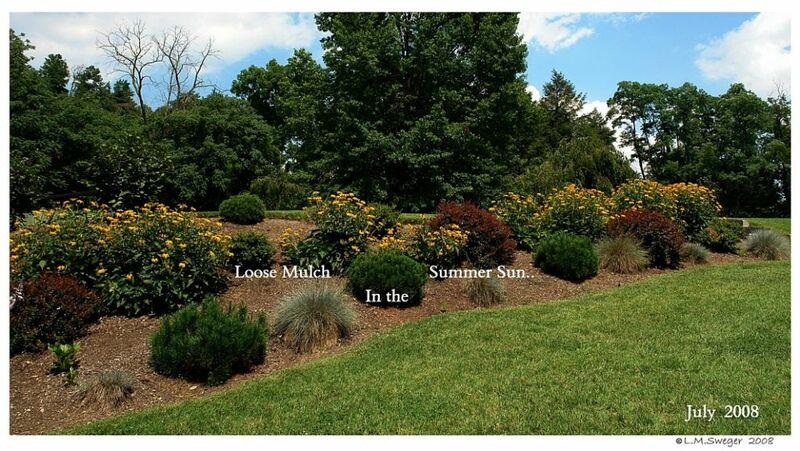 Peak Turtle Egg Laying is May, June into July..
Soft Mulch or Sandy Soil to lay their average of 30 to 50 Eggs. 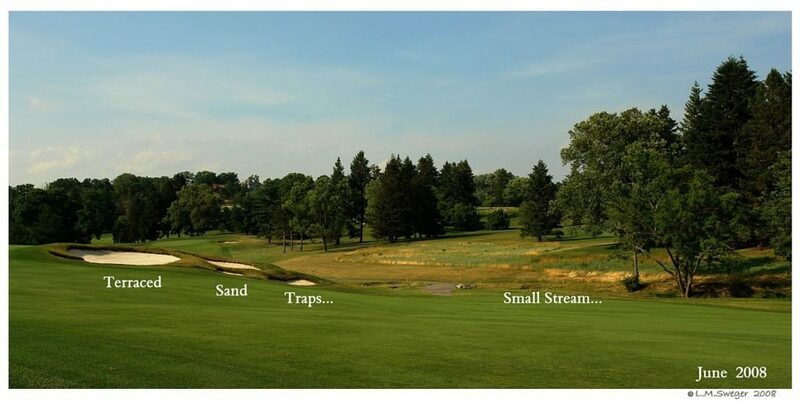 Golf Course Sand Traps are a Great Place for Incubation. 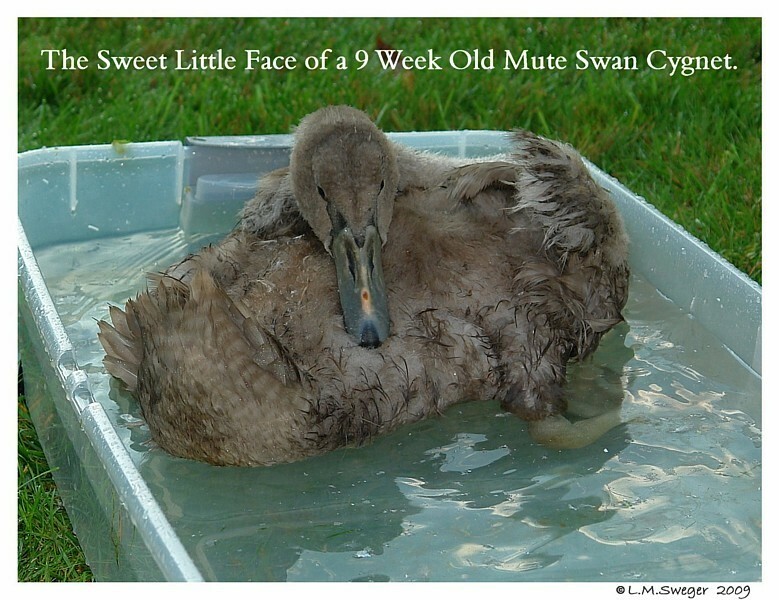 Incubation time is Temperature-Dependent, ranging from 9 to 18 weeks. 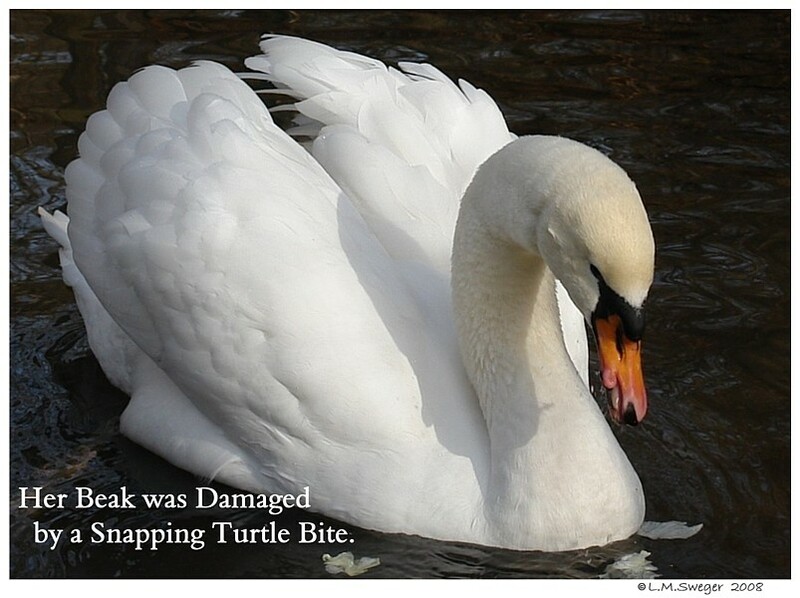 The unprotected Nest is Vulnerable to Predation. 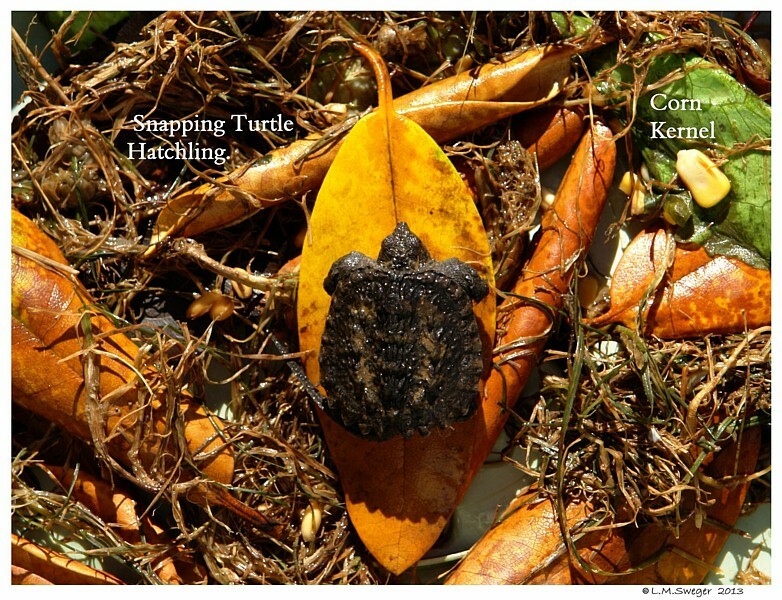 The Baby Turtles Hatch in late Summer and instinctively know to head for Water. 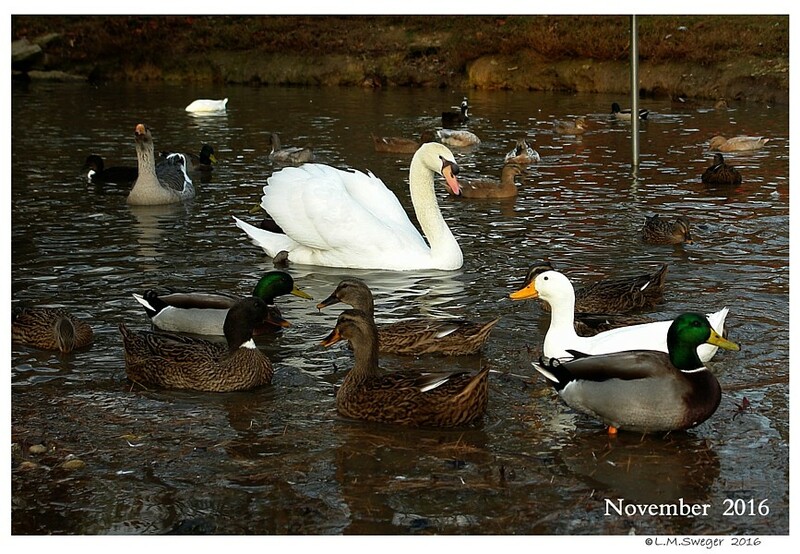 The Temperature makes a difference as to how many of each Gender are Hatched. 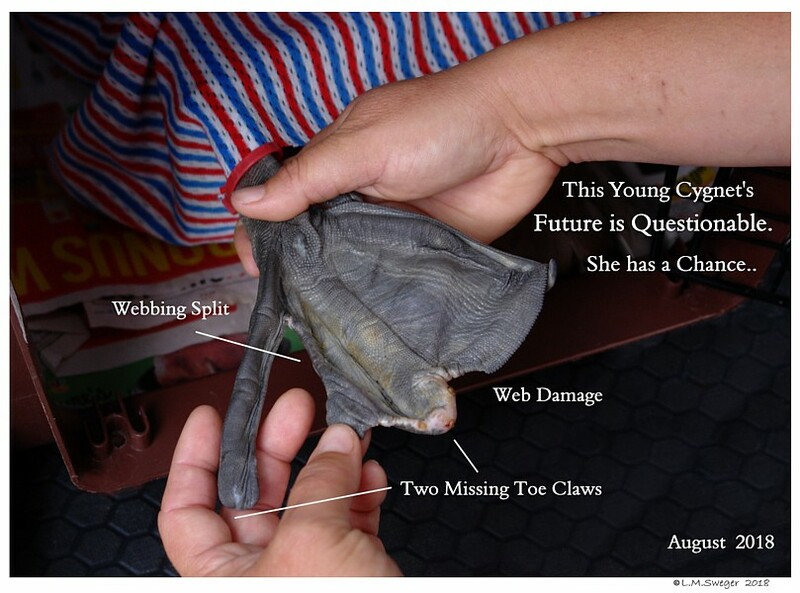 Turtle Hatchlings are the size of a 50-Cent Piece. 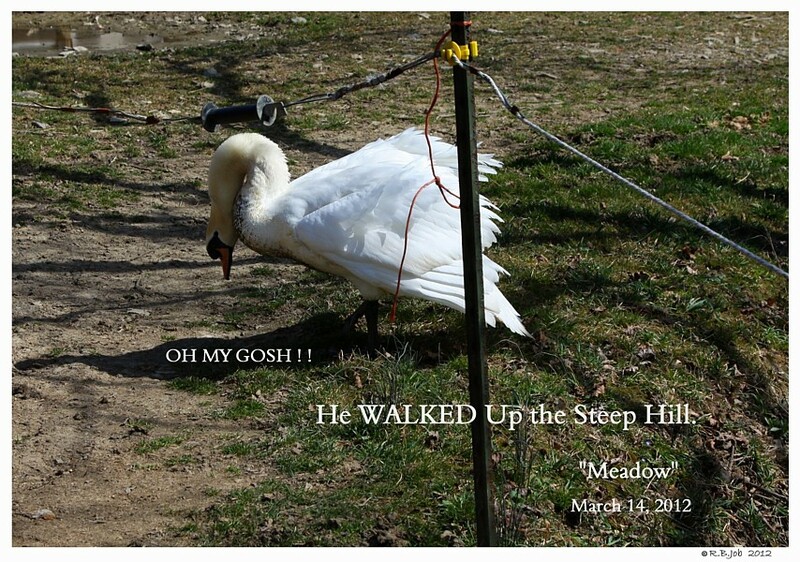 Many fall prey to Raccoons and Opossums. 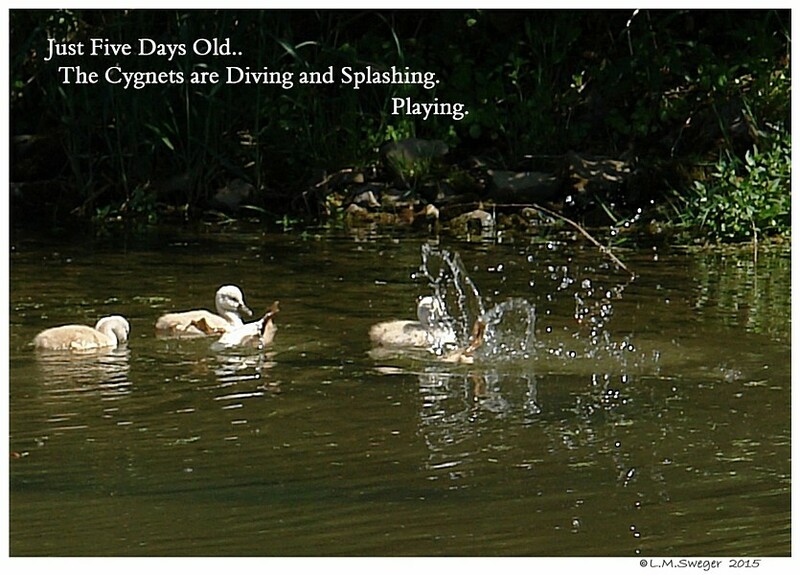 Those that survive are generally long-lived — 30 to 50 to 100 years. “HE” is Likely Older them Most People Alive Today. 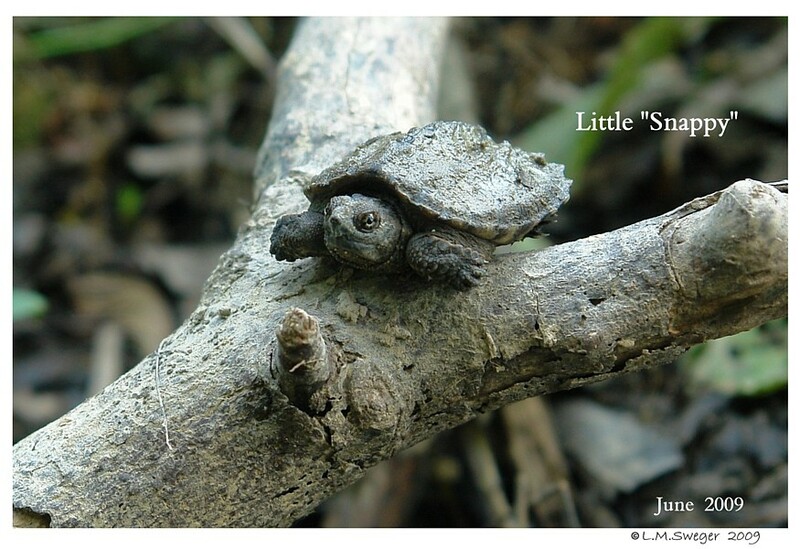 Turtles have a Complicated Metabolic Process that allows them to Hibernate through the Cold Winter Periods. 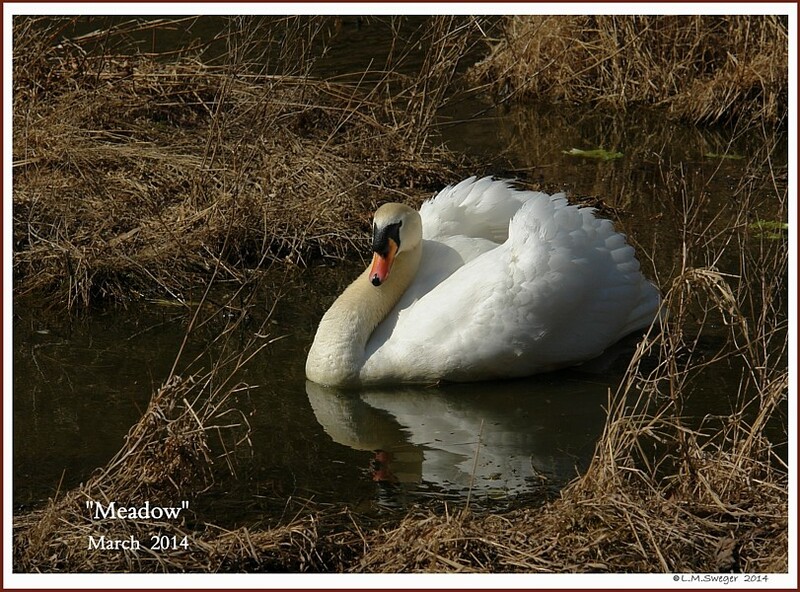 They Dig and Snuggle down into the Lower Muddy Areas and wait for Spring. 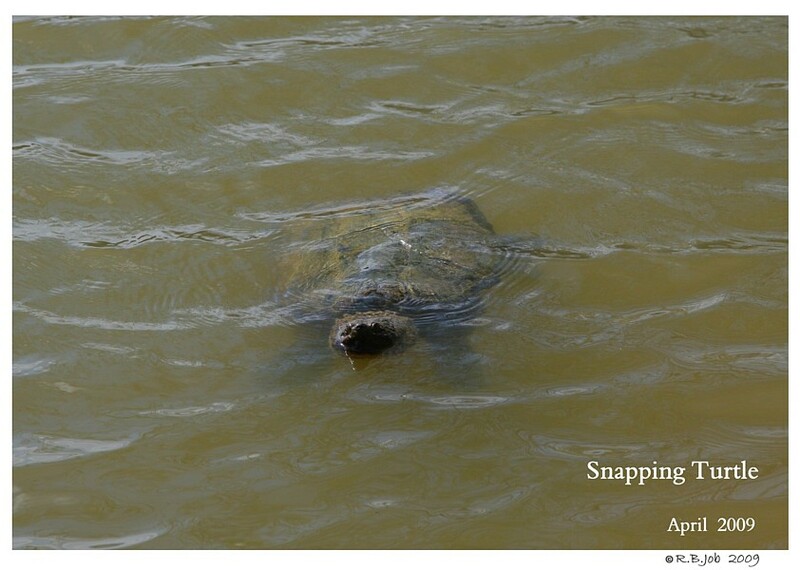 For a Few Colder Months the Snappers are NOT a Problem. 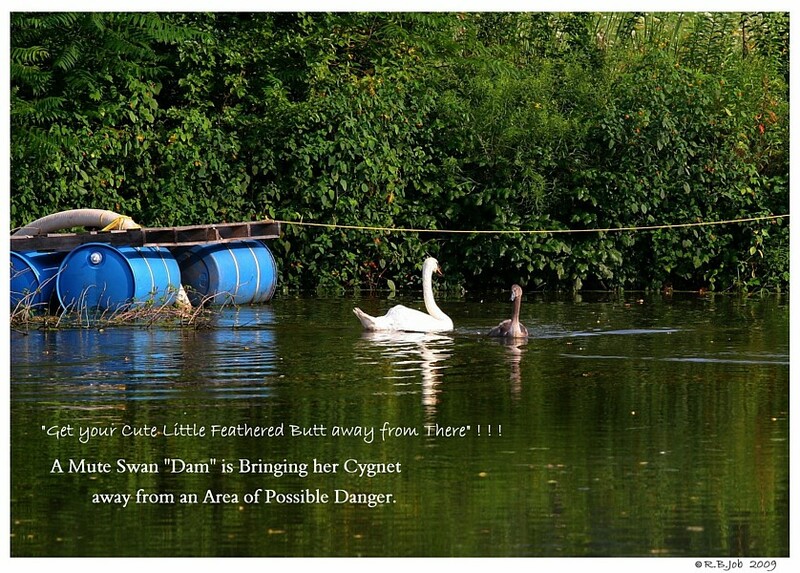 They will be BACK.. when your Tiny Innocent Cygnets want to Play and Explore. 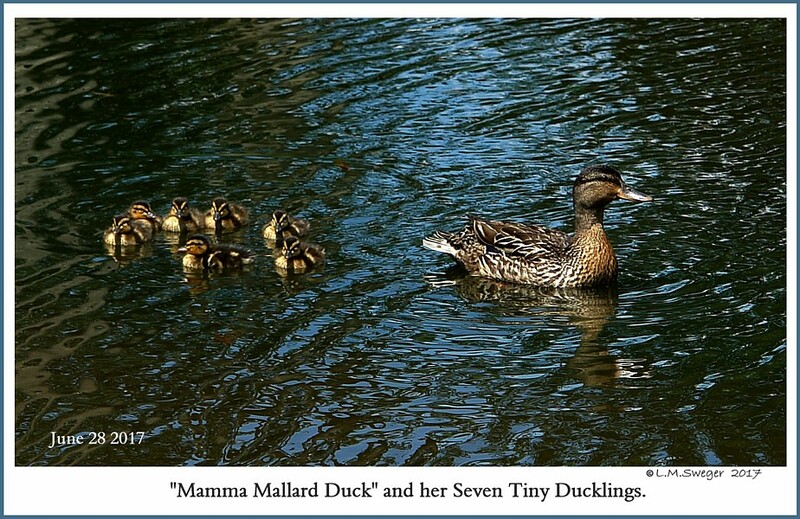 This Mother Duck Started with Seven Ducklings. 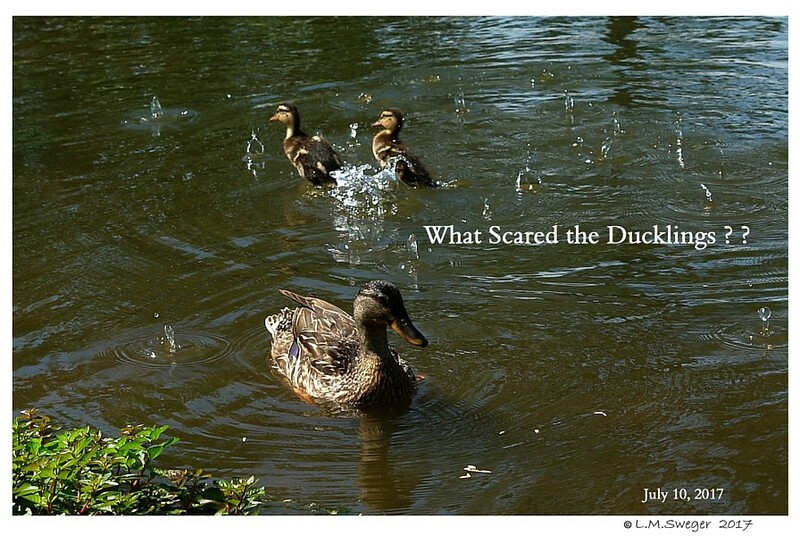 Five Ducklings Lost in 12 Days. So Sad. 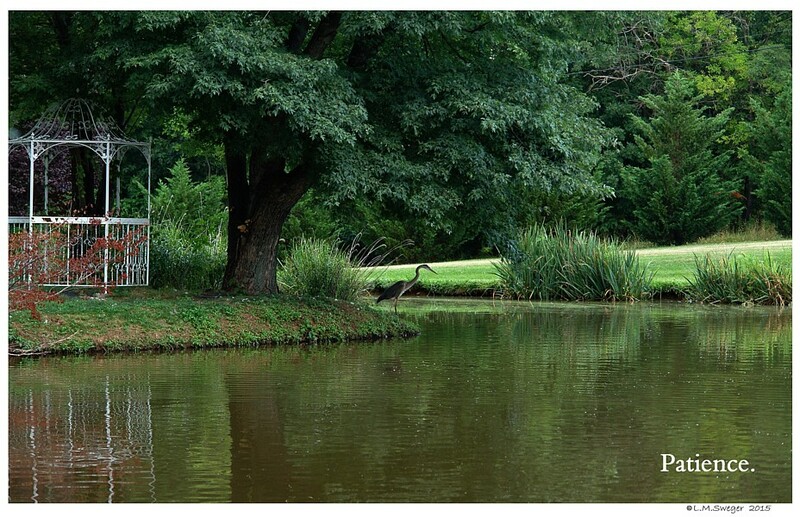 AND, if you have a Pond that is visible from the Road. 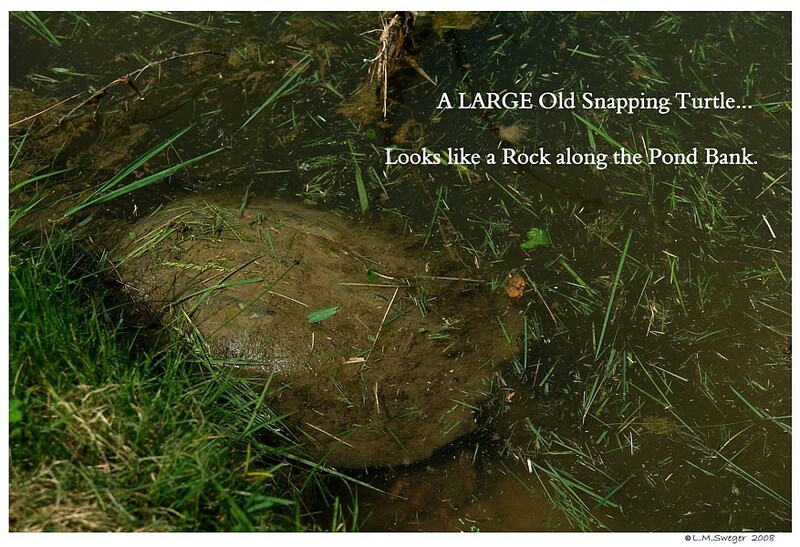 You are likely to have People bring Snapping Turtles they find Crossing the Road to your Pond. Their “Good Deed” becomes your Nasty Headache..
And, just Drive Away. THANKS BUDDY !!! 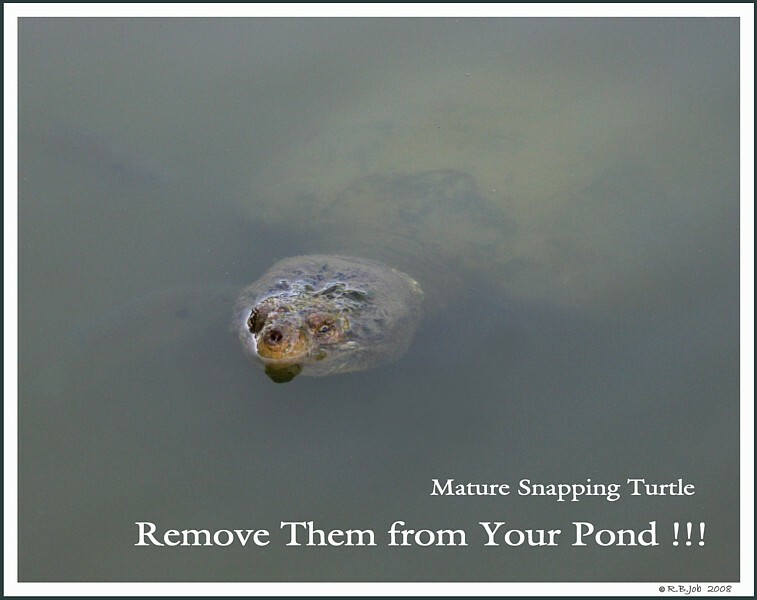 ***** FOR PRIVATE Land-Pond Owners..
And they read Snapping Turtles can not be Removed until July 1st. 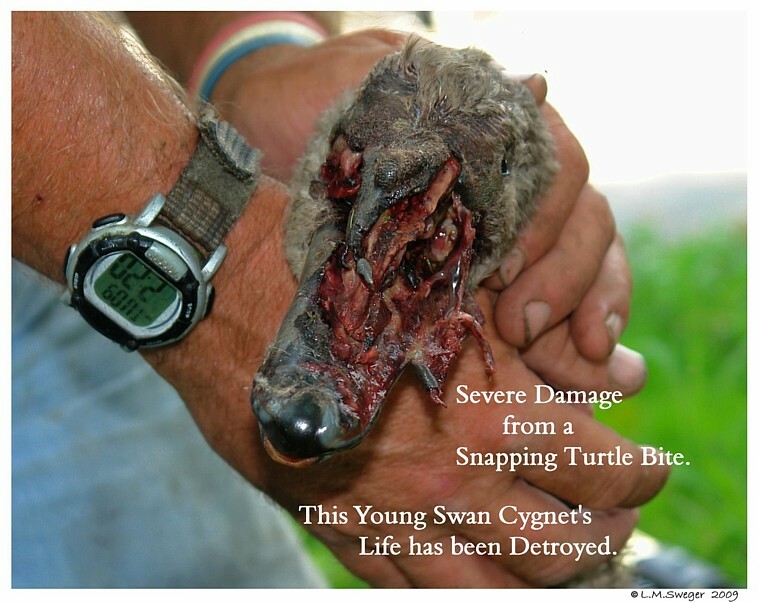 This Regulation is for People who Trap for Commercial Sale of Turtle Meat. 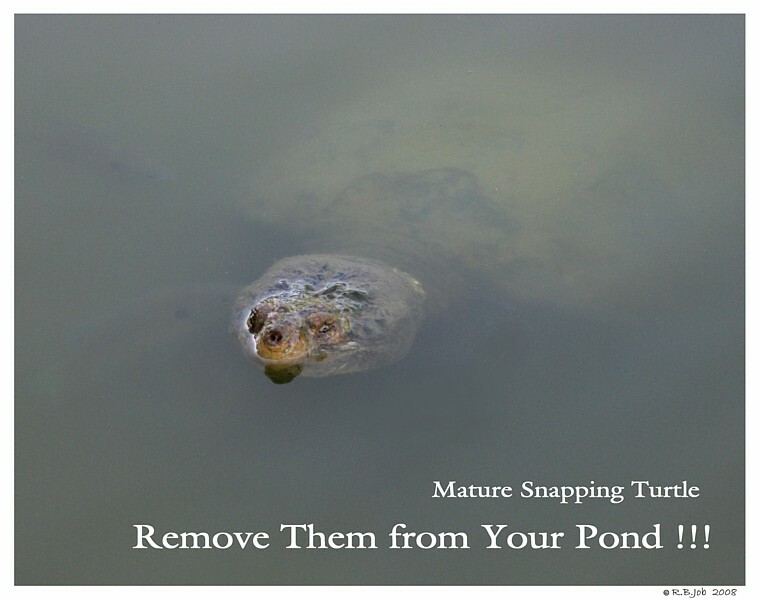 IT is OK for the Person who Owns the Pond to REMOVE Snapping Turtles ANYTIME they are a Problem for You, Your Family, Your Pets, Your Waterfowl. NO Permit Needed.. NO Time to Wait.. 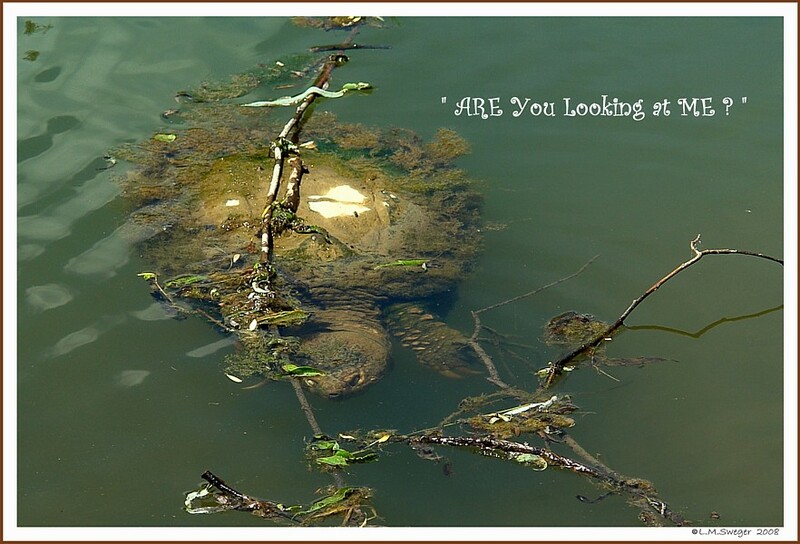 Anytime..
*** JUST do not Sell the Turtles. 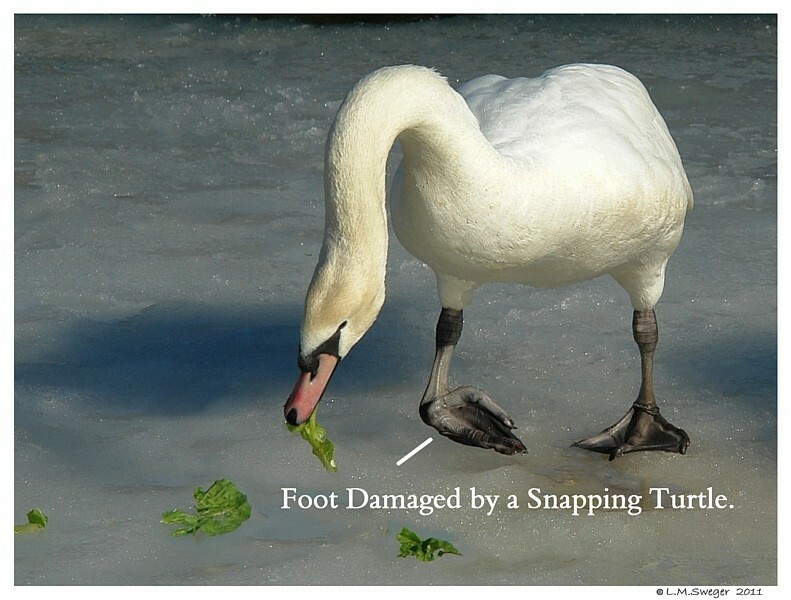 of your Waterfowl, make sure you have Identified them Properly. 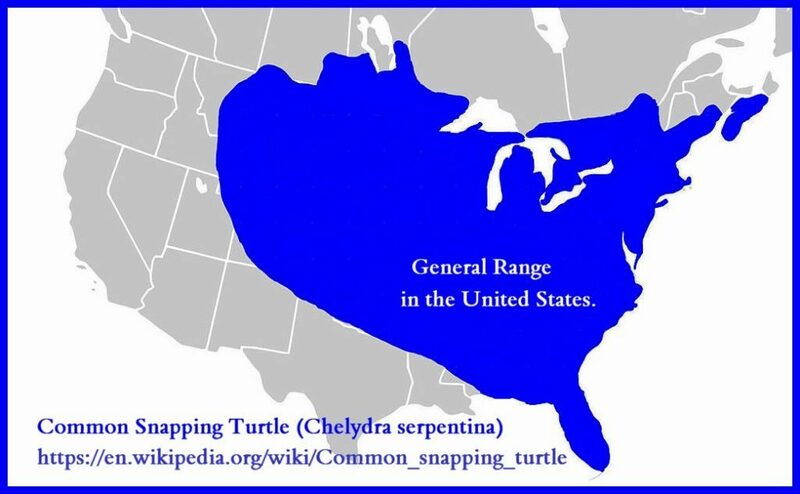 The Common Snapping Turtle has a large Head with a strong Beak. 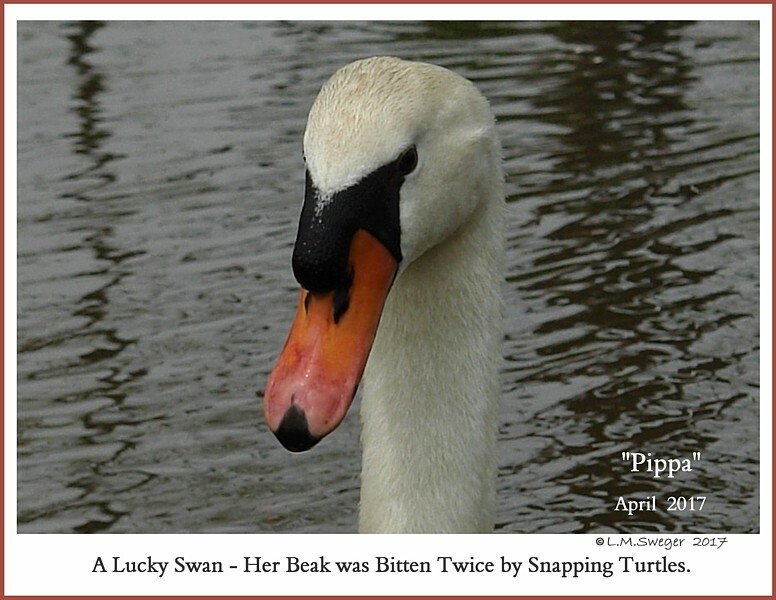 The edges of their Jaws have sharp edges to RIP apart Food. 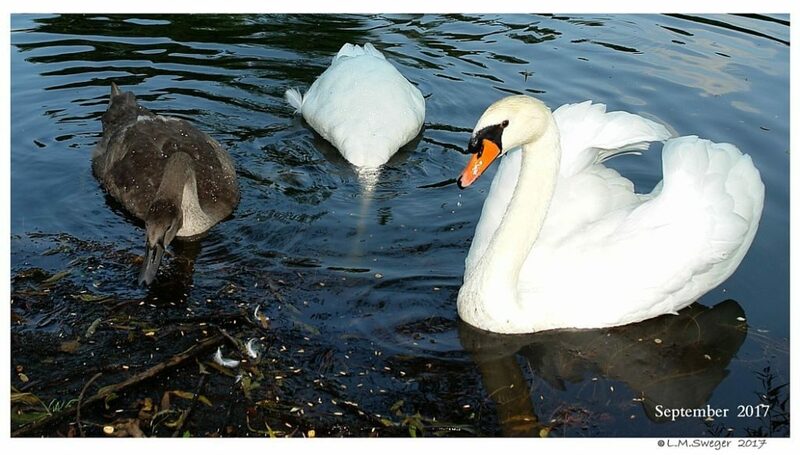 Males are larger than Females. 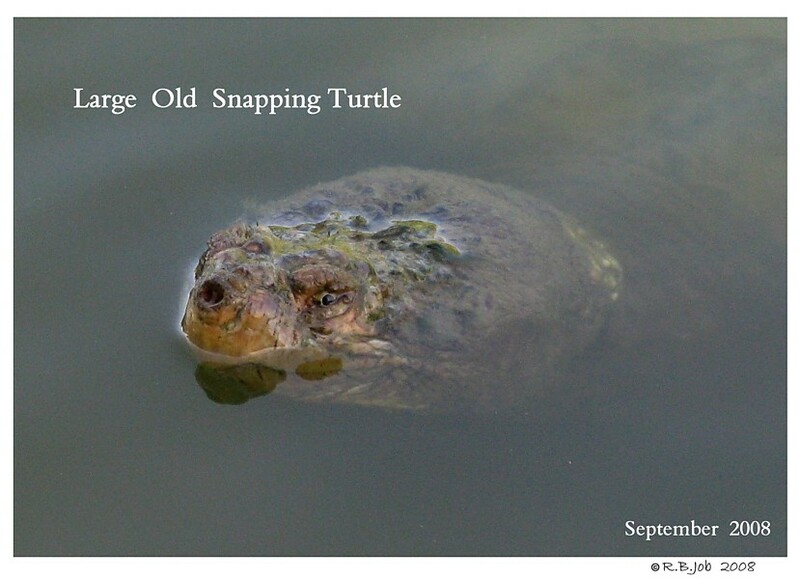 Snappers grow throughout their Life Time. 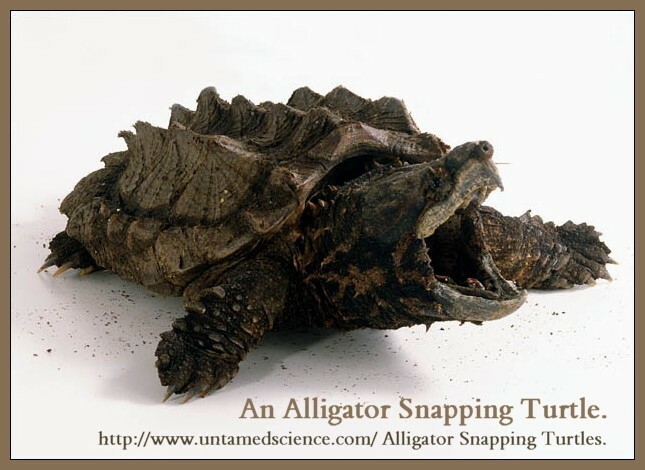 Snappers weighing in excess of 22 Pounds are likely to be Male and OLD. 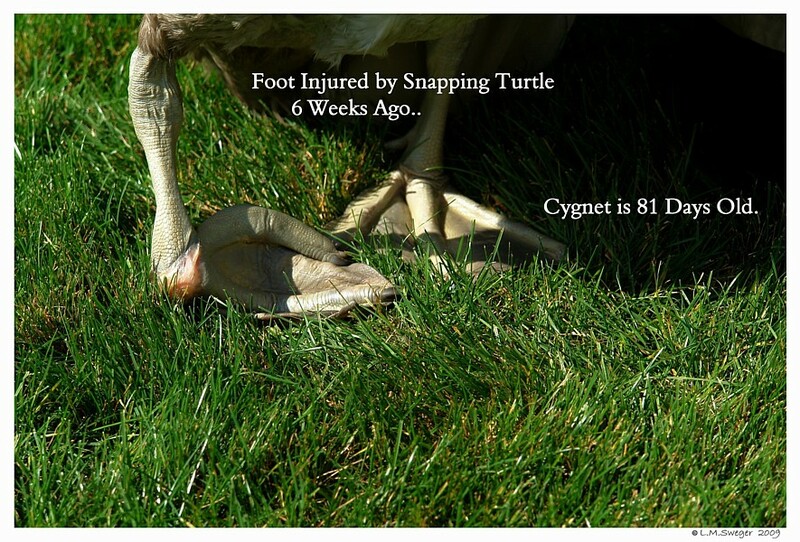 Snappers that do the most Harm will Range from 10–35 Pounds. 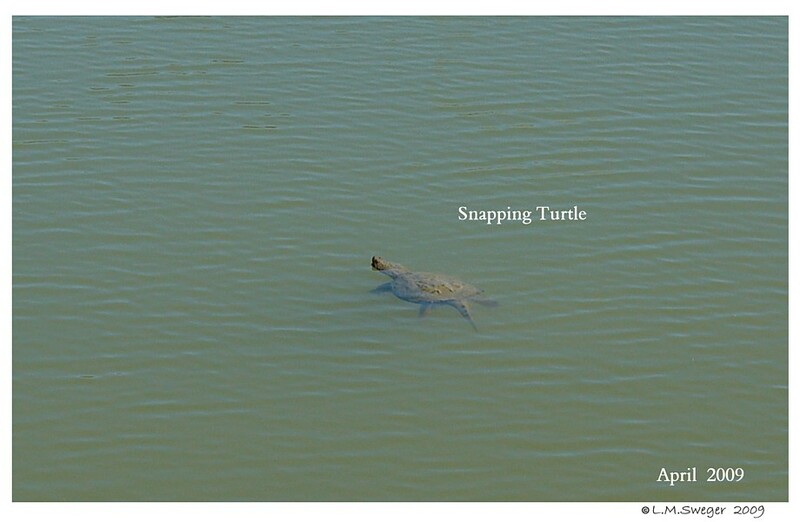 Do a SEARCH for a Website to help you Identify Turtles. 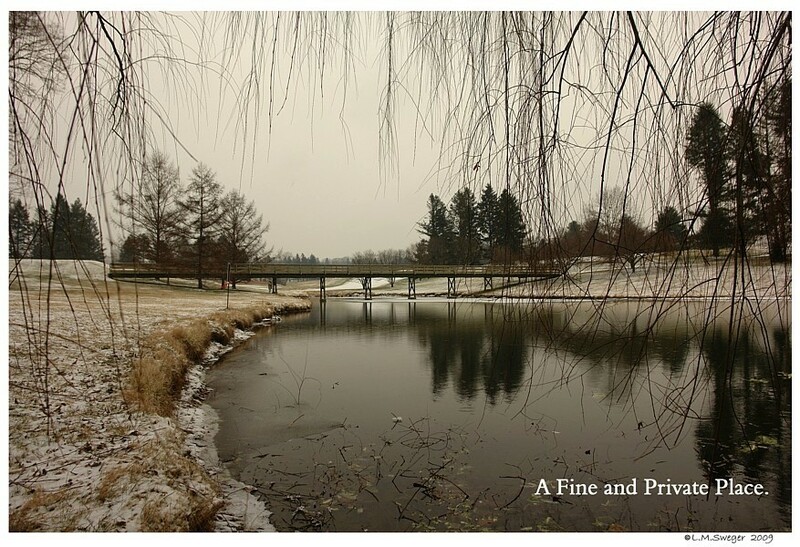 Most States’ Fish and Boat Commission Websites have a Page. 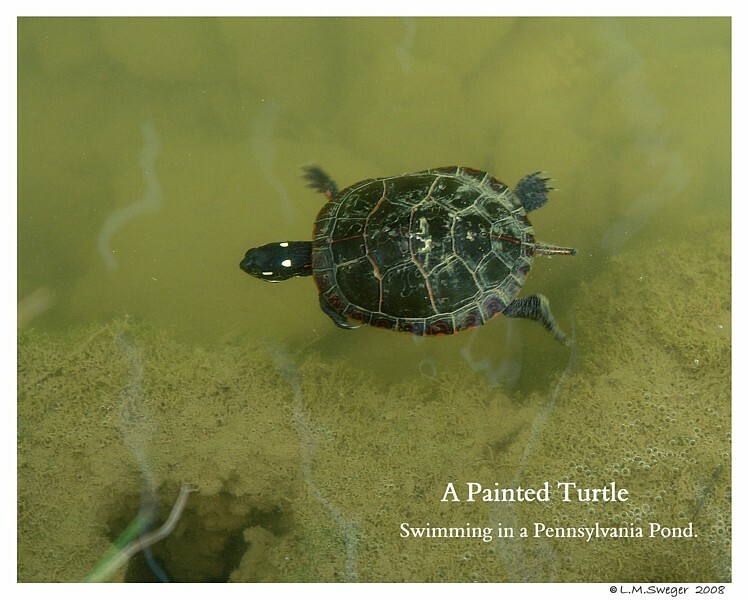 Search Example: Pennsylvania Turtle Identification. 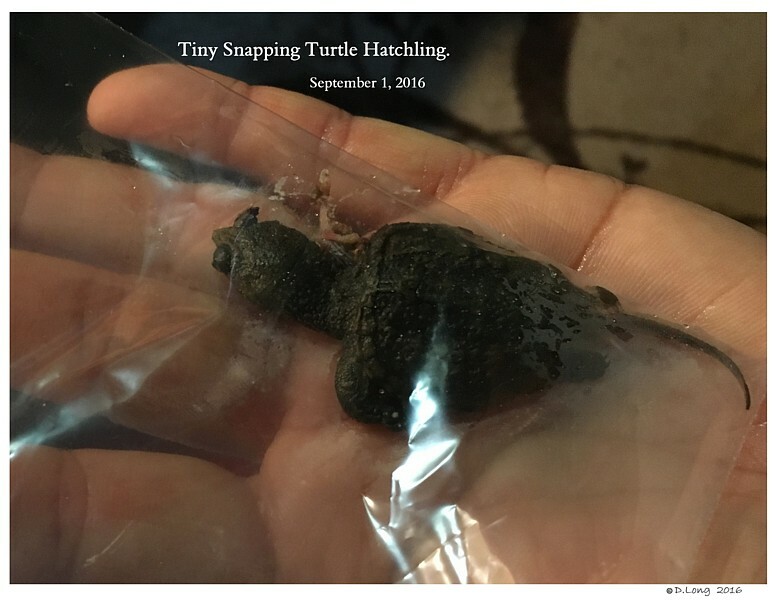 Baby Turtles To help Identify. 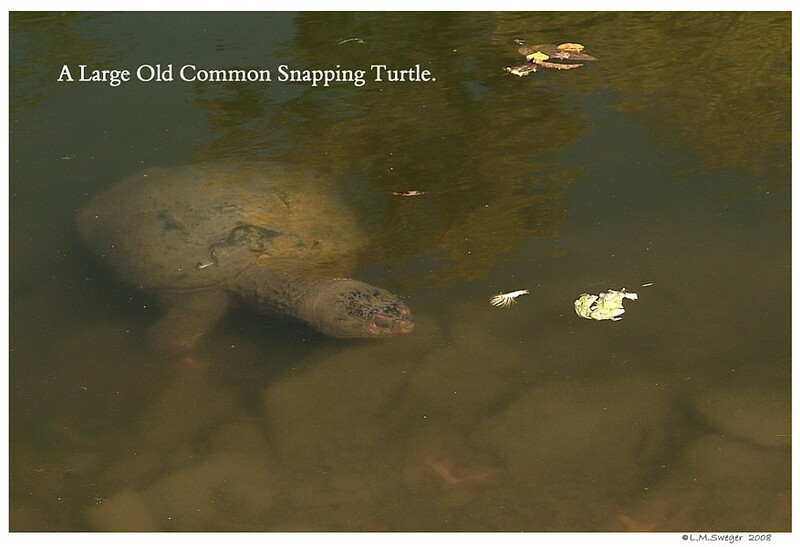 If you are Not Sure you have a Snapper in Your Pond..
You can Check with a Simple Method.. 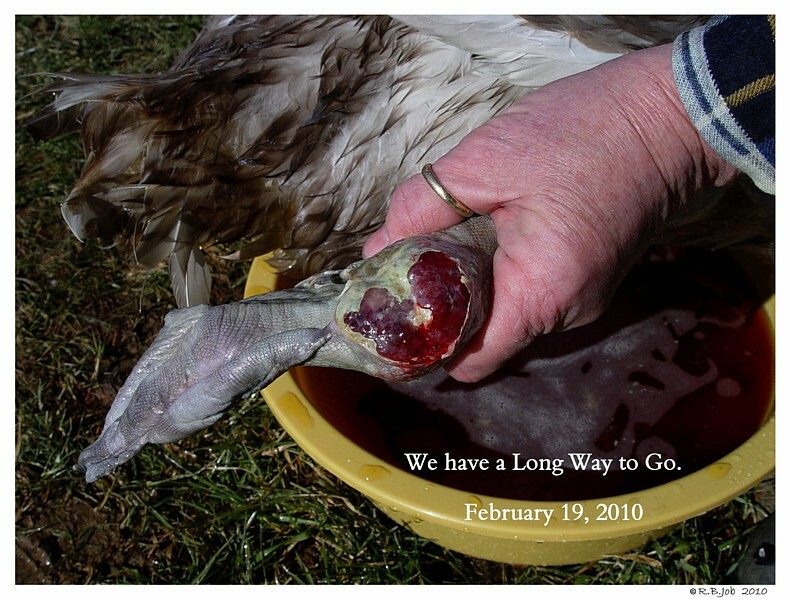 Tie a Raw Chicken Leg (or Chunk of Raw Meat) to a Strong Cord. 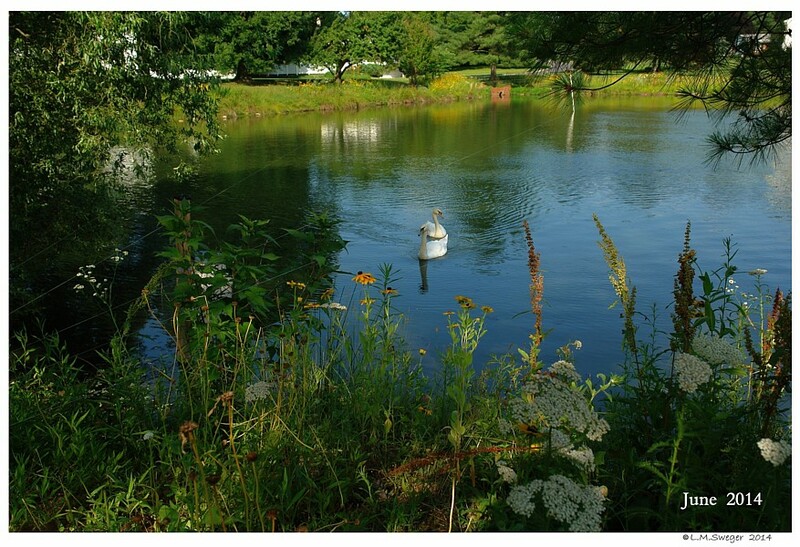 Tie the Cord to a Stake or Post along the Edge of the Water. 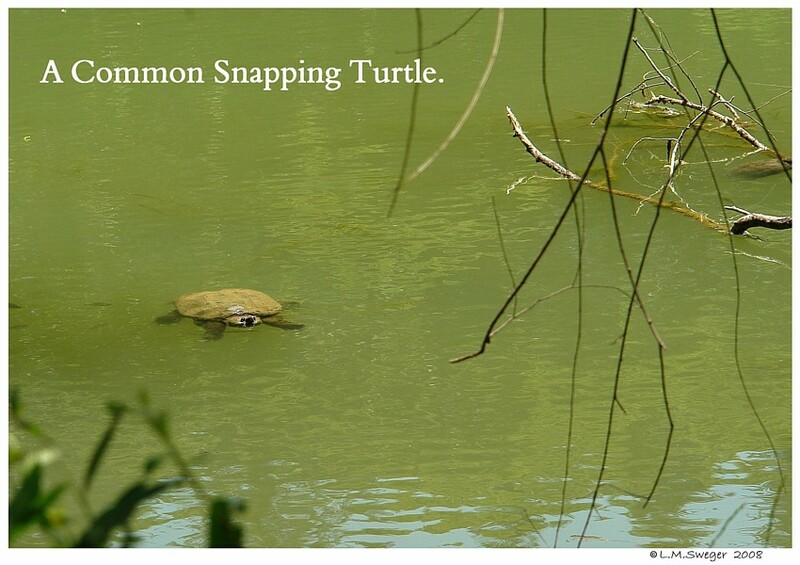 If you have a Snapper.. the Meat will be Consumed. Sigh.. No One wants this Result.. 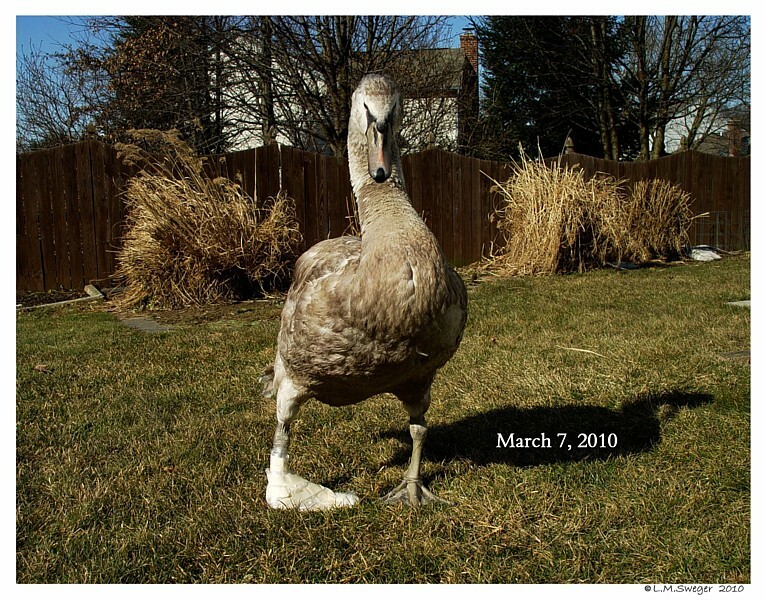 The Best thing to do to Protect your Pet Waterfowl.. 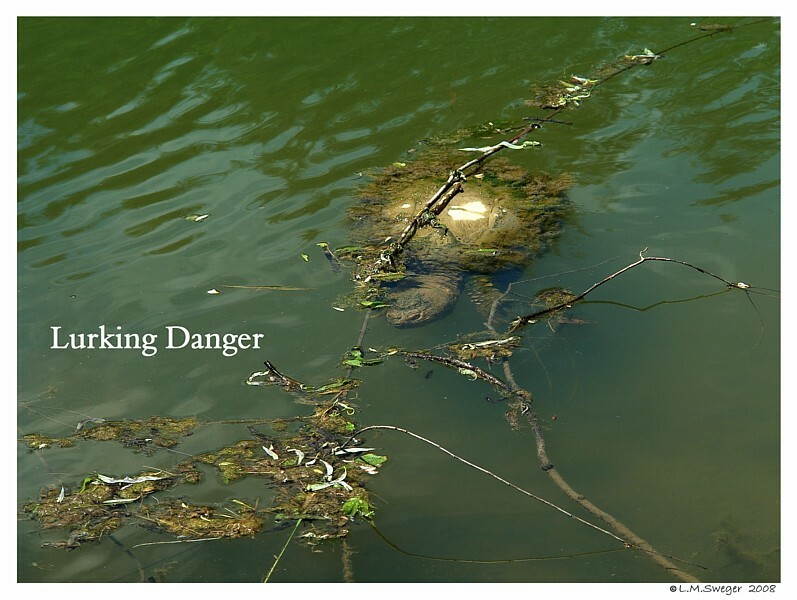 There are WildLife Control – Removal Services that will come Set Traps and Remove Snapping Turtles..
that you can Legally Harvest and Sell Commercially for their Meat. 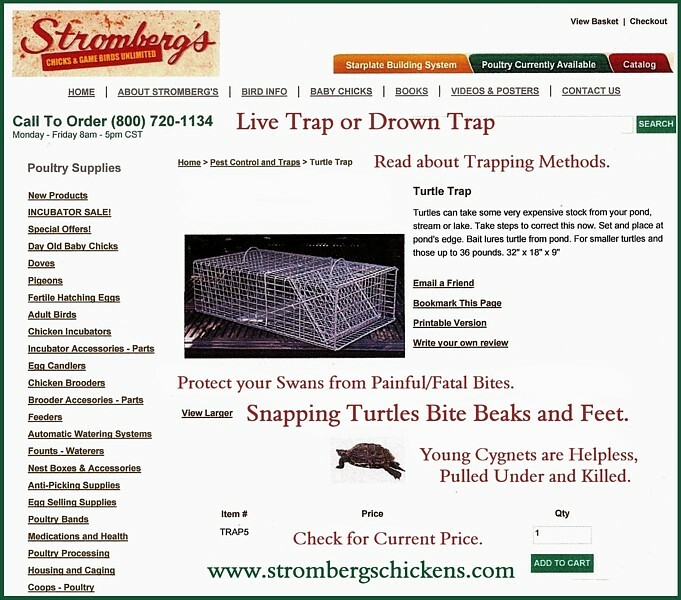 Commercial Trapping to Sell Snappers for their Meat has a Restricted Season. 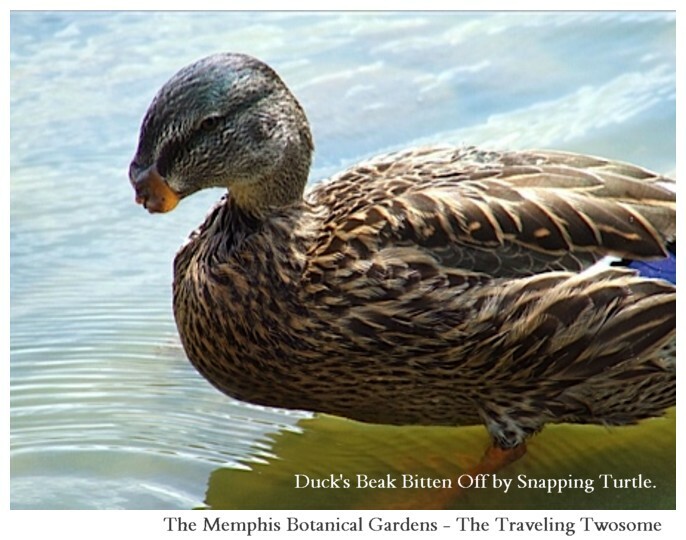 WildLife Control Services must follow State Regulations. 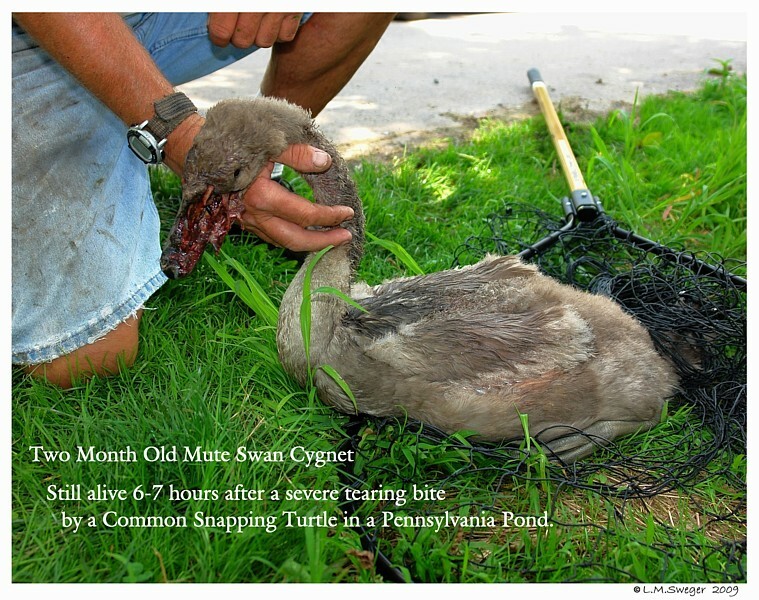 In PA a Permit is Required.. Legal Season begins July 1st. by the PA Fish and Boat Commission. 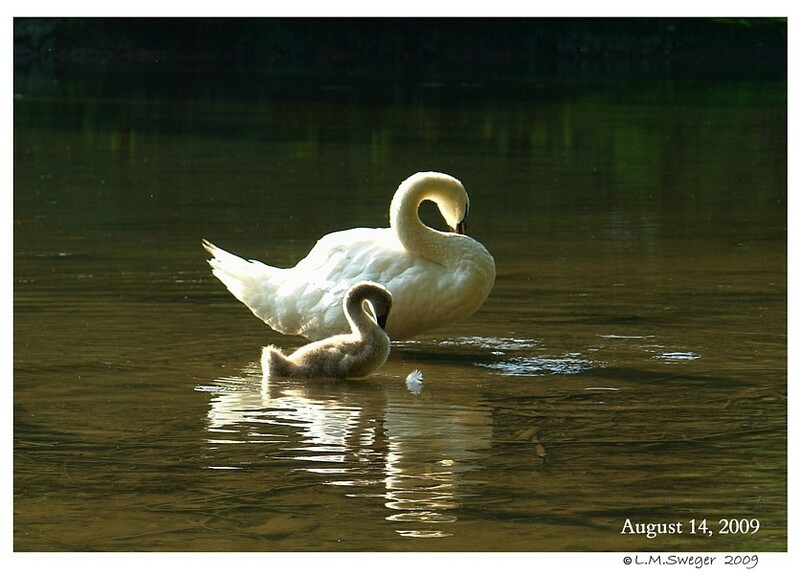 In 2018 the Date is July 1st. 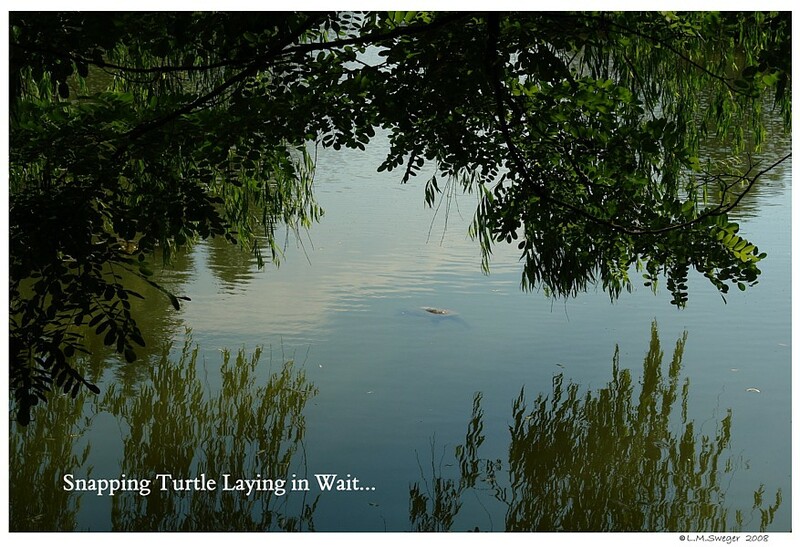 This allows the Female Turtles time to Lay their Eggs.. 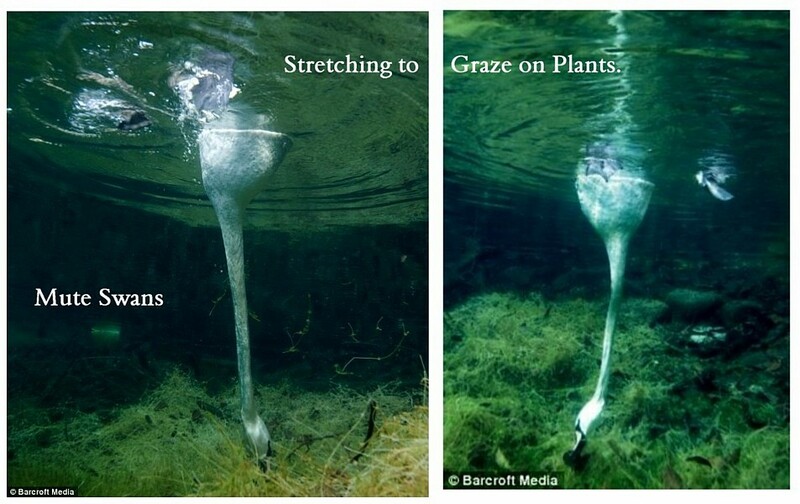 Which generally happens during May-June. 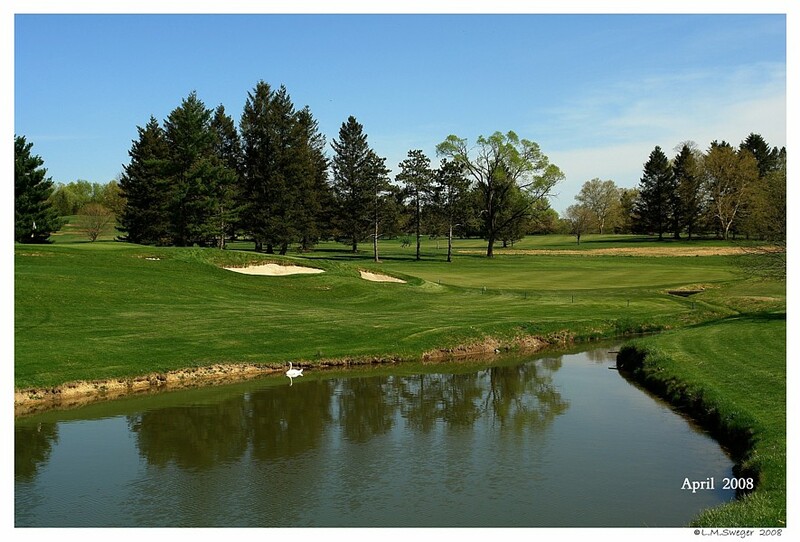 PO Box 67000, Harrisburg, PA 17106-7000. 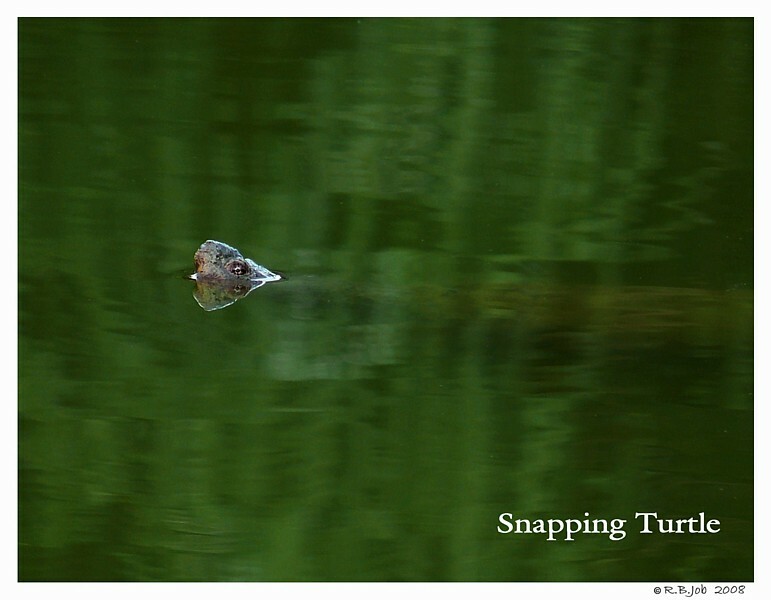 There are various Meat and HOOK Methods of Snagging the Snappers. If you use One of these Methods.. 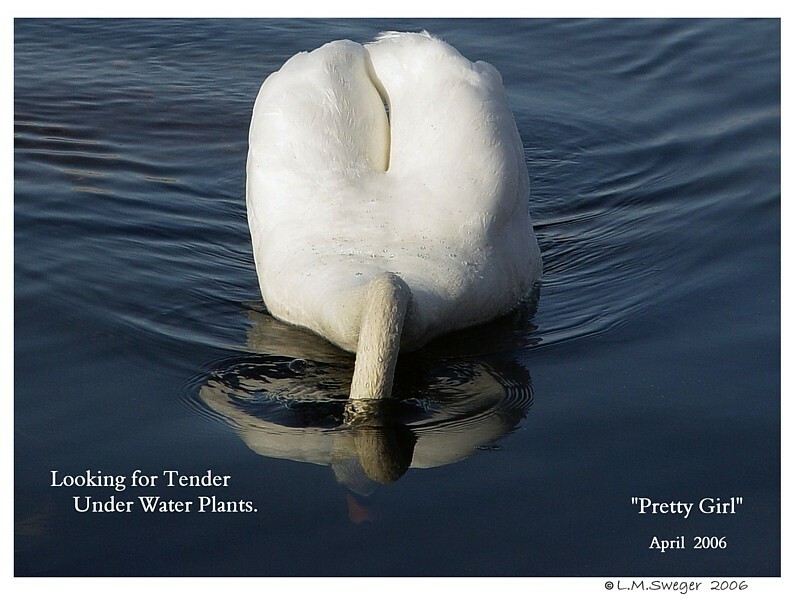 The HOOK needs to be DOWN at least Five-Six (5 to 6) Feet from the Surface..
Swans can REACH Down to Graze on Under Water Plants. 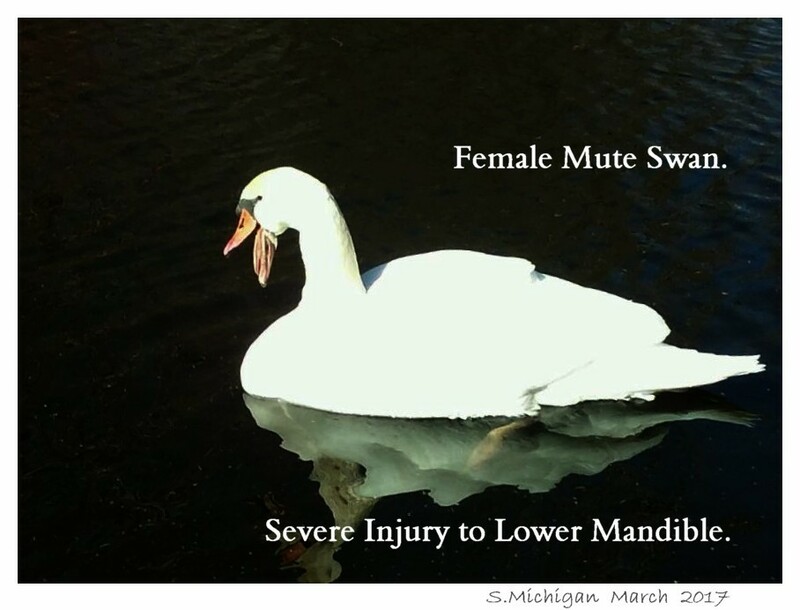 You do not want to SNAG your Swans..
or have them get Tangle with Bare Lines or Cords. 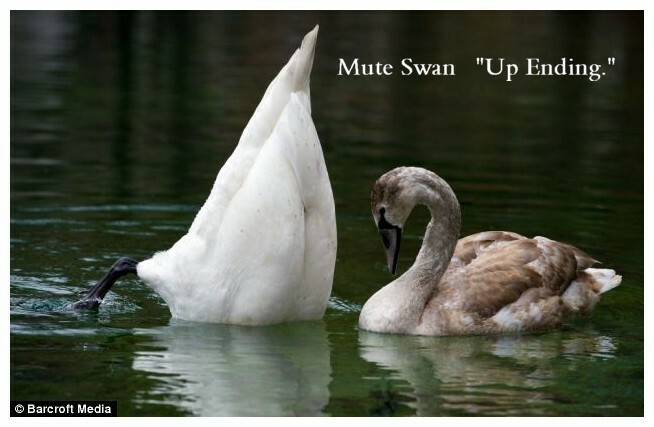 These are Notes from a Swan Friend.. who has done this many times. One EMPTY Gallon Plastic Milk Jug Sealed with Cap. or Narrow Pipe or Metal Conduit.. Something with Weight. 40 to 50 feet of Nylon Rope. 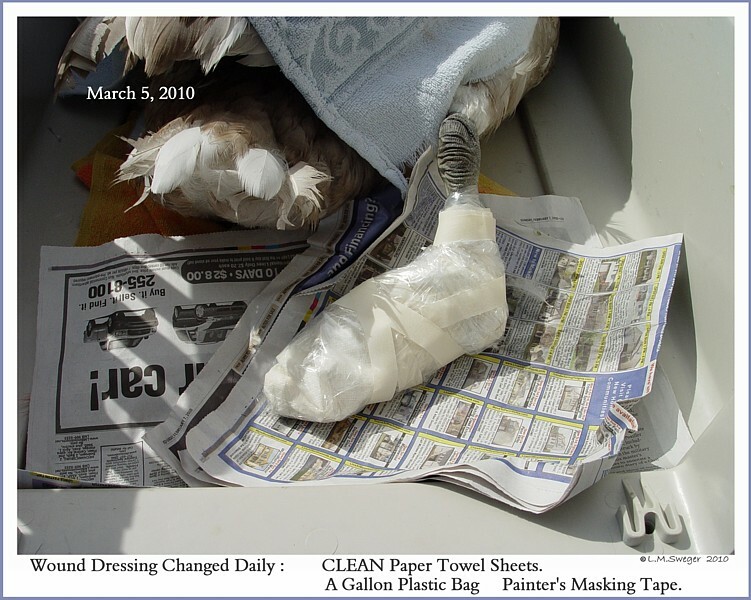 Chicken Necks, Legs or Wing Parts for Bait. * Secure the Nylon Rope to the Weighted Steel Leader. Thread the Nylon Rope through the Pipe/Conduit.. Secure the Rope to the Empty Milk Jug. Have a Second Line attached to the Jug.. Attached to the Shore. to Hook themselves. The Bobber (Milk Jug) will move. 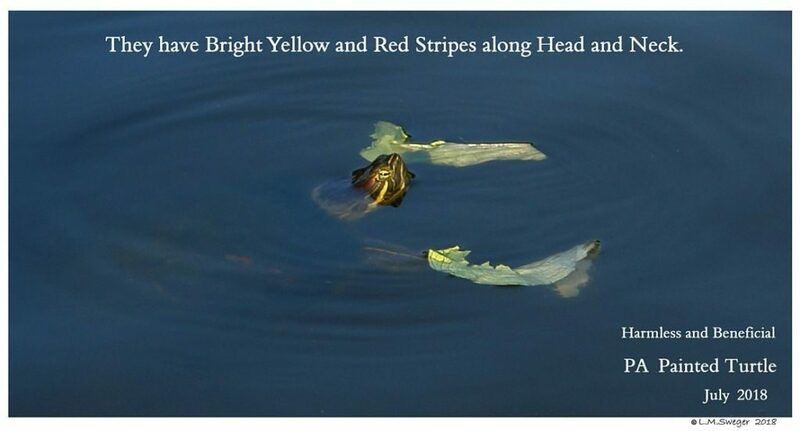 Pull the Milk Jug in when the Turtle is HOOKED. 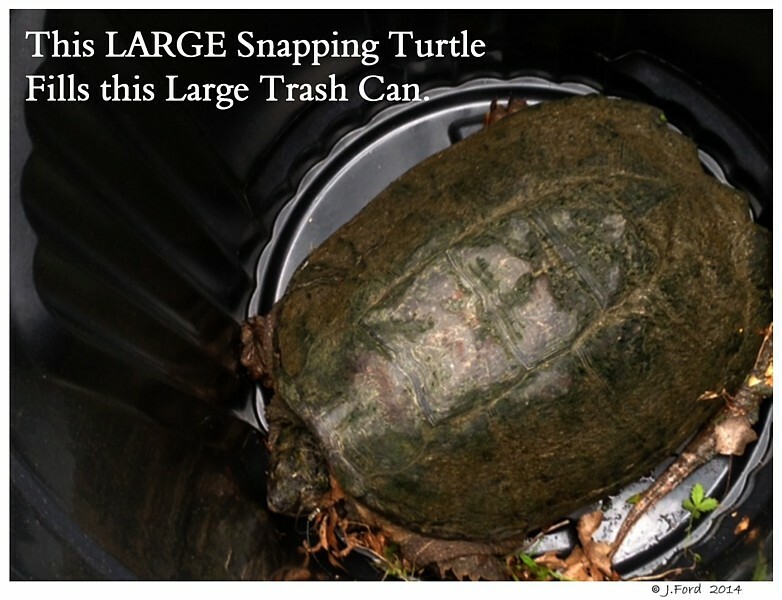 Use a Shovel to push Turtle into LARGE Trash Can. 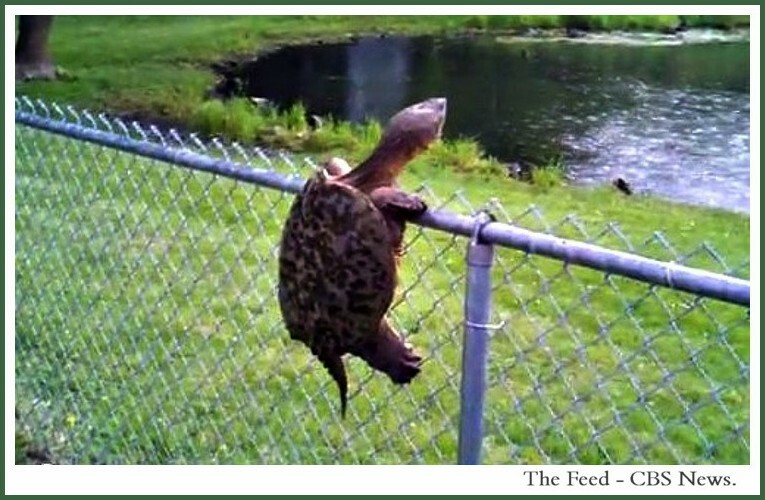 Use Wire Cutters to Cut the Steel Leader..
DO NOT Try to REMOVE the Hook from the Turtle. 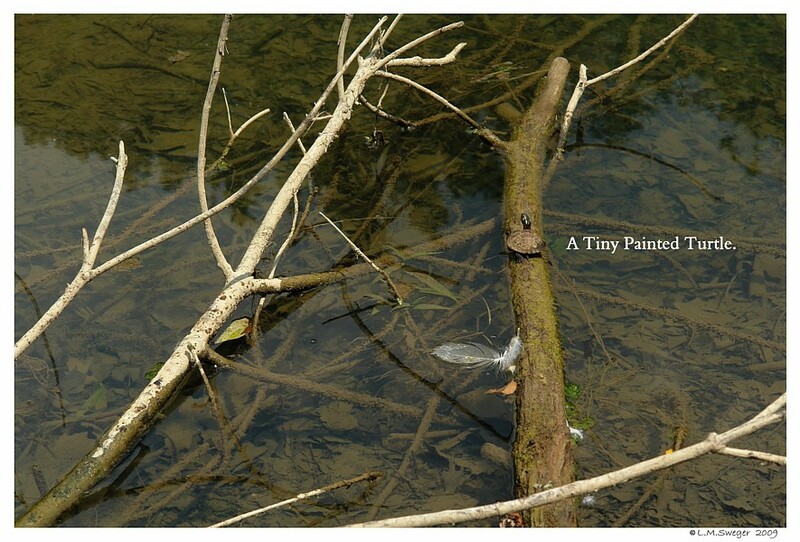 Take Turtle to Stream or River FAR FAR away and release. 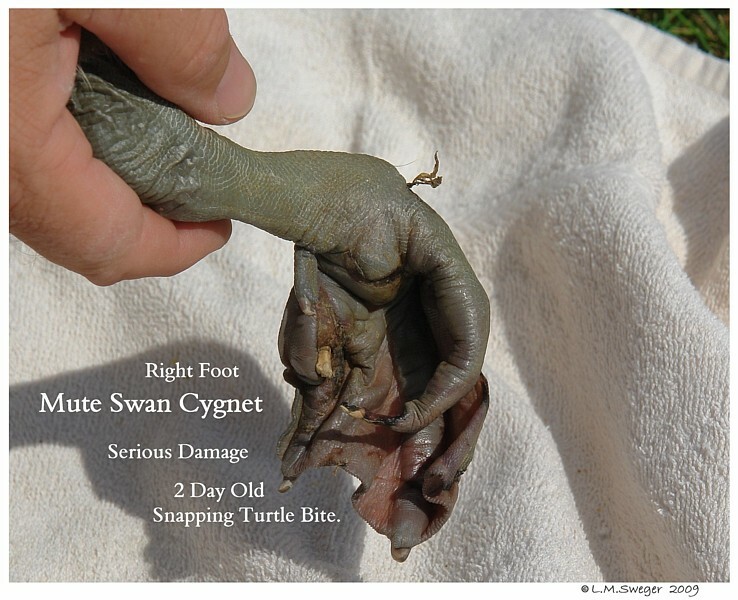 The Turtle’s Digestive Juices will dissolve the Hook. 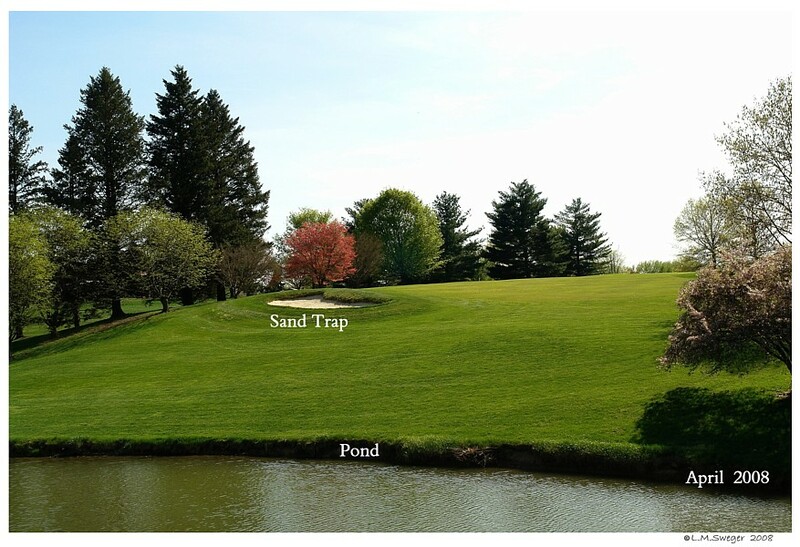 Repeat Until you have Snapping Turtles OUT of your Pond. 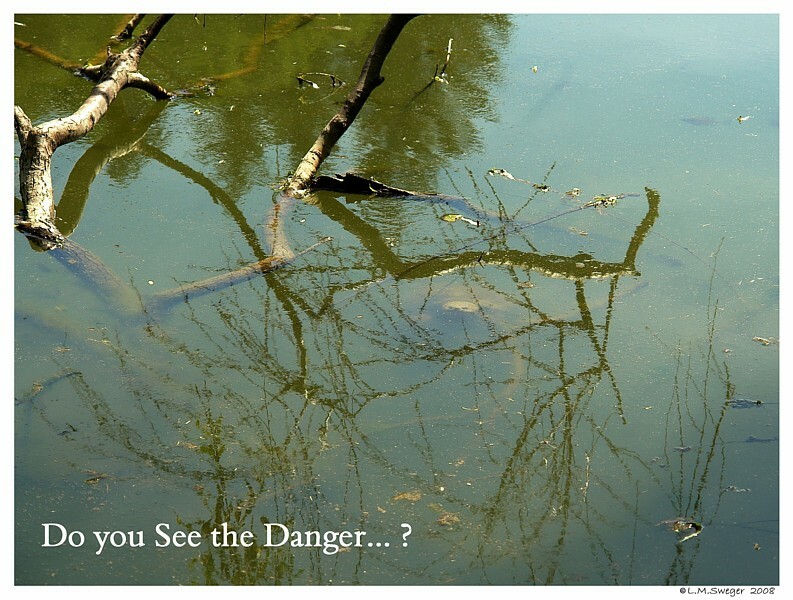 If there is ONE there are very likely MORE…. One Pond we Visited thought they did not have Snapping Turtles. In ONE Week they Caught 25 Assorted Size Snappers. 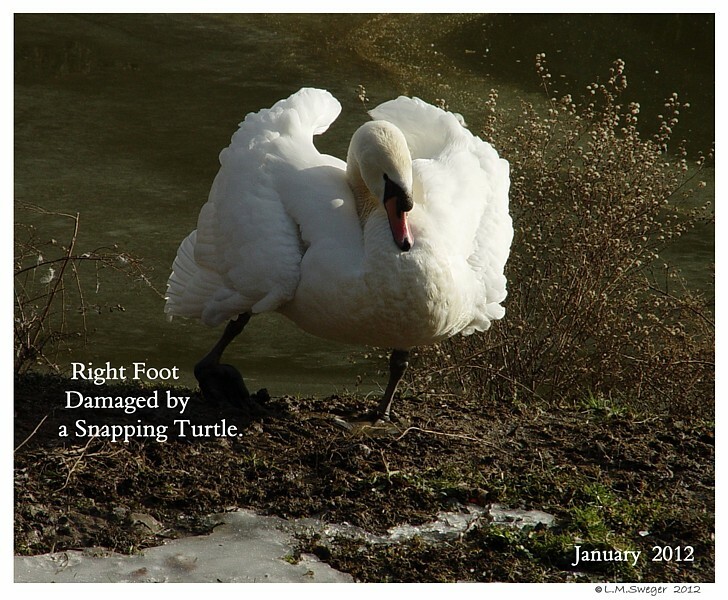 Be Vigilant for New Snappers and/Or “Chicken Leg” Check several times a year. 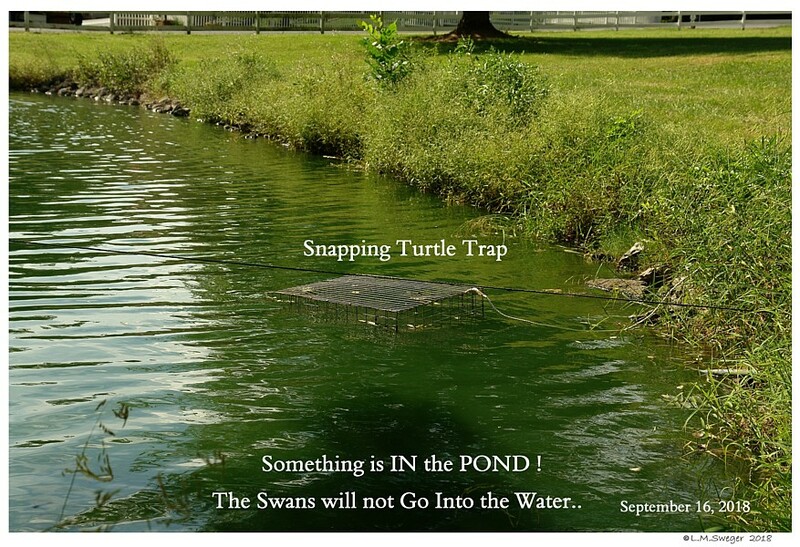 There are Snapping Turtle Traps.. Commercially Available. Depending on the Problem in your Area.. These might be worth the Investment. AND there is NO HOOK to Worry About. 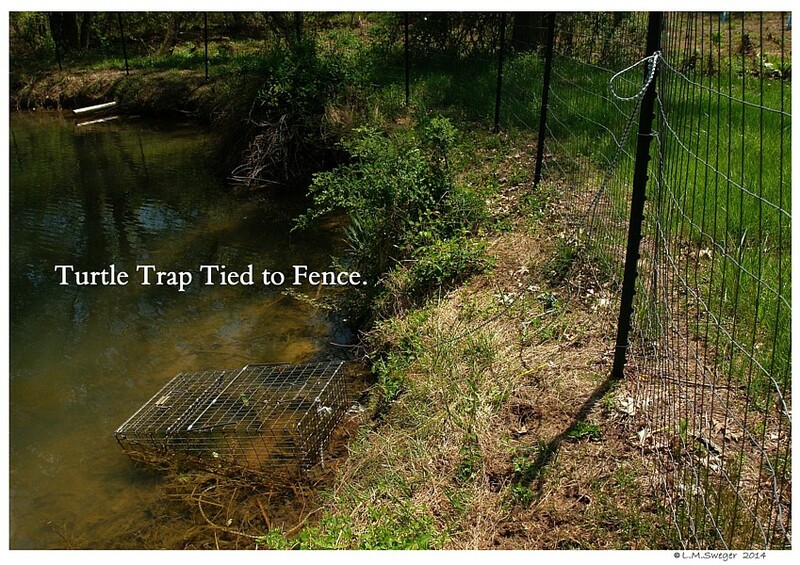 Search Various WebSite to Compare Traps and Prices. 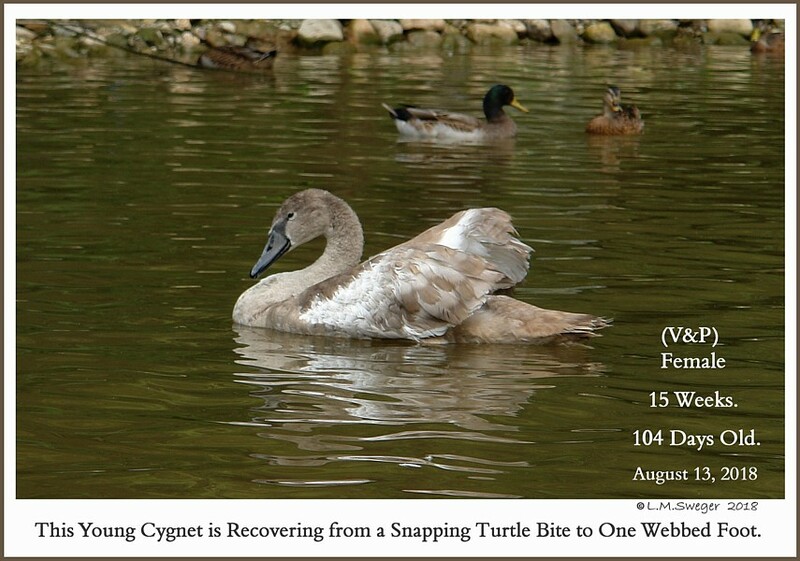 Catching Snapping Turtles by any Method is time consuming. 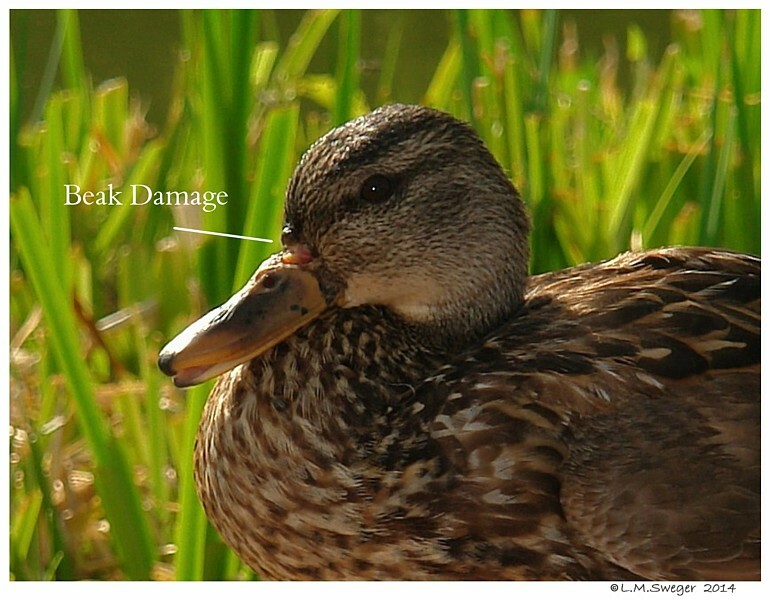 Seeing your Sweet Faced Waterfowl Chewed into Pieces is Heartbreaking. 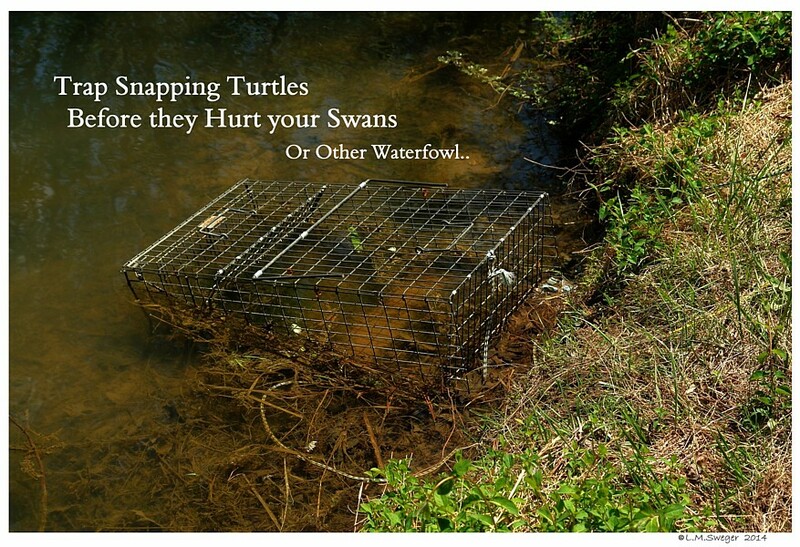 How you Plan to Dispose of Snapping Turtles is for you to Decide. You need to take them home ALIVE. 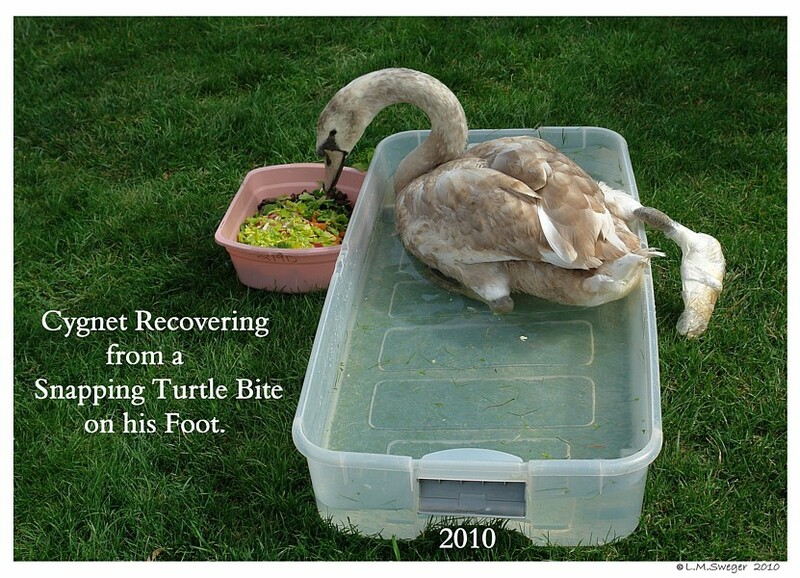 Put the Angry Beast in a large Escape Proof Tub of Water – ALIVE. 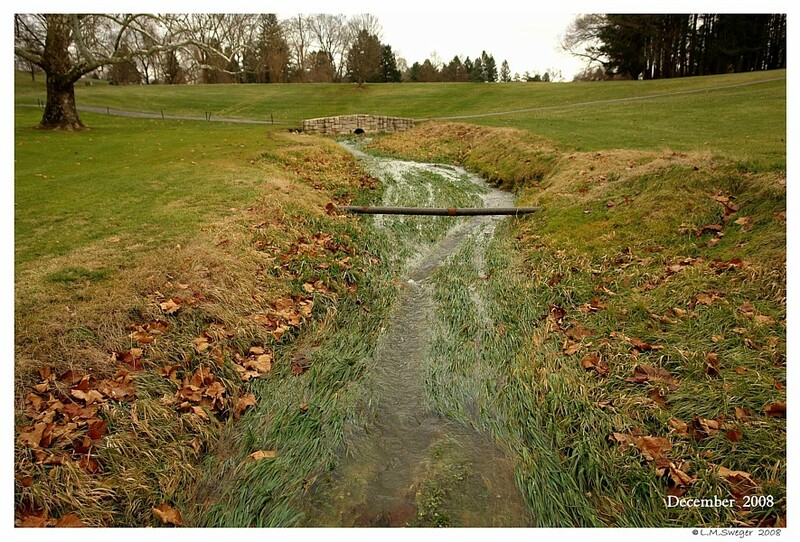 Change the Water several times during the next 5-7 days. This Cleans the Turtle before you Kill and Butchered it. This is more than many People are willing to do. 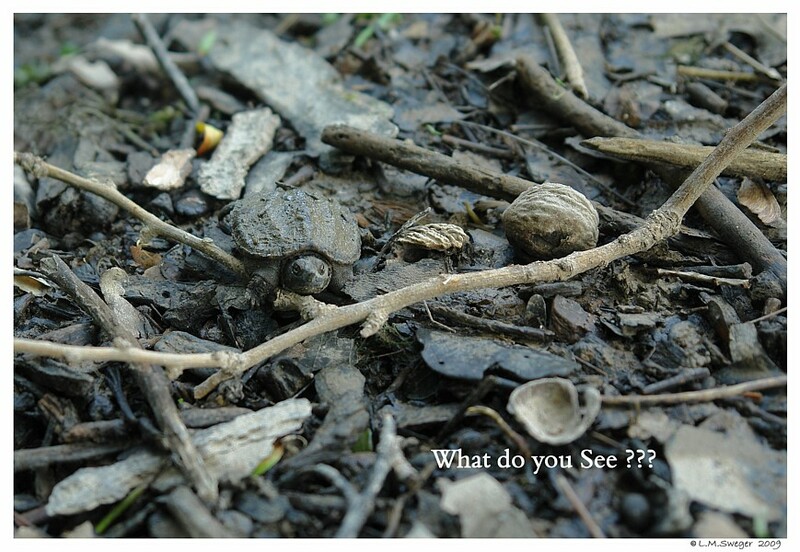 This is the Basic Idea.. Search and Read for Better Instructions. 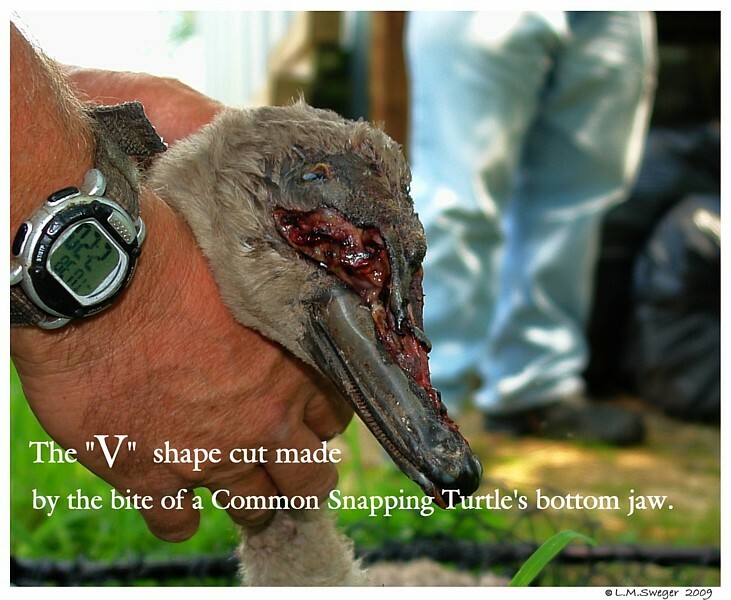 Snapping Turtle Meat can be Consumed in small amounts. 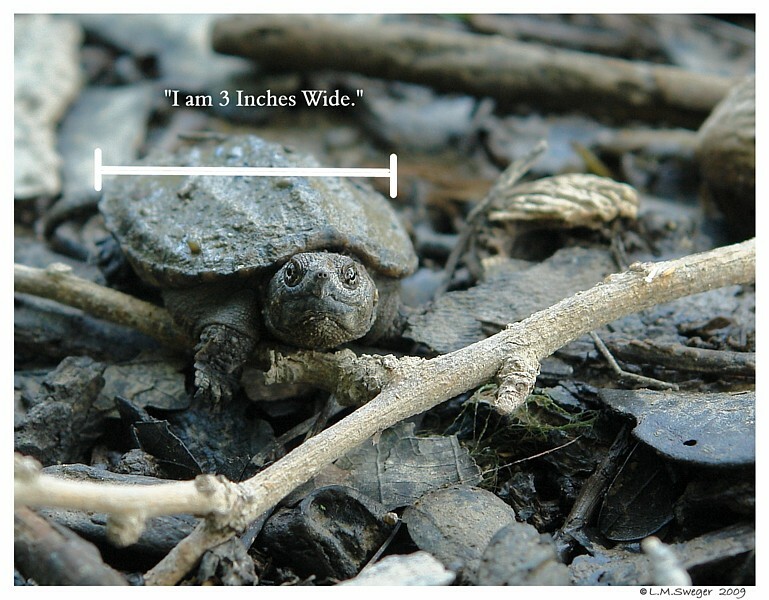 Snapping Turtles do retain PCBs in their Fat and Internal Organs. 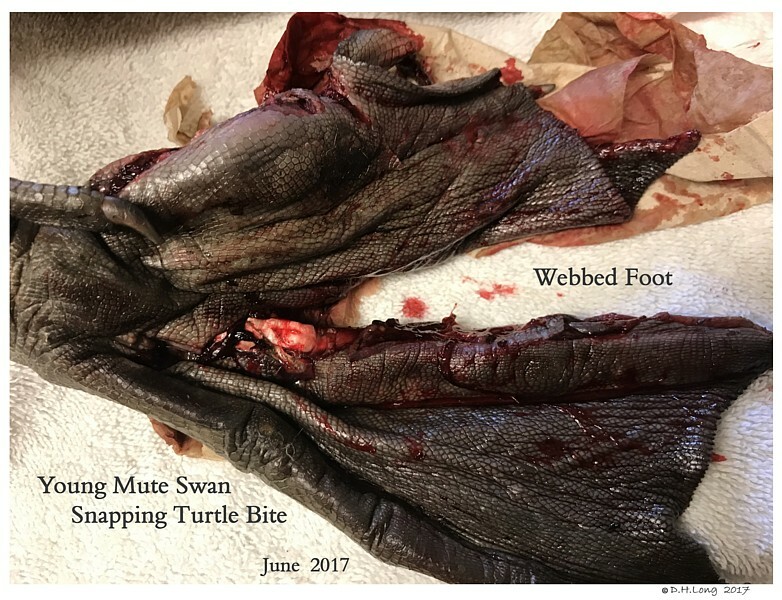 If you choose to Eat Snapping Turtle Meat, you can reduce your exposure by carefully trimming away all Fat and Internal Organs and discarding these Tissues before Cooking the Meat or making Soup. 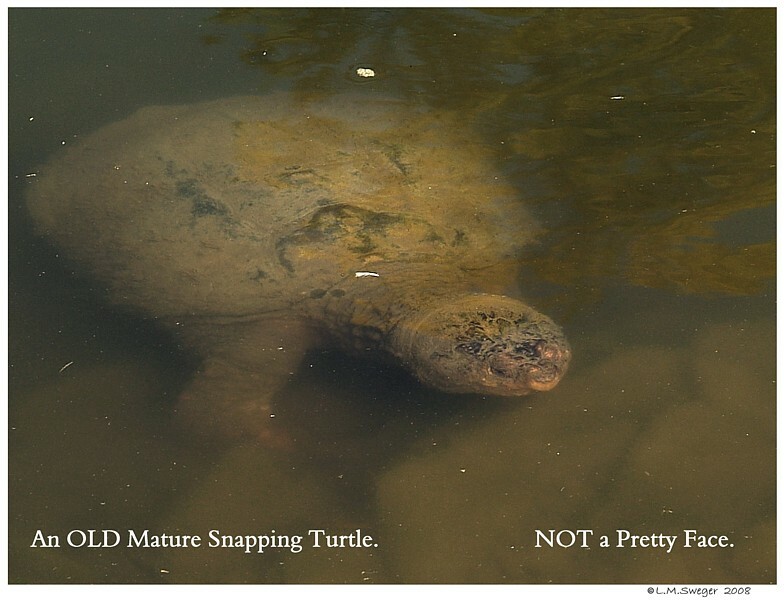 for more Snapping Turtle Consumption Information. Assault with a Turtle???? 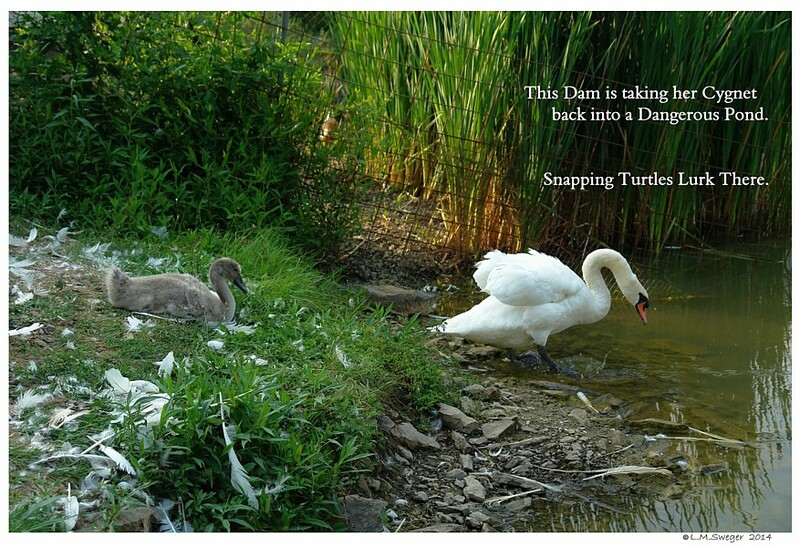 This is a Collection of Notes..
“The police use them (snapping turtles) to find drowning victims. They tie ’em on a line, and the turtle will lead ’em to the decomposing body every time. This is a Sad Work in Progress.. I Really DISLIKE Adding to it. 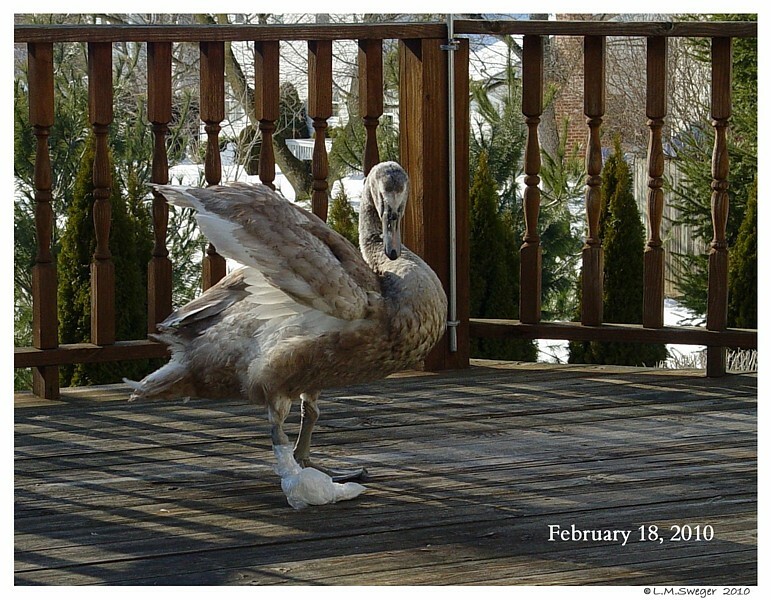 The Following Photos Tell their Own Stories. 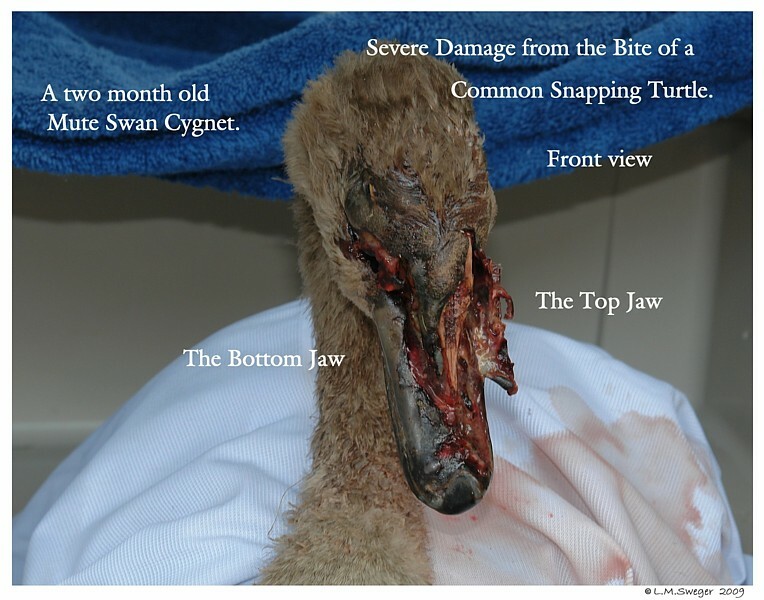 This Sweet Gentle Swan had the Damaged Beak for the Duration of her Life. 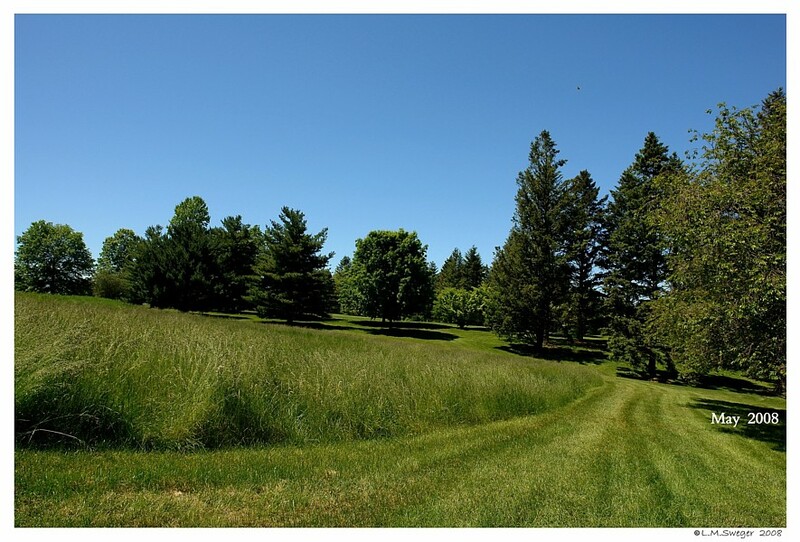 Grassy Plants would get Caught in the Cut. 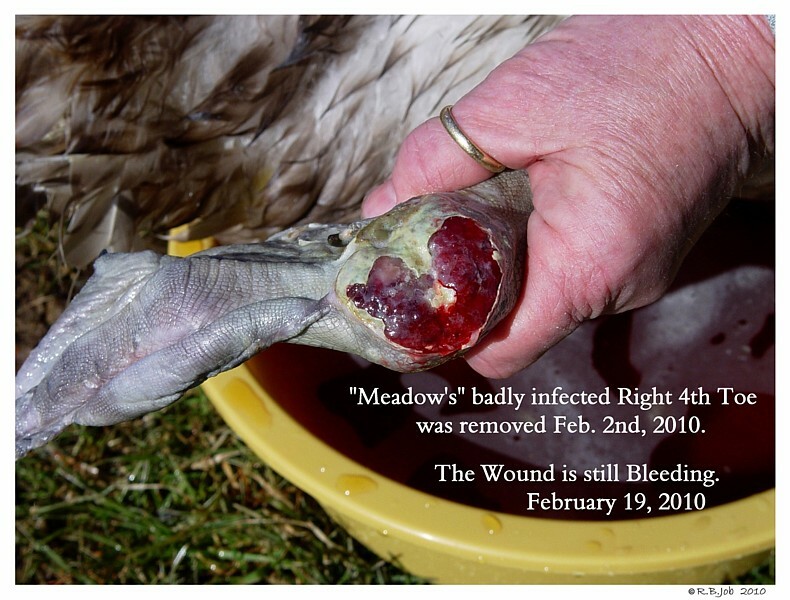 “Meadow” and the Nasty Snapping Turtle Bite. 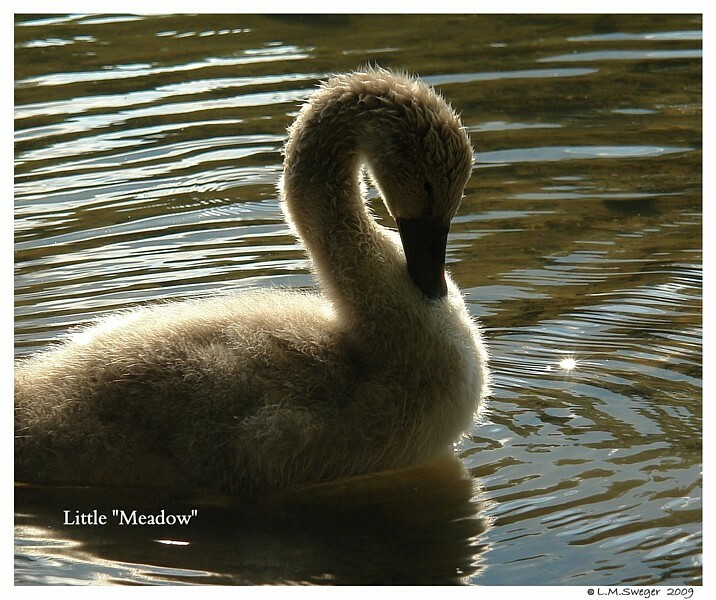 Young Mute Cygnet – Just Four Weeks Old. Life was Good. 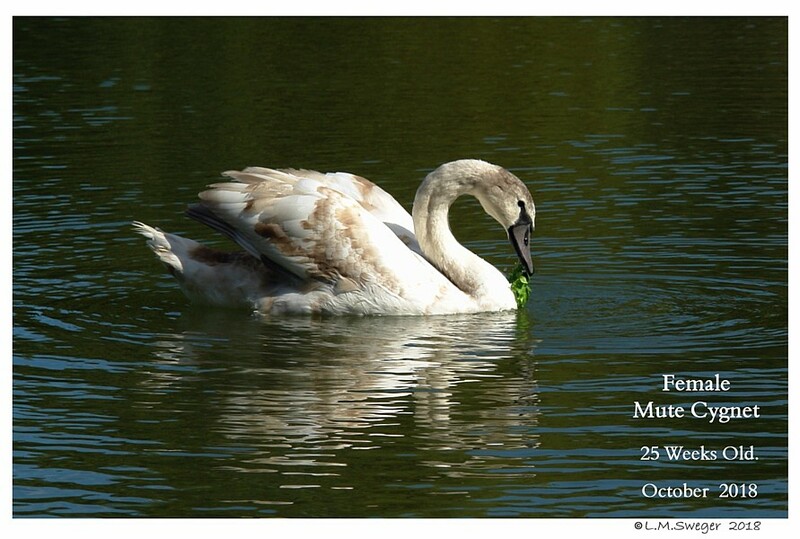 …For a Few More Days. 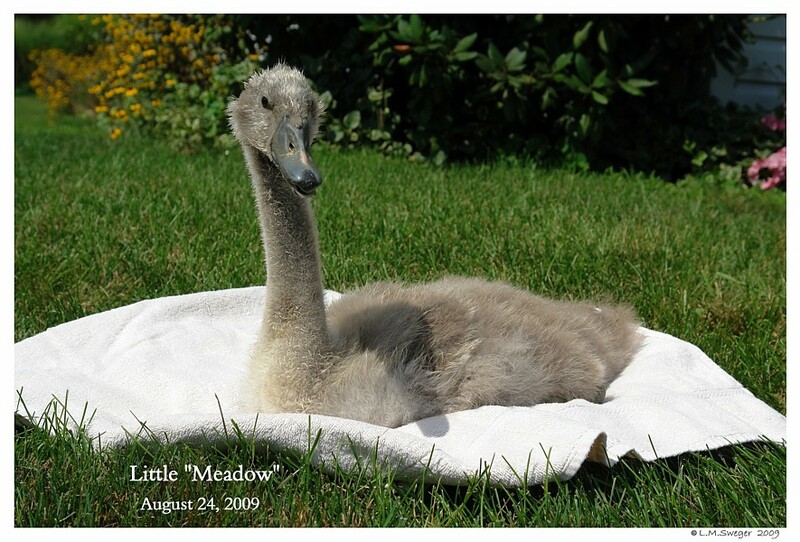 Rescued at 40 Days Old.. 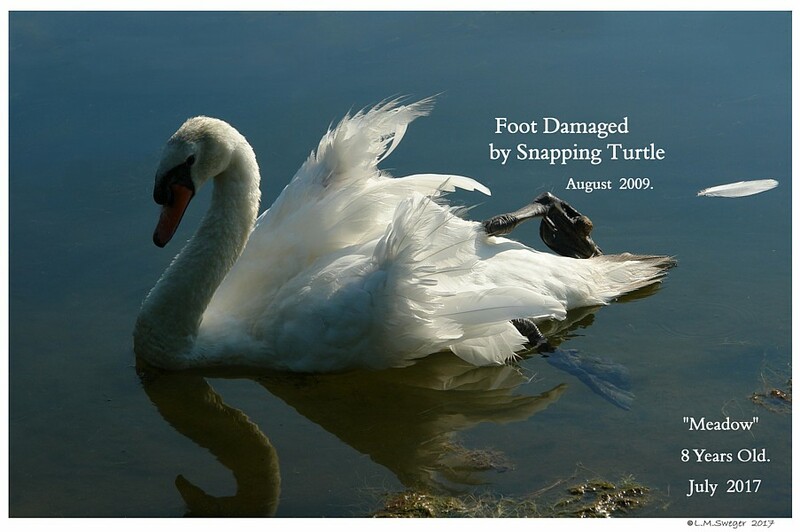 Right Foot Badly Injured. 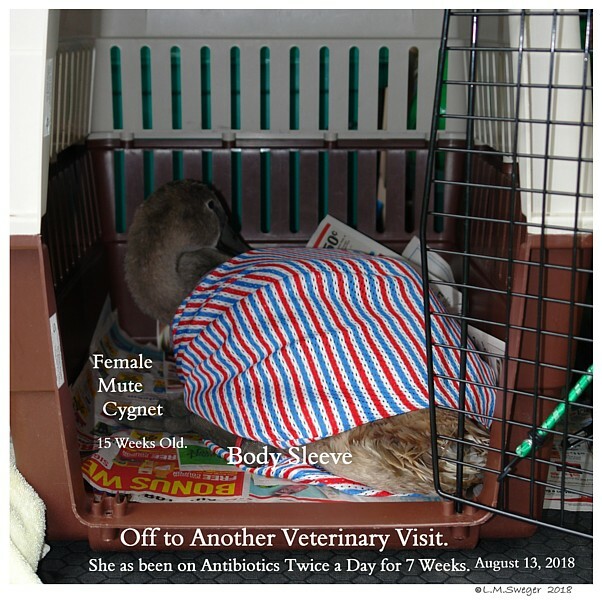 Many Veterinary Visits and Antibiotics. 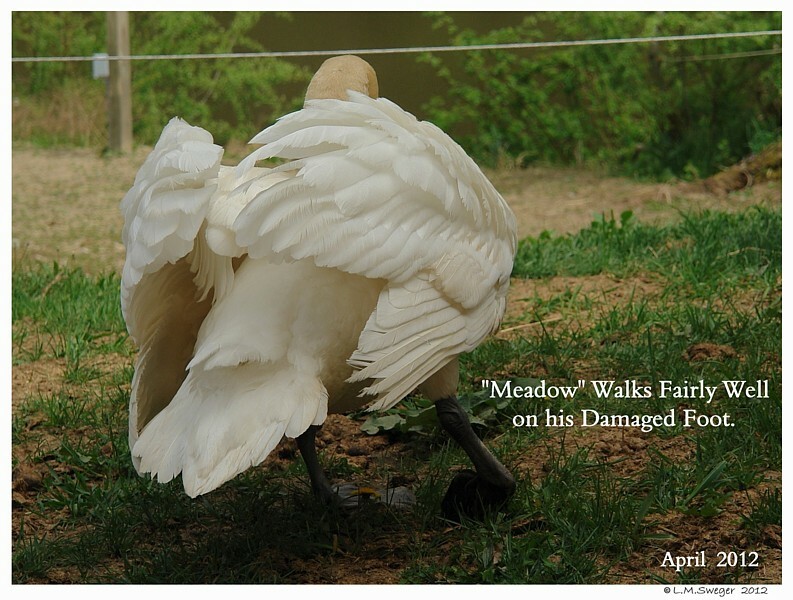 We can not put a Brace on his Injury. 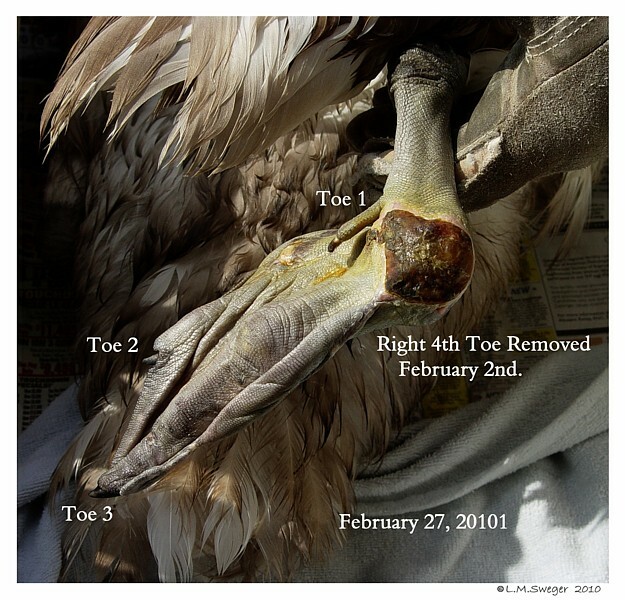 After Six Months his 4th Toe became Infection. 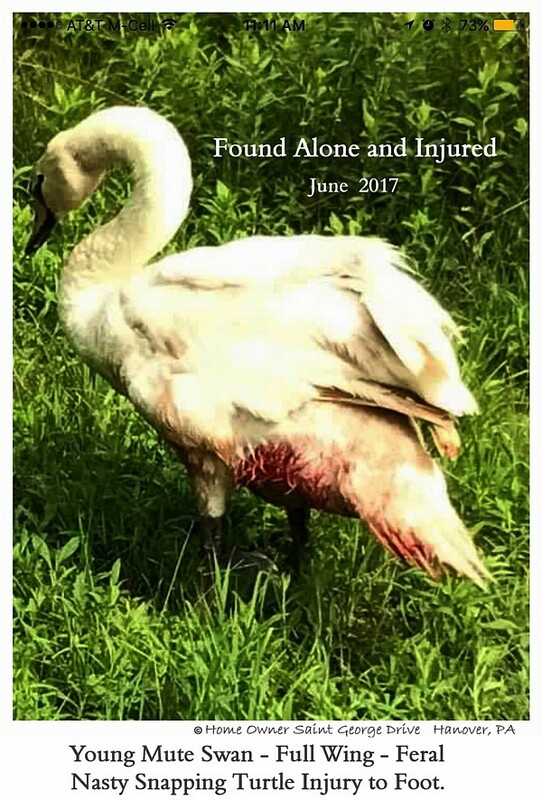 Within Days it had to be Removed. Soaking and Wrapping EVERY Day. 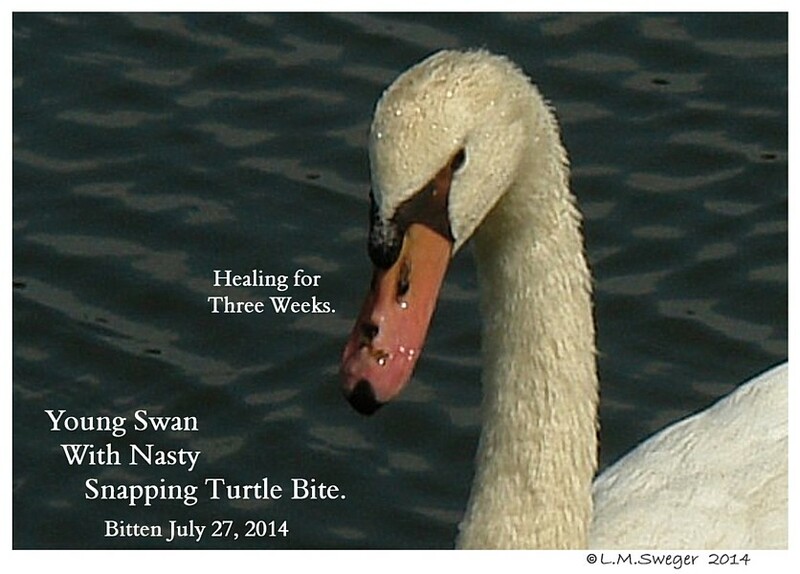 It is SIX Months since he was Bit. I Cringe Every Time I See his Foot. 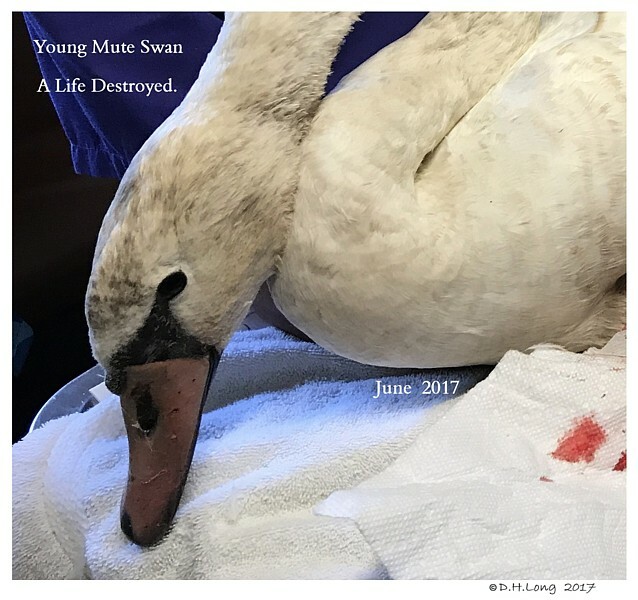 Our Male Swan is doing FAR Better then we had Hoped. 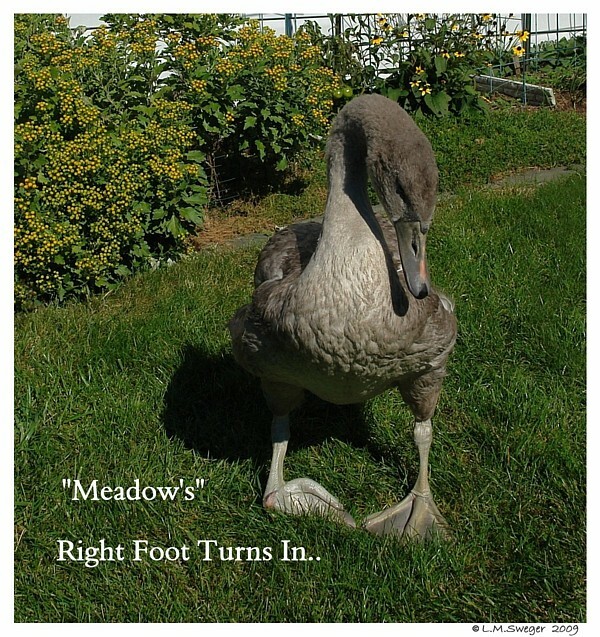 Rescued in August of 2009 – “Meadow” is NINE Years Old. A lots of Work.. Worth Every Minutes. 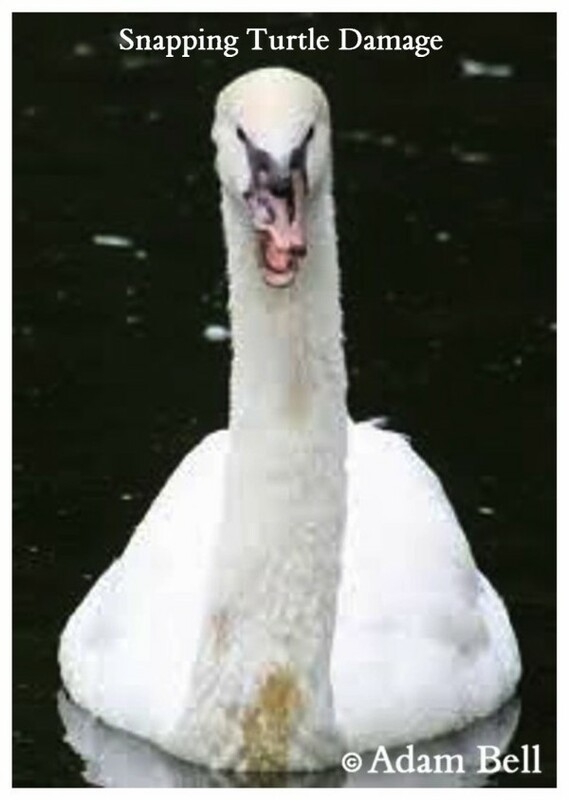 She is a Very Lucky Swan.